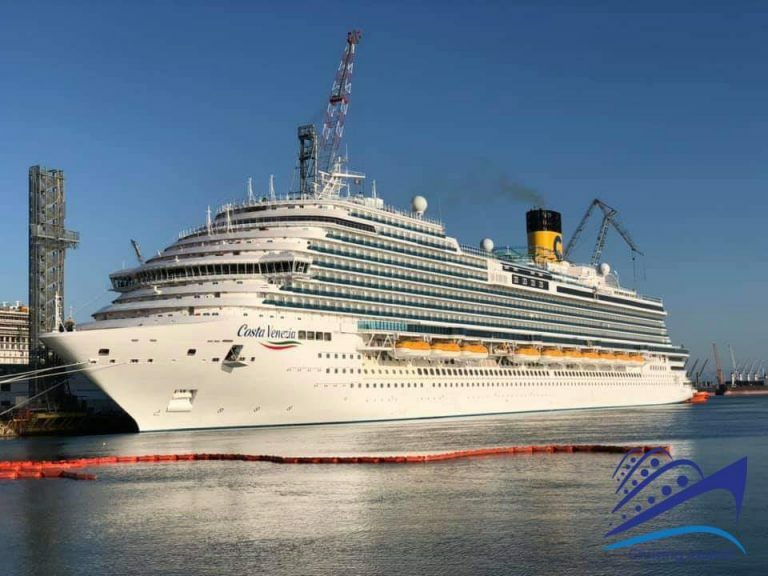 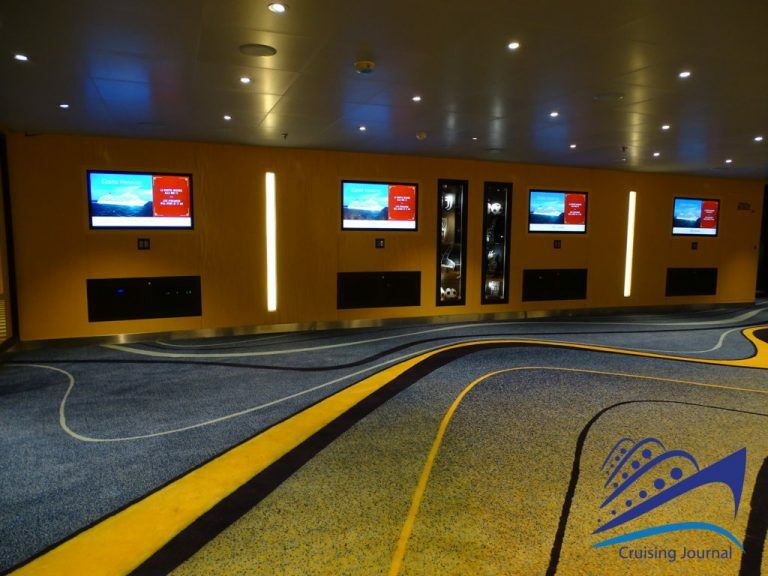 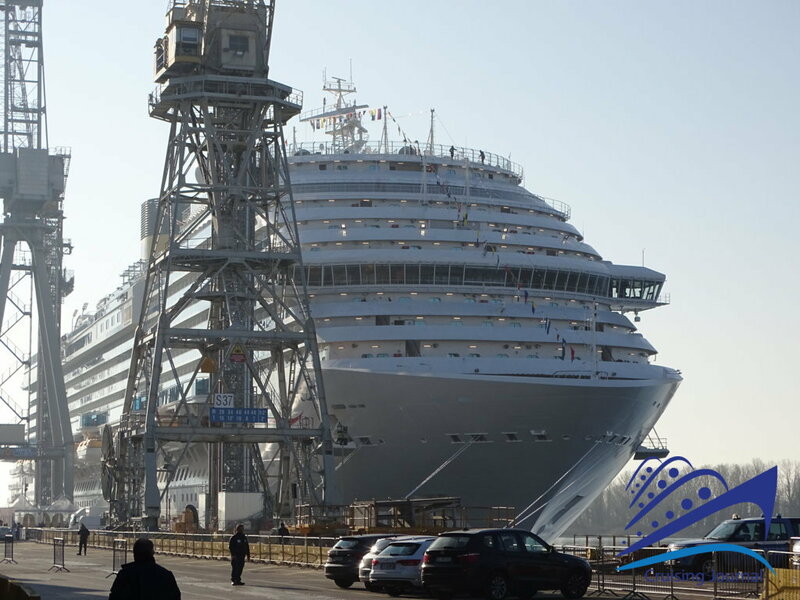 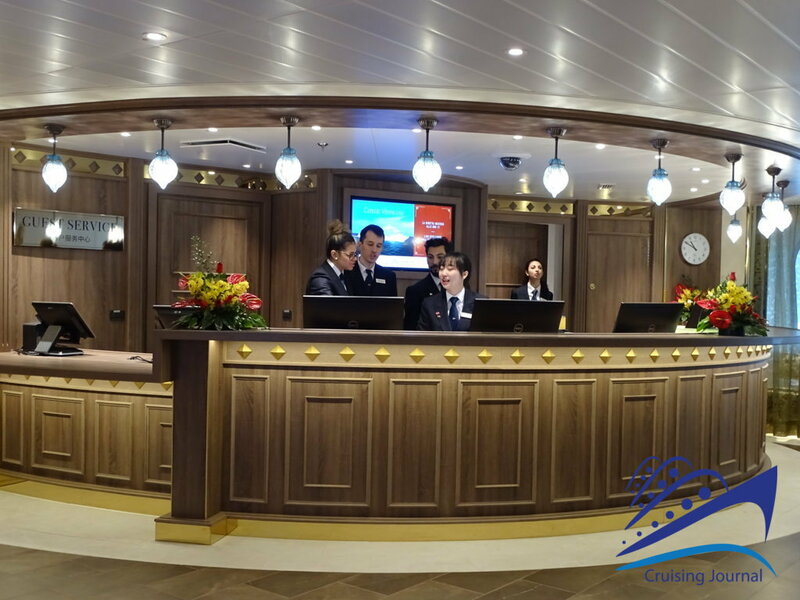 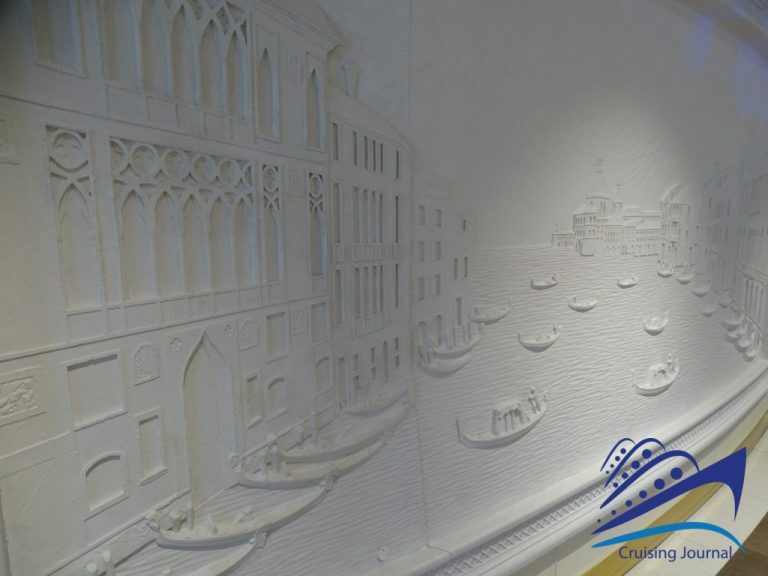 The latest arrival of Costa Cruises is a ship in the Vista class dedicated to the famous Venetian city: Costa Venezia. Built by Fincantieri in Monfalcone, it was delivered on February 28th, 2019 and baptized in Trieste with an exciting show by the Italian Air Force aerobatic demonstration team. 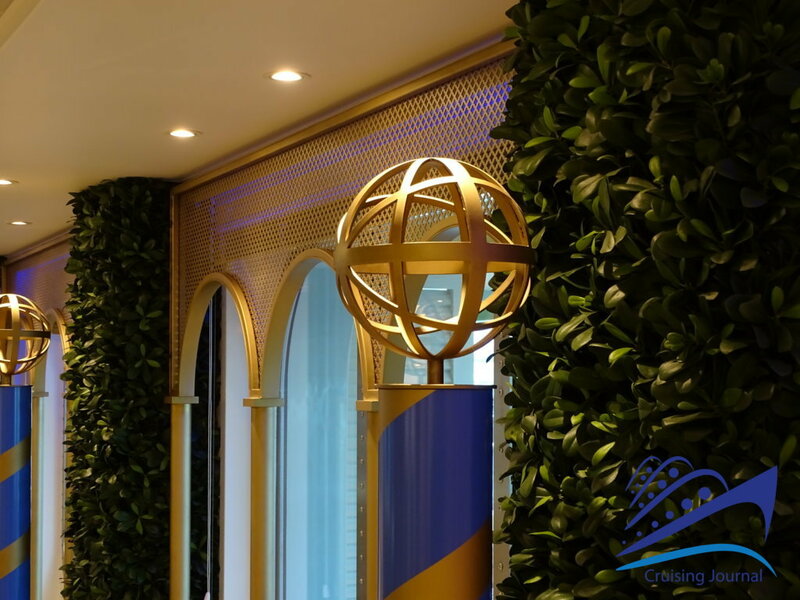 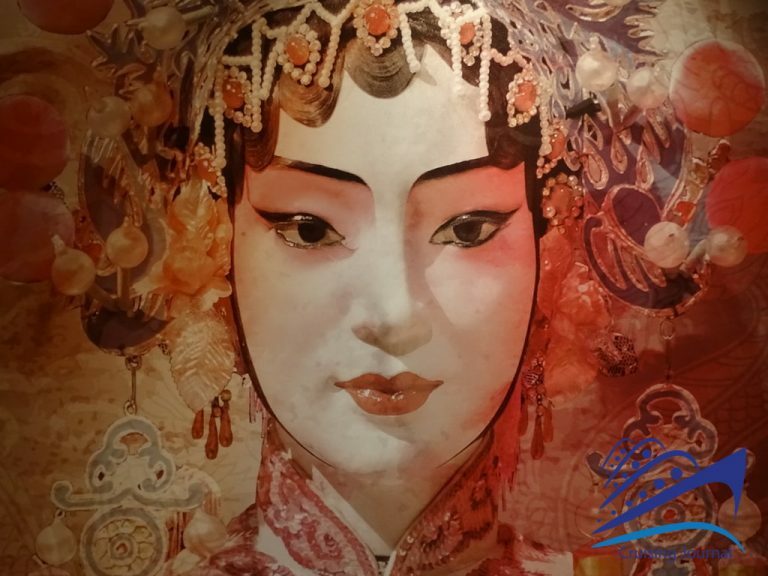 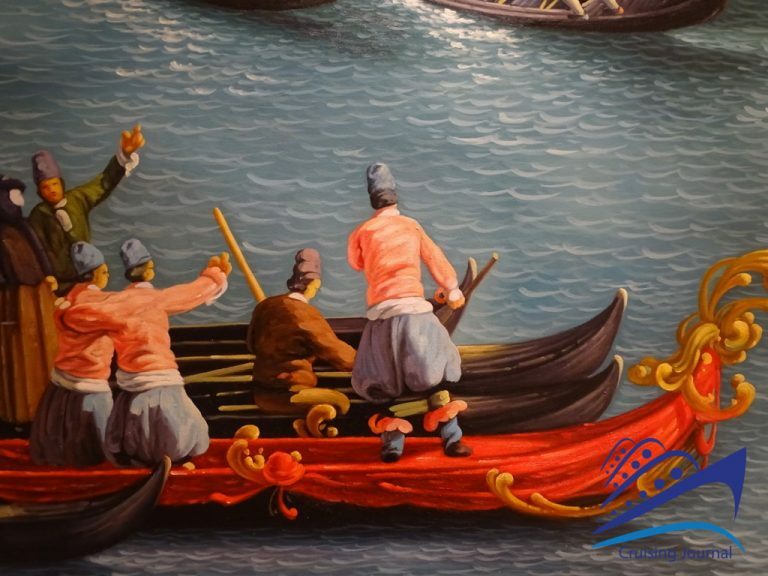 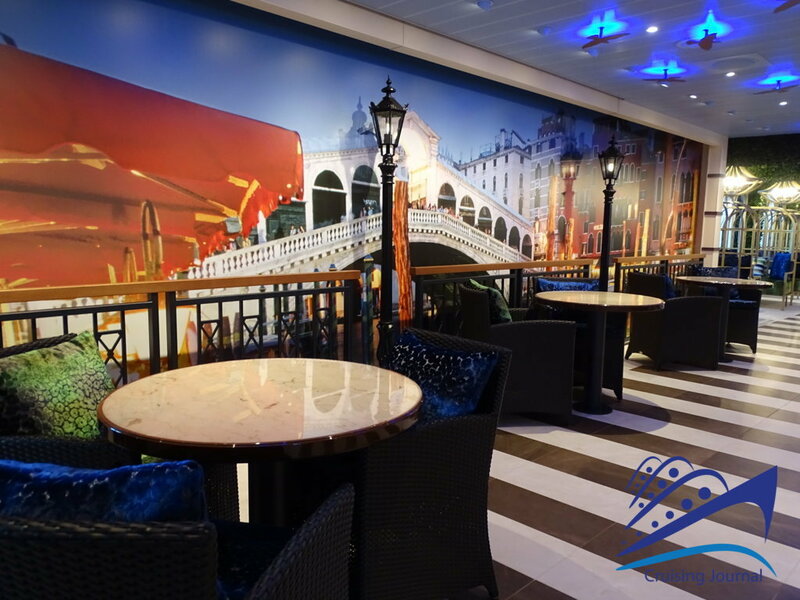 Costa Venezia is dedicated to the Asian market, and the decor was selected to pay homage to Venice, although far from the lagoons, exhibiting the beauty of the city and of Italian style in general. The interior design is therefore completely dedicated to the art and architecture of the city of Venice. 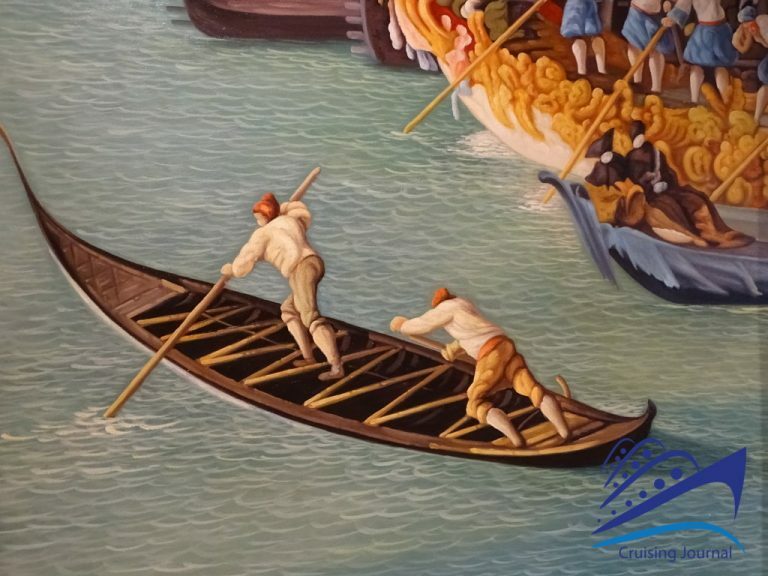 The names of the various areas recall spaces and places of Venice, such as two large authentic gondolas that transport us into the atmosphere of the canals. 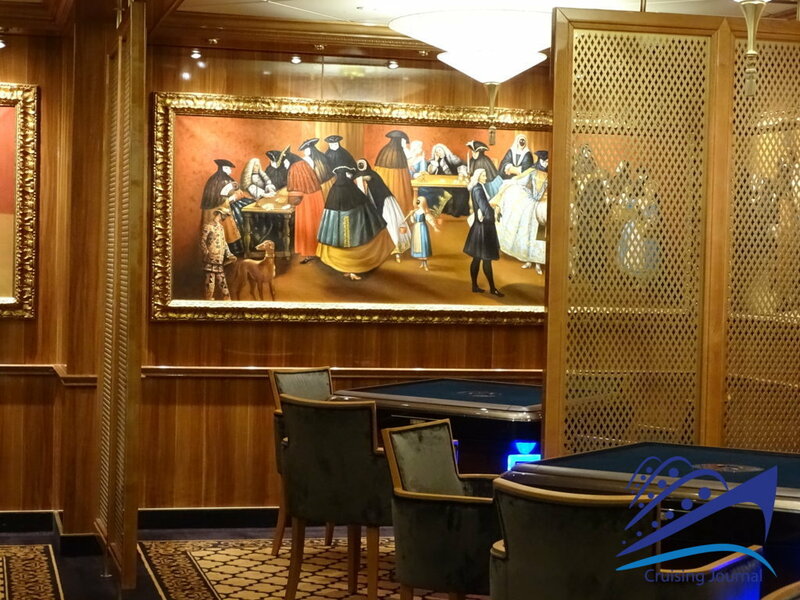 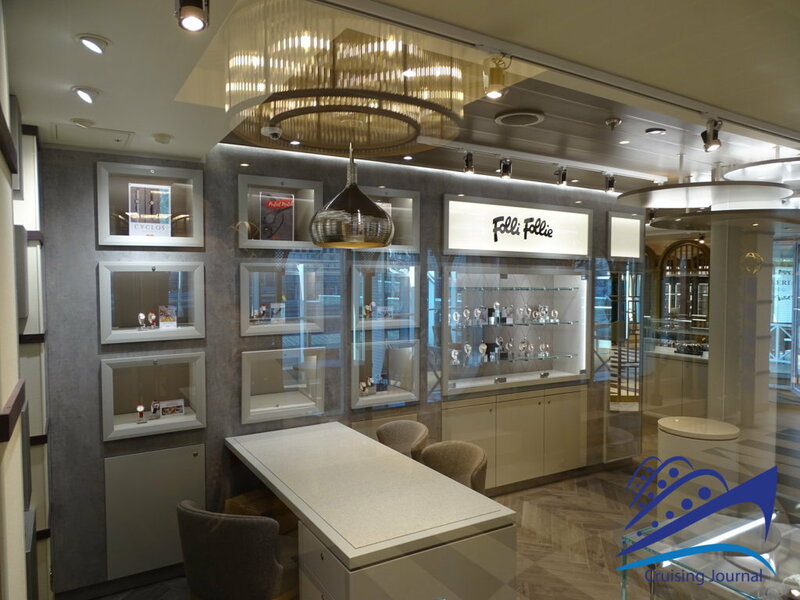 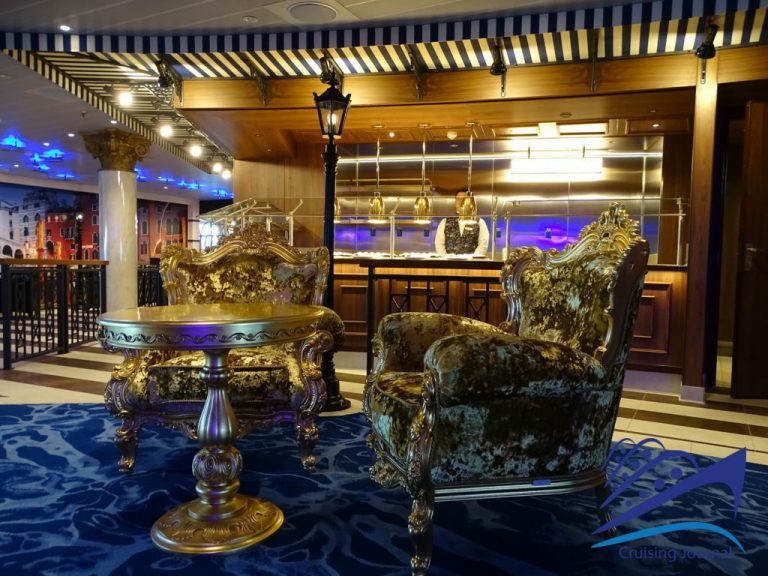 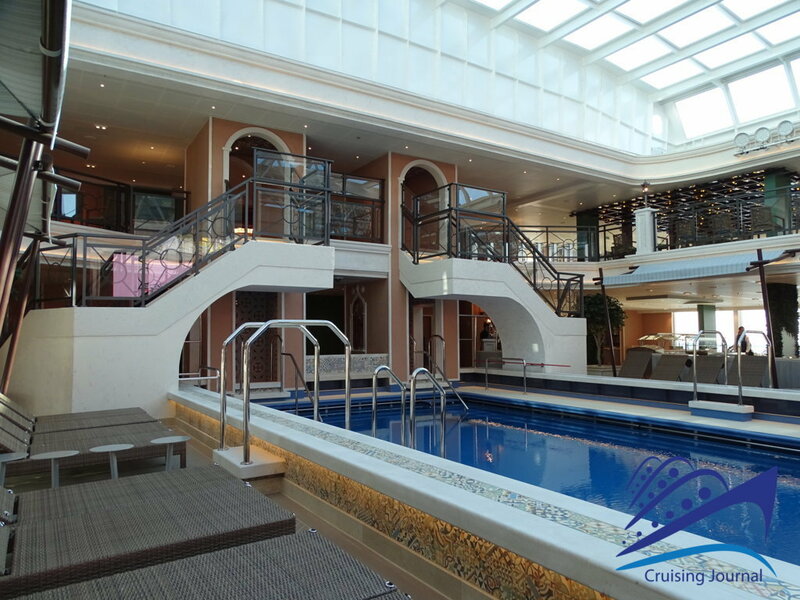 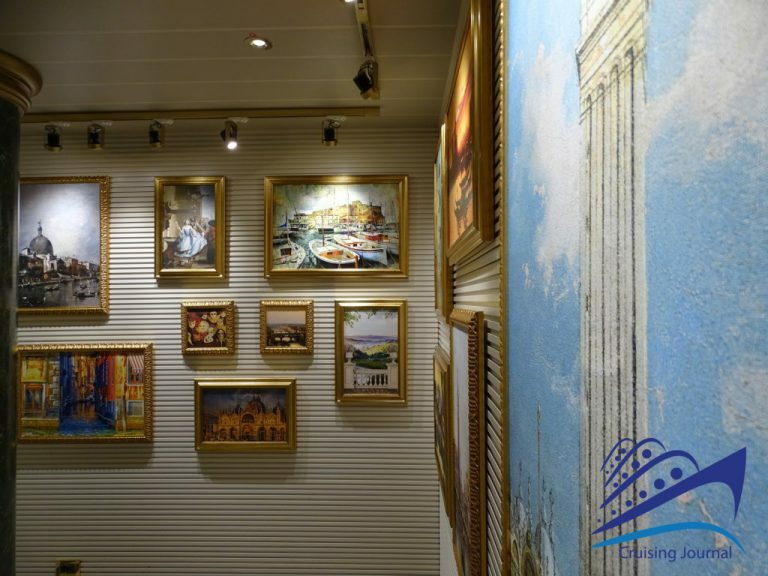 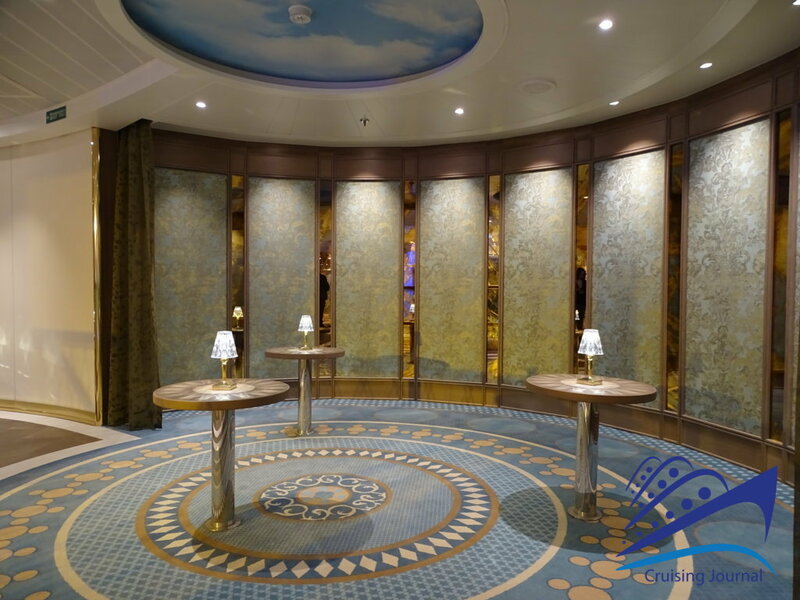 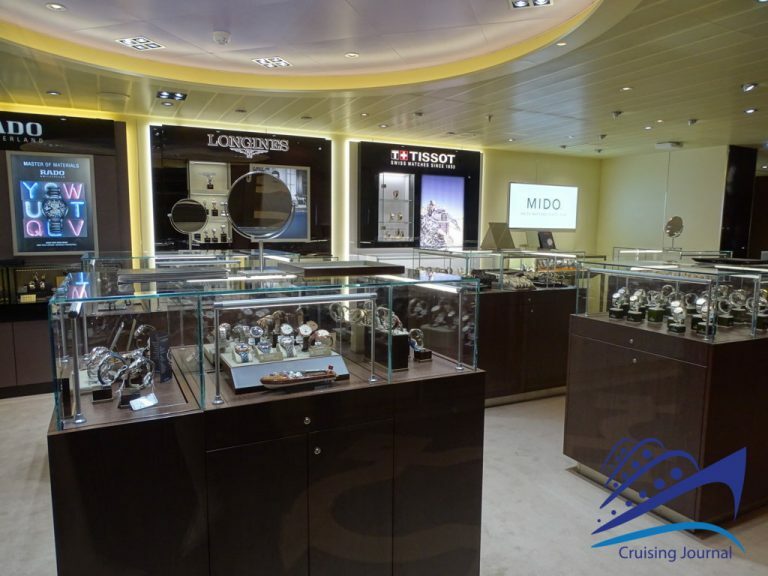 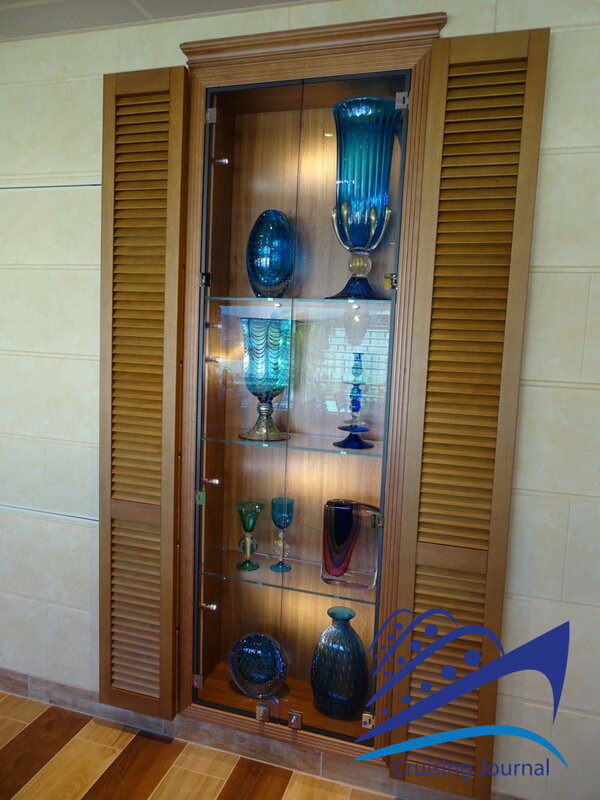 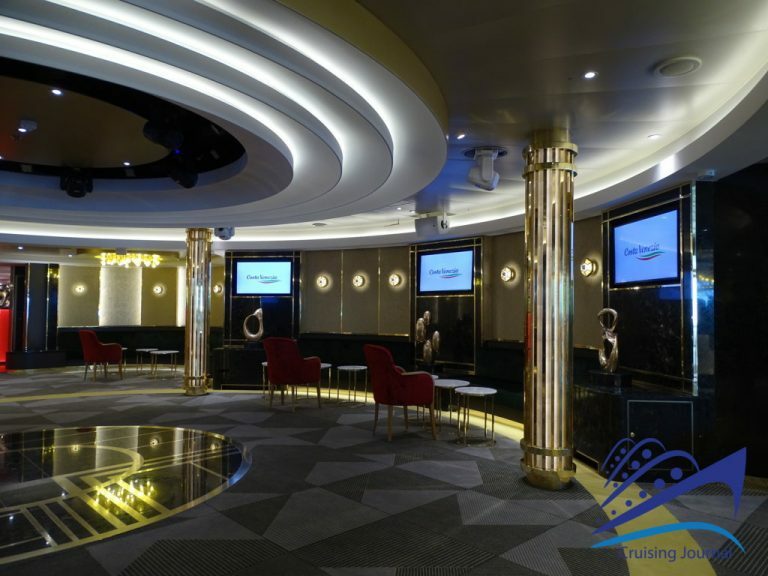 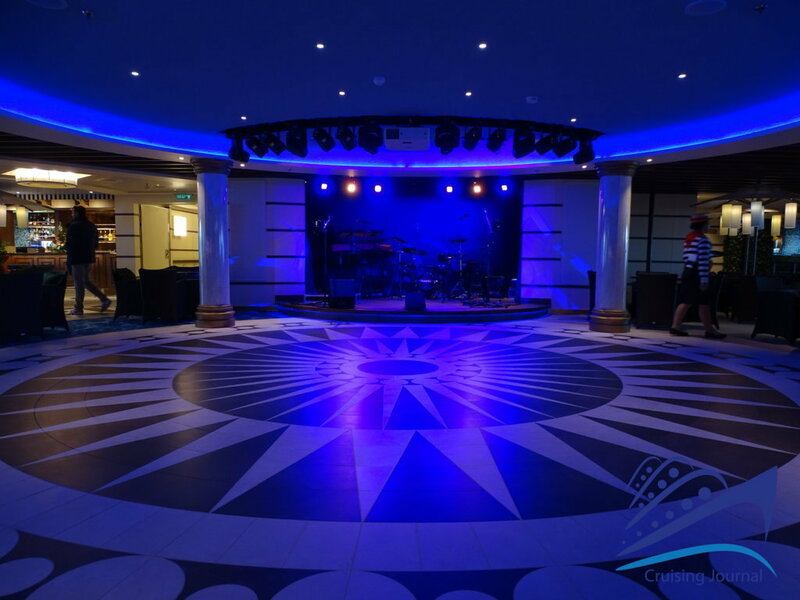 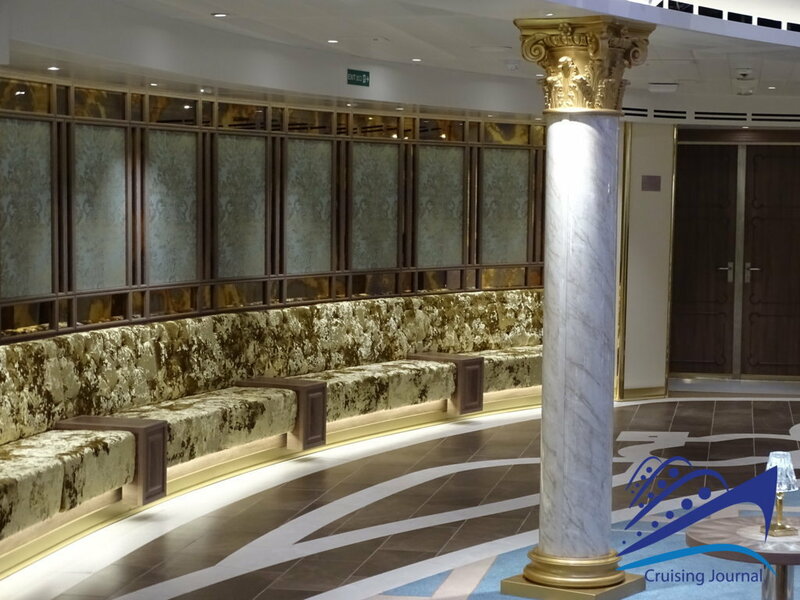 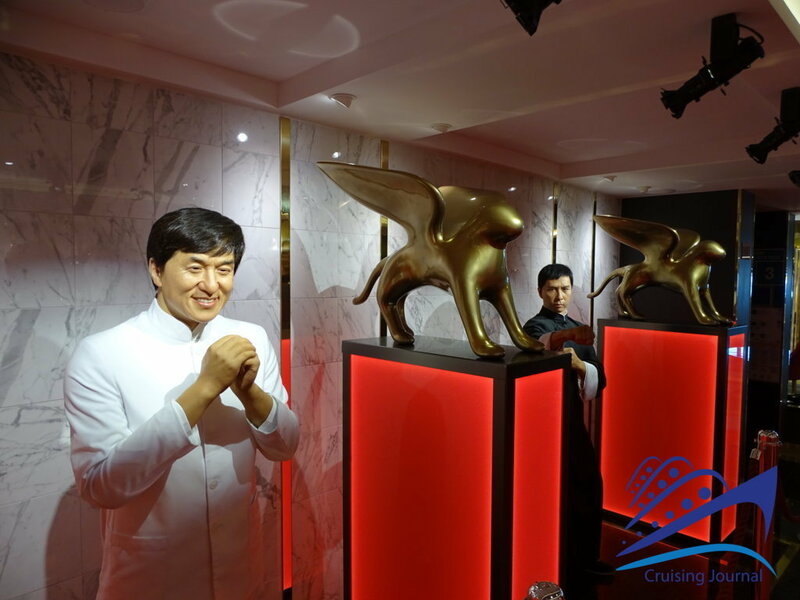 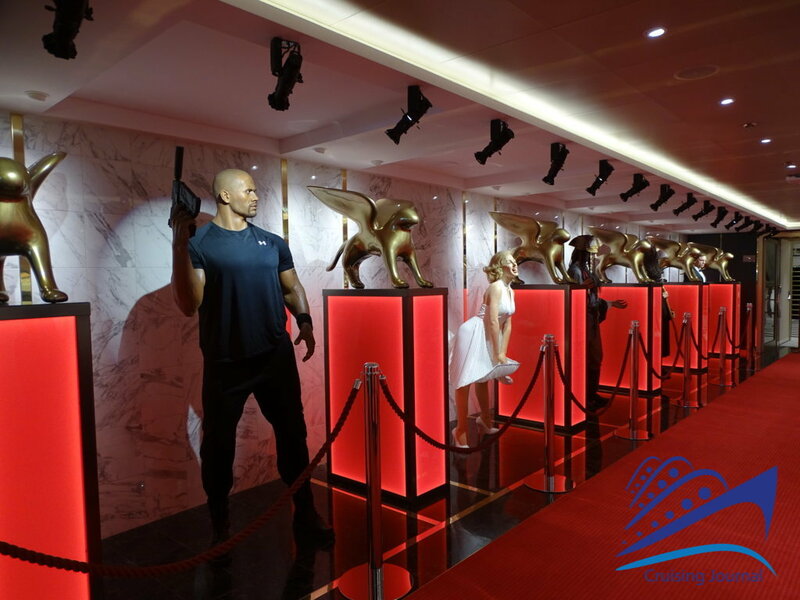 The gallery of celebrities, at the stern of deck 5, is outside the generally elegant and refined environment. 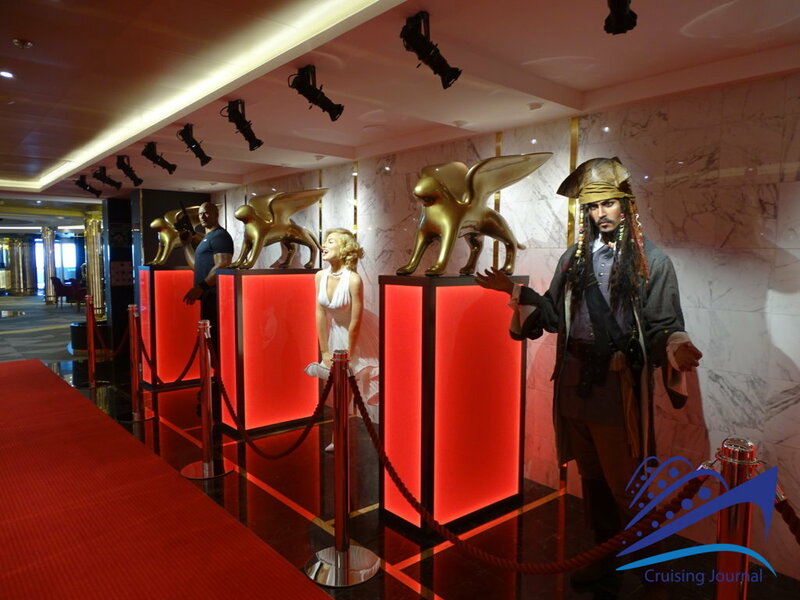 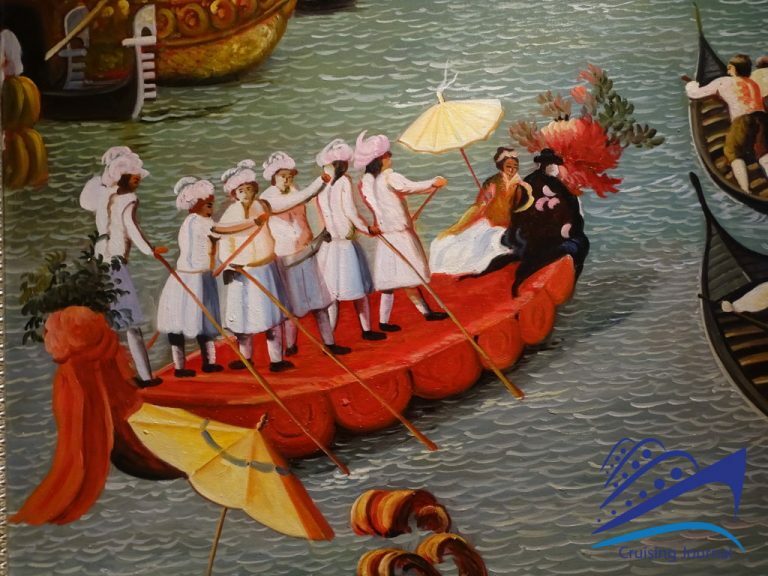 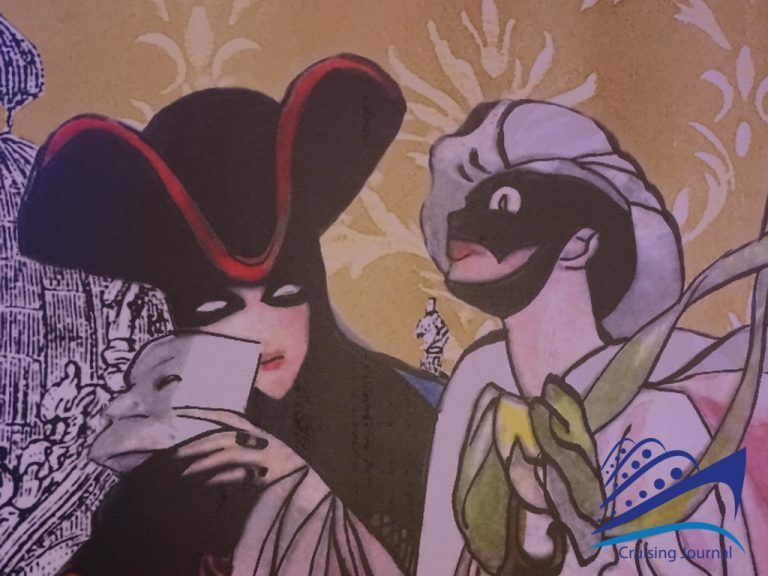 Here some reproductions of famous people from show business break with the theme of the city of Venice and the surrounding style, unless they intended to bring to mind the film Festival. 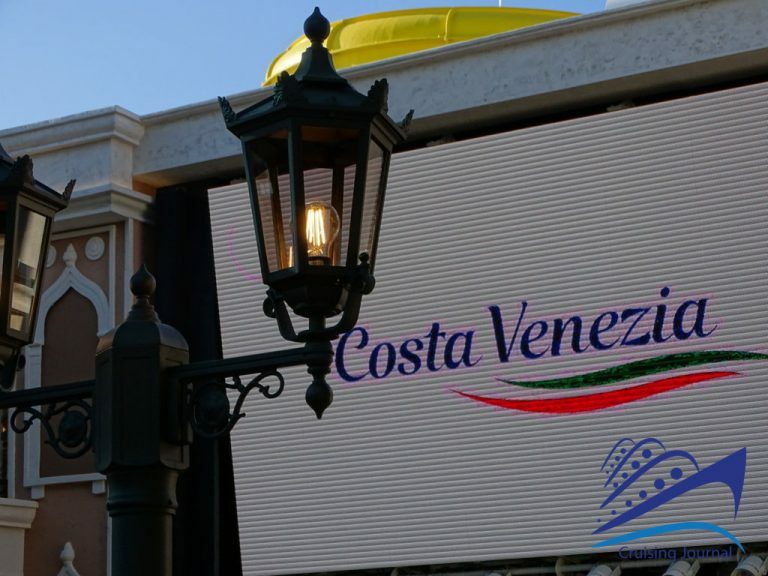 Let’s explore in detail the beautiful Costa Venezia, starting from the communal areas to then move to the external areas and the unique and varied restaurants. 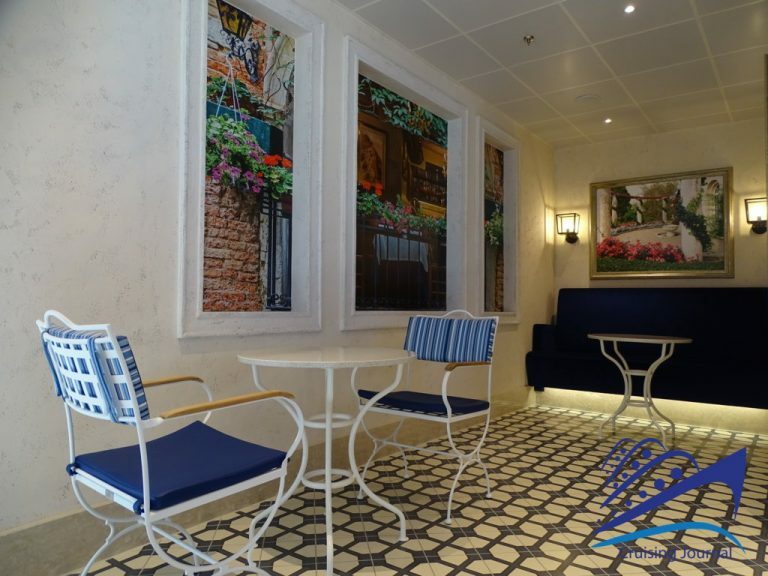 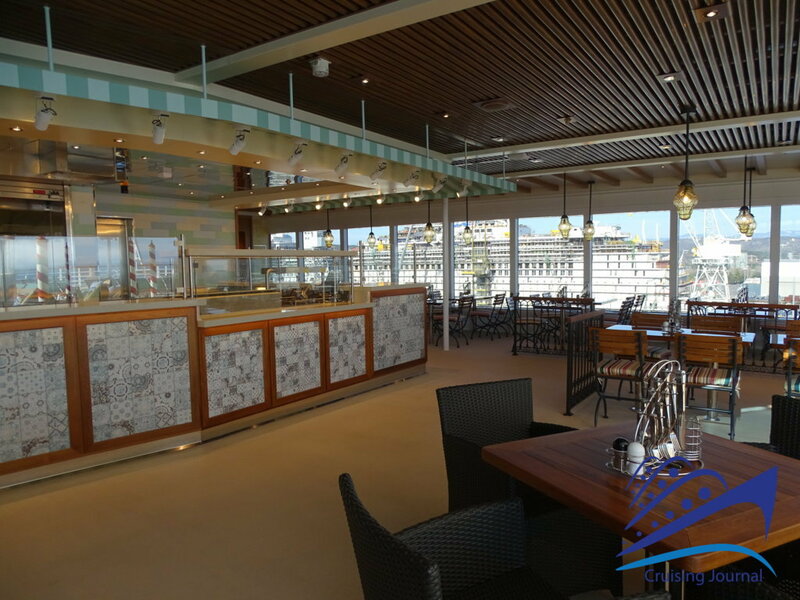 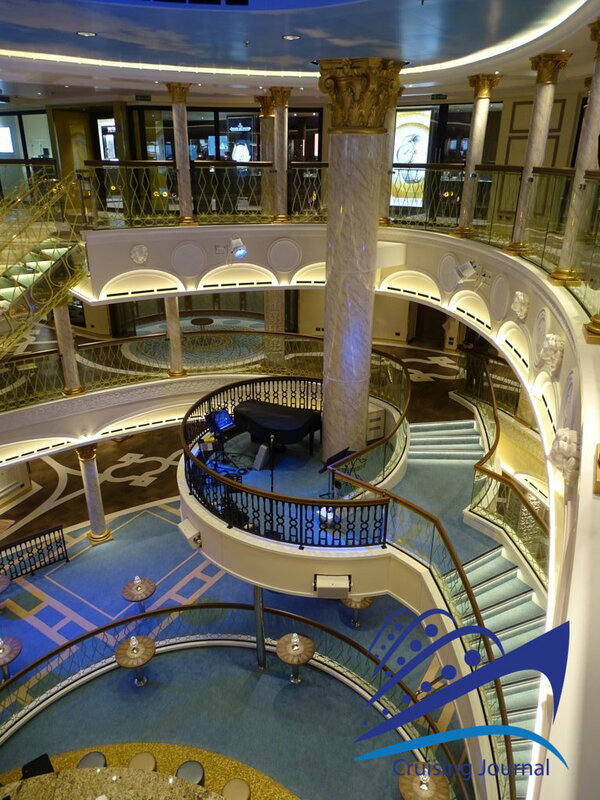 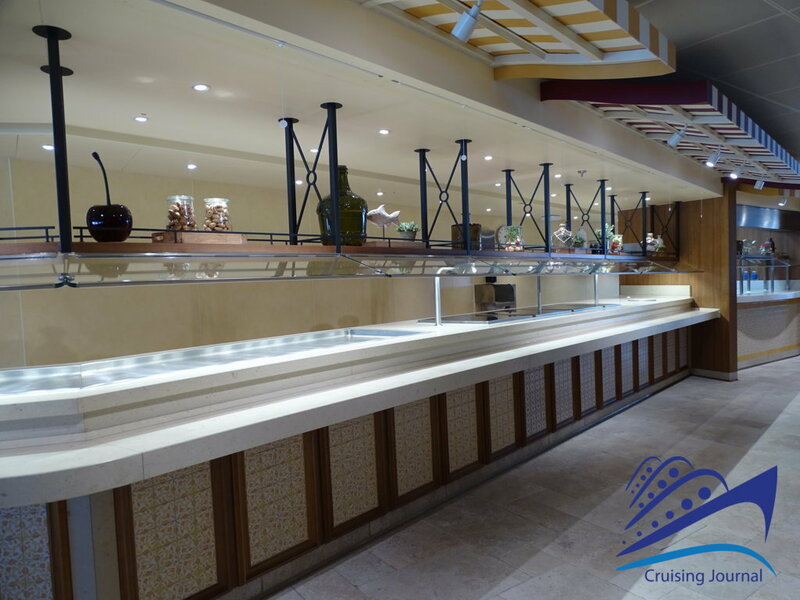 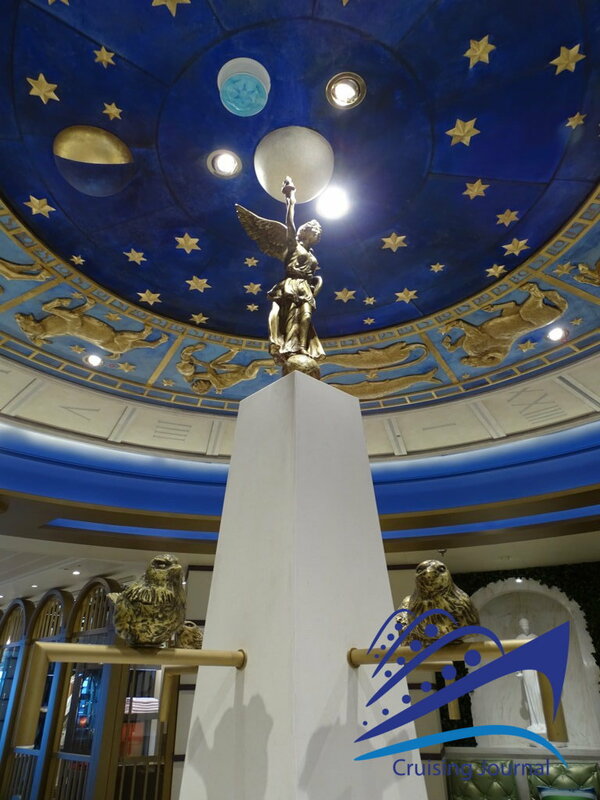 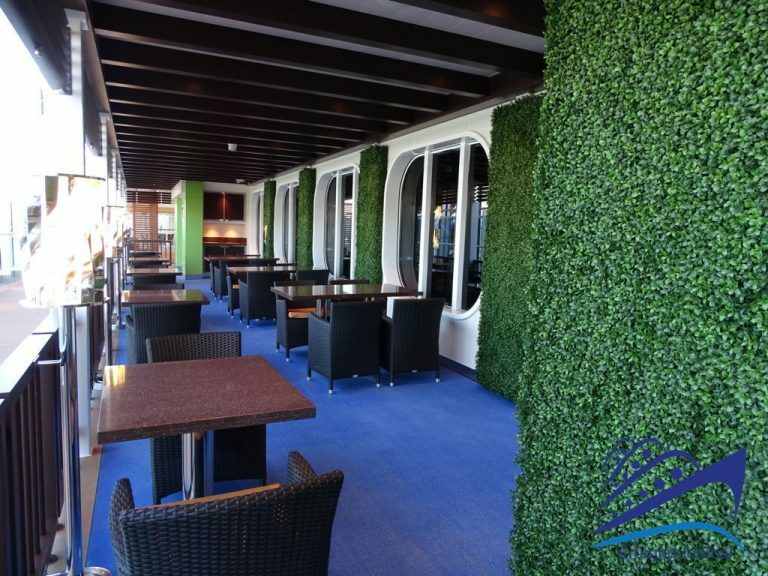 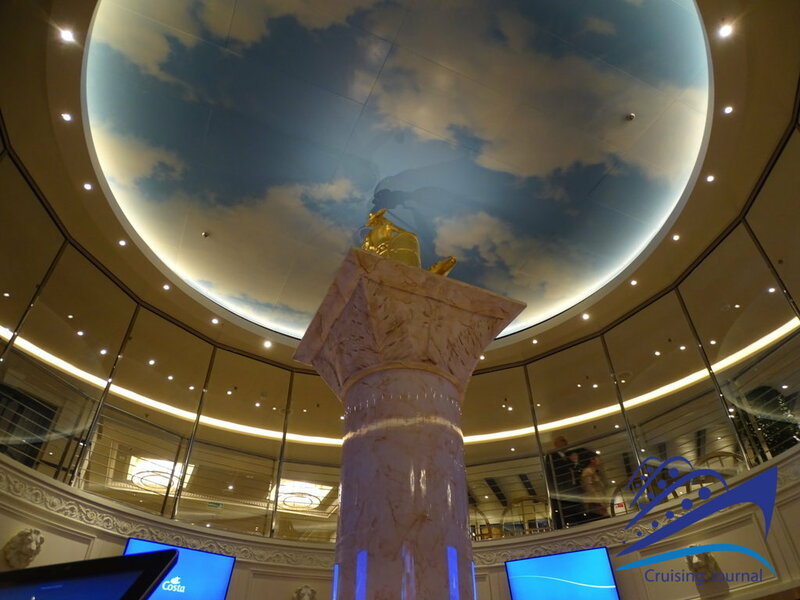 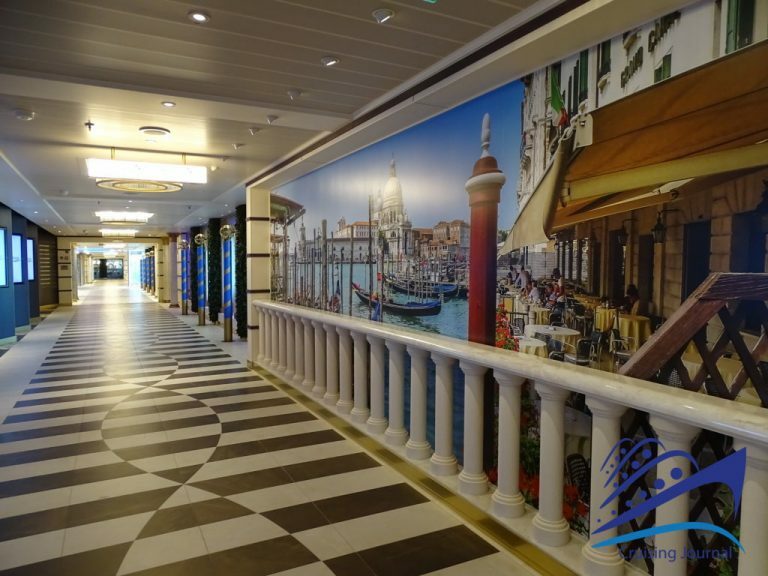 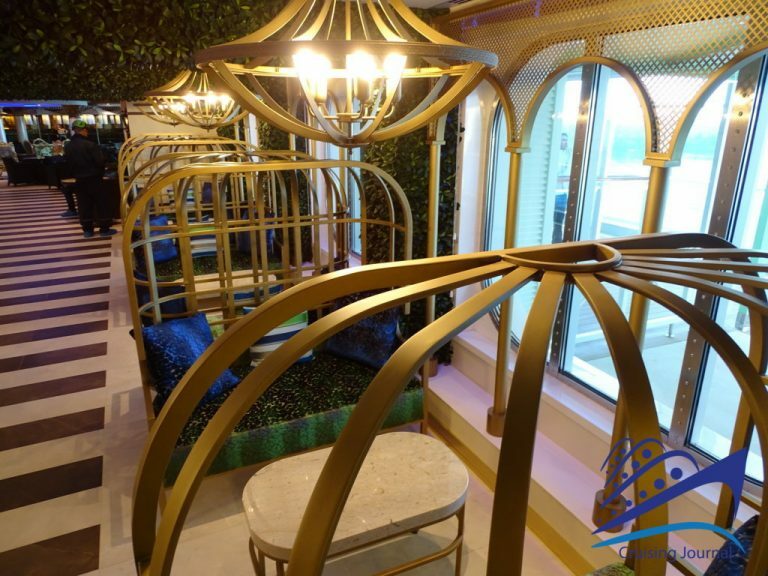 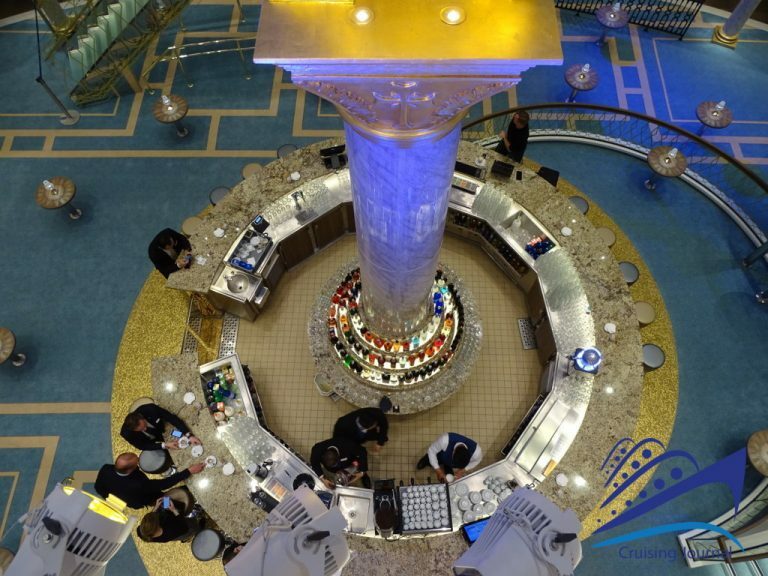 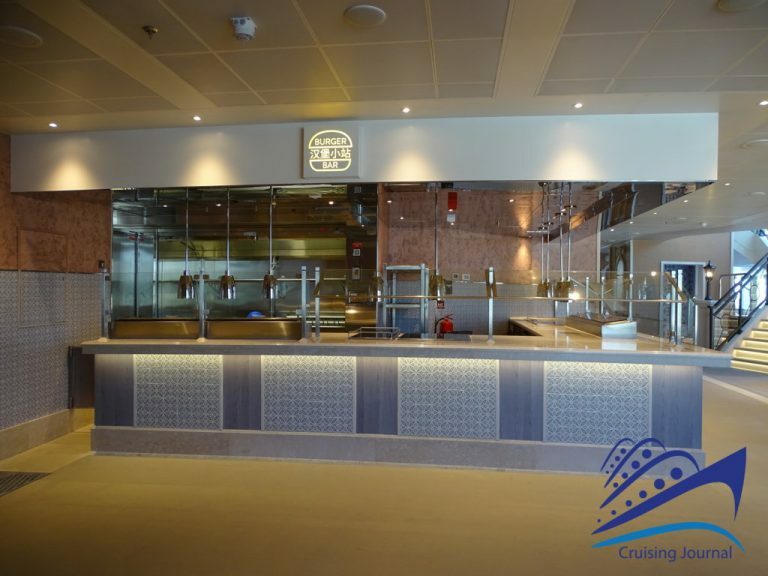 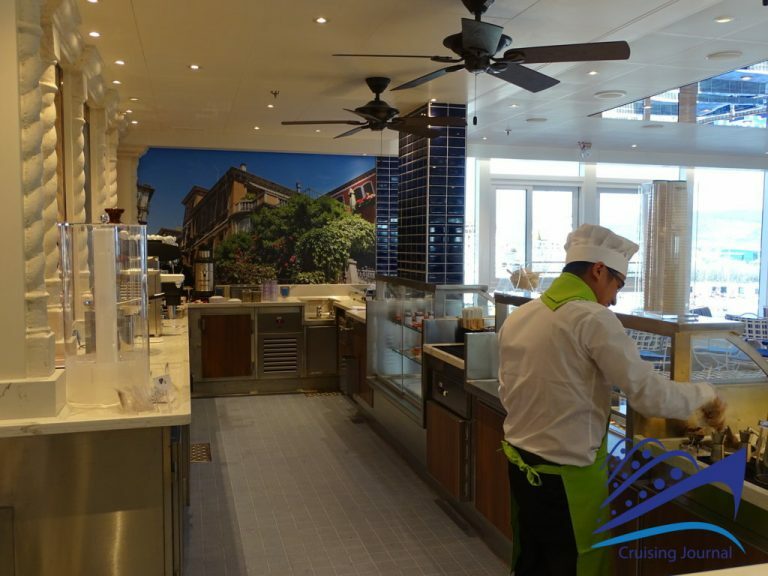 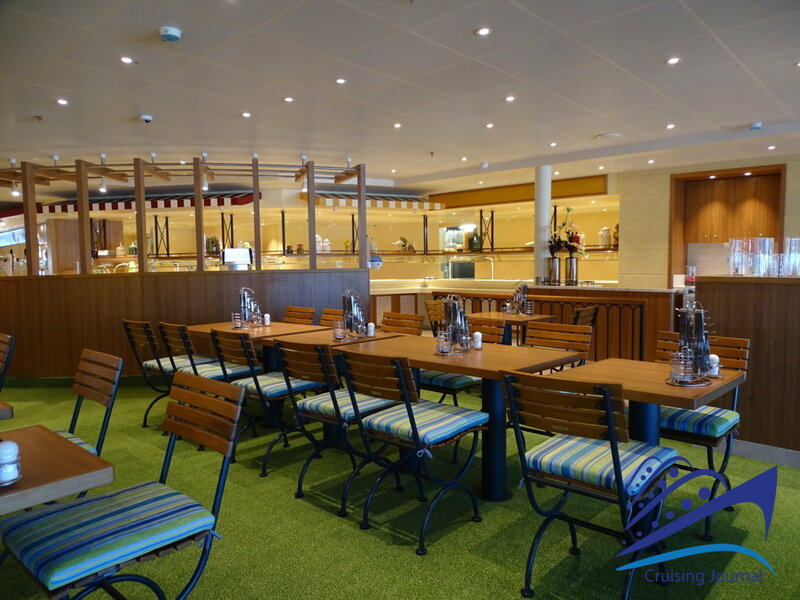 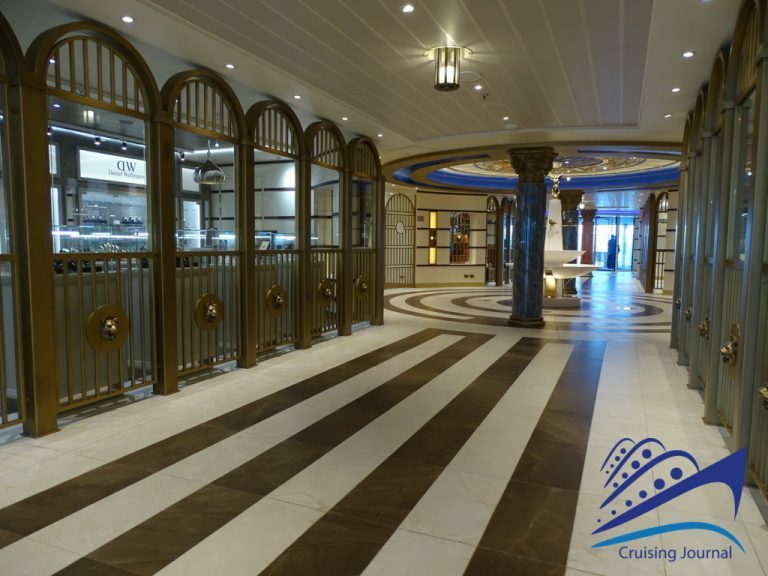 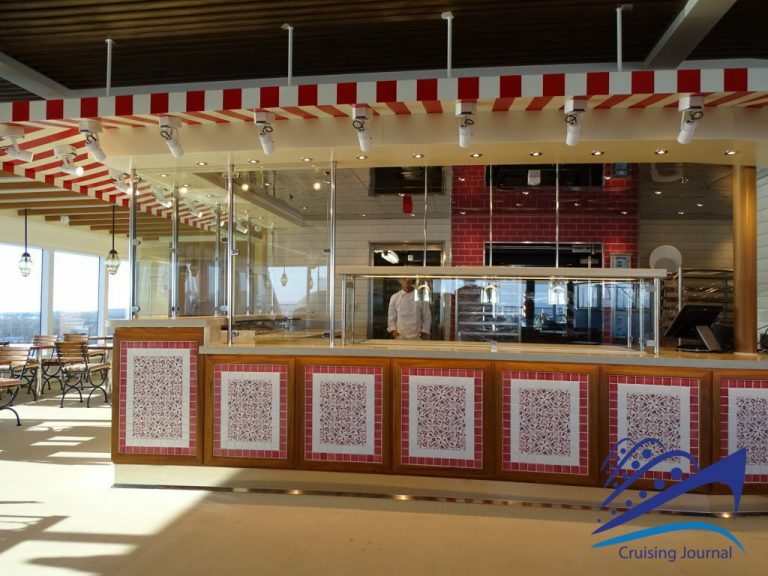 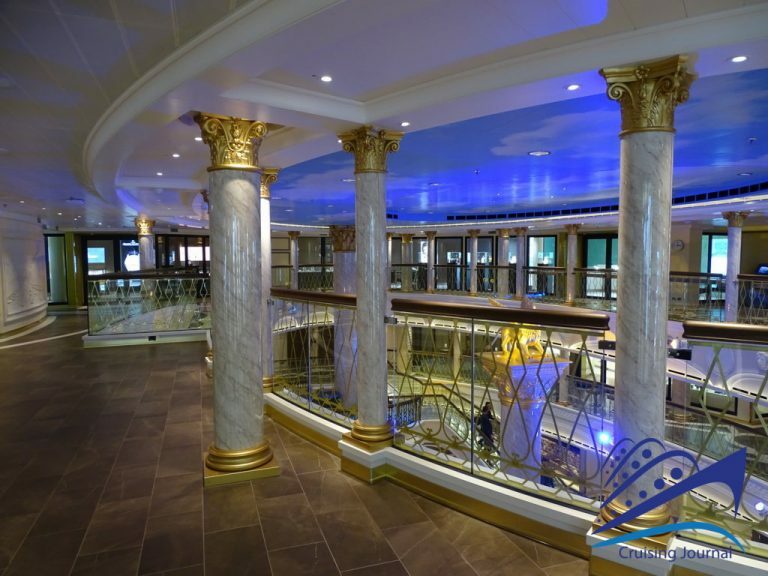 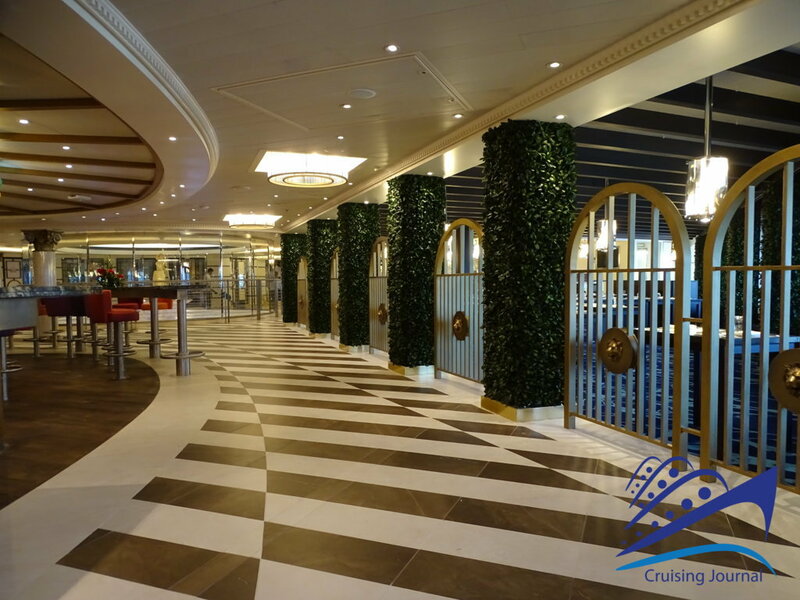 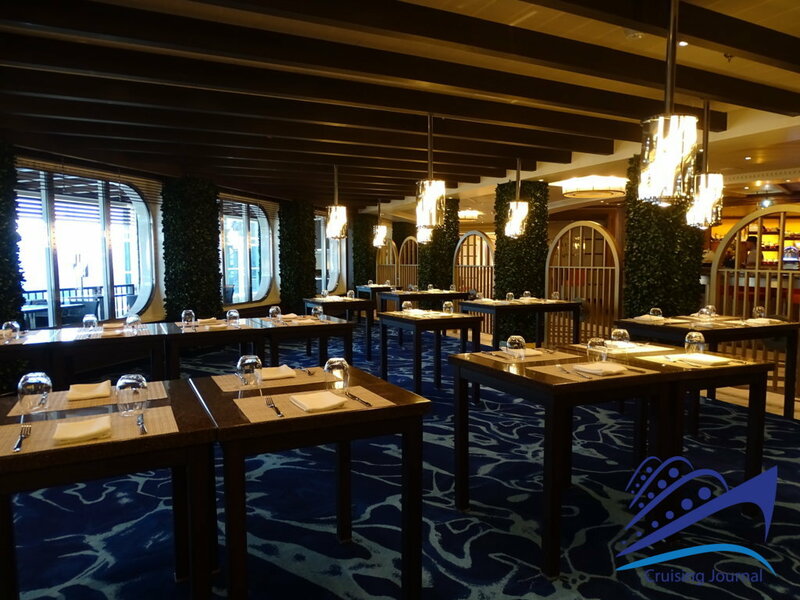 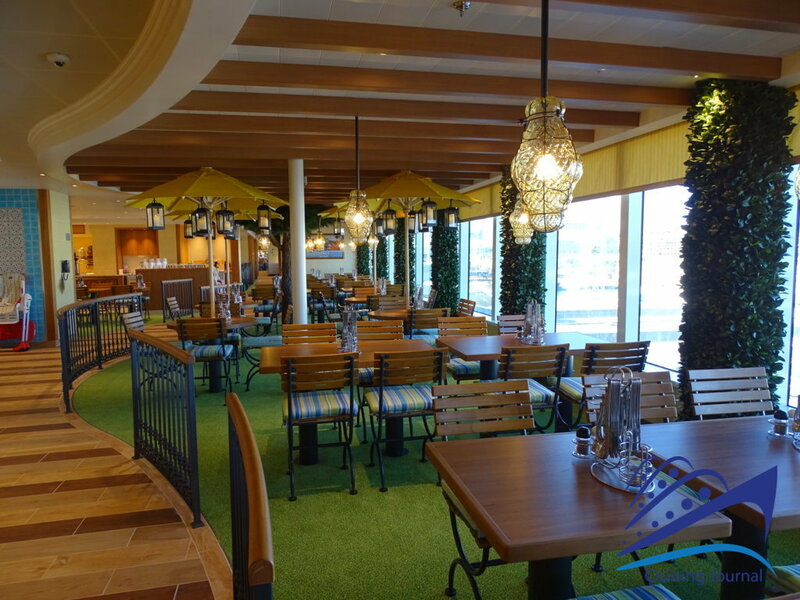 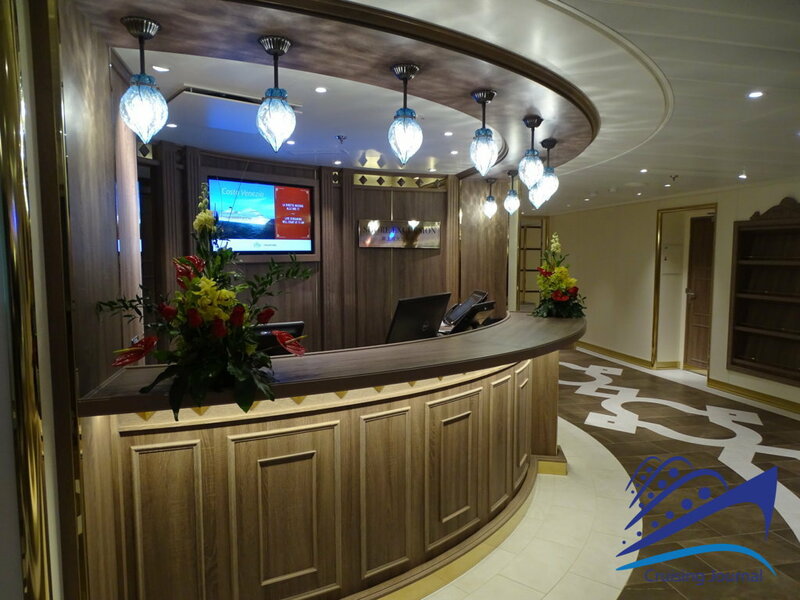 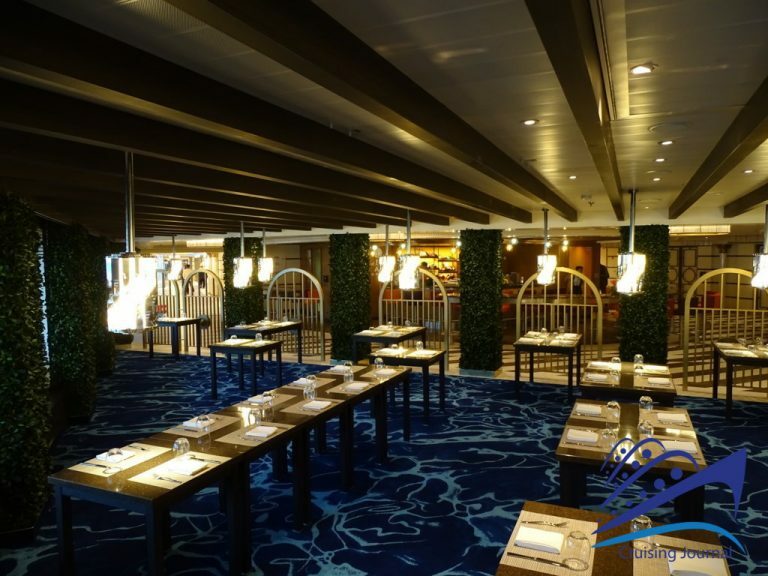 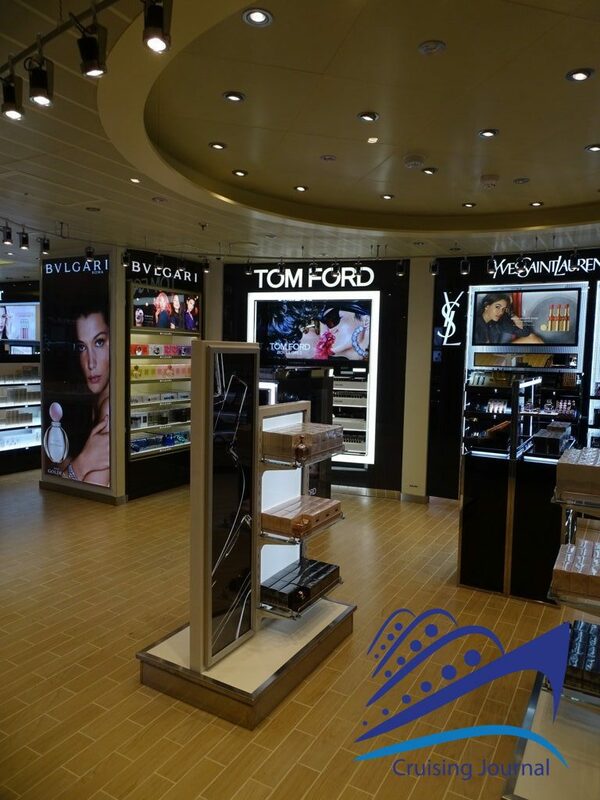 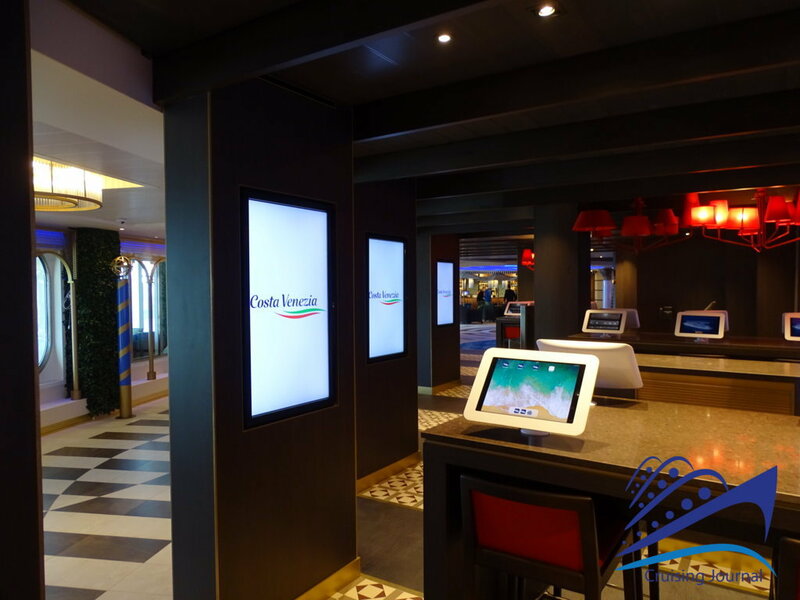 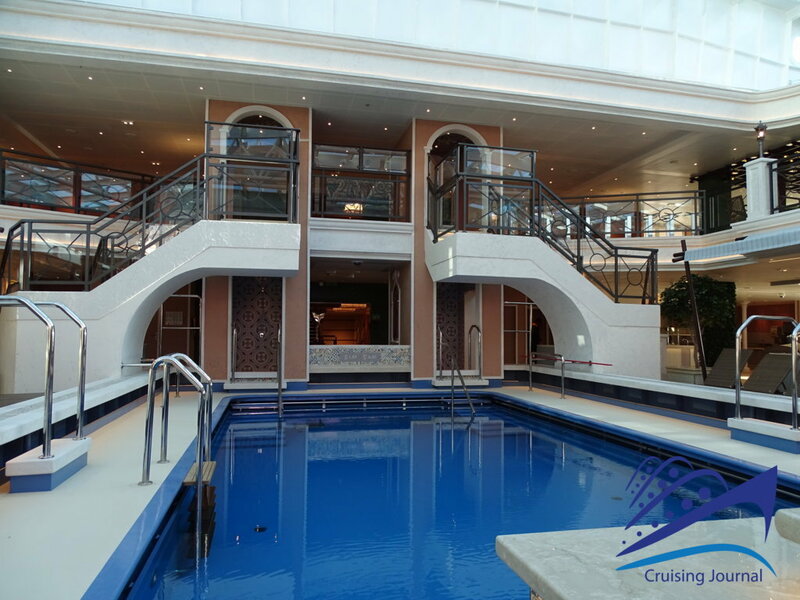 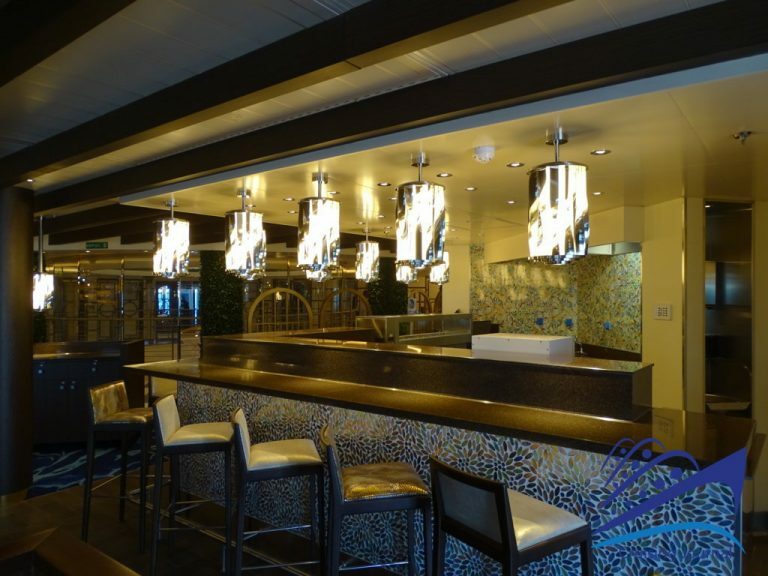 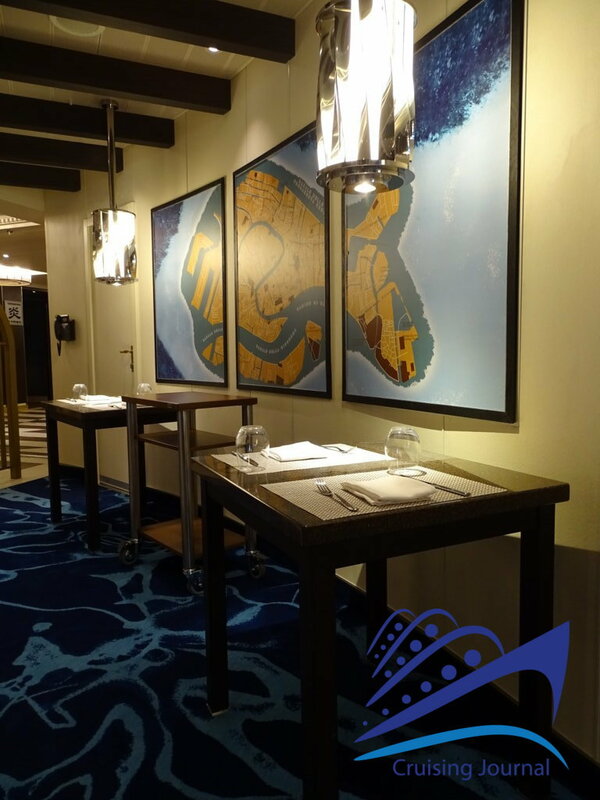 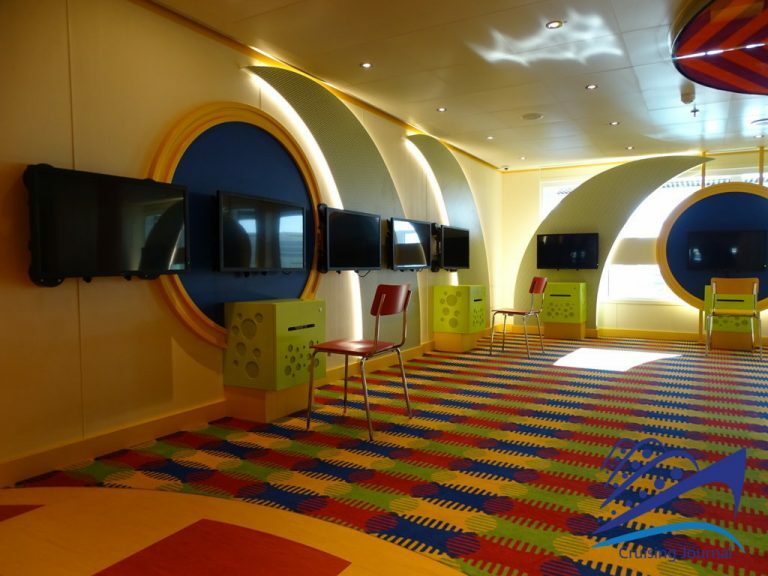 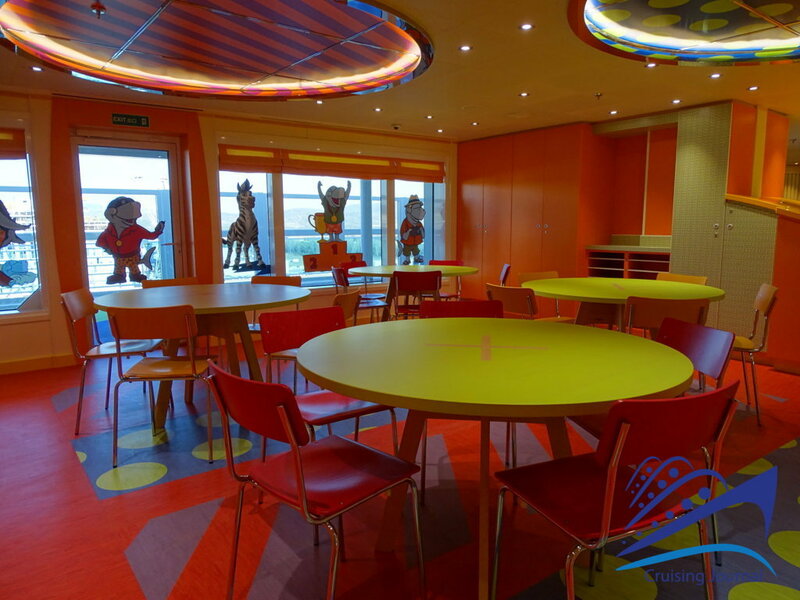 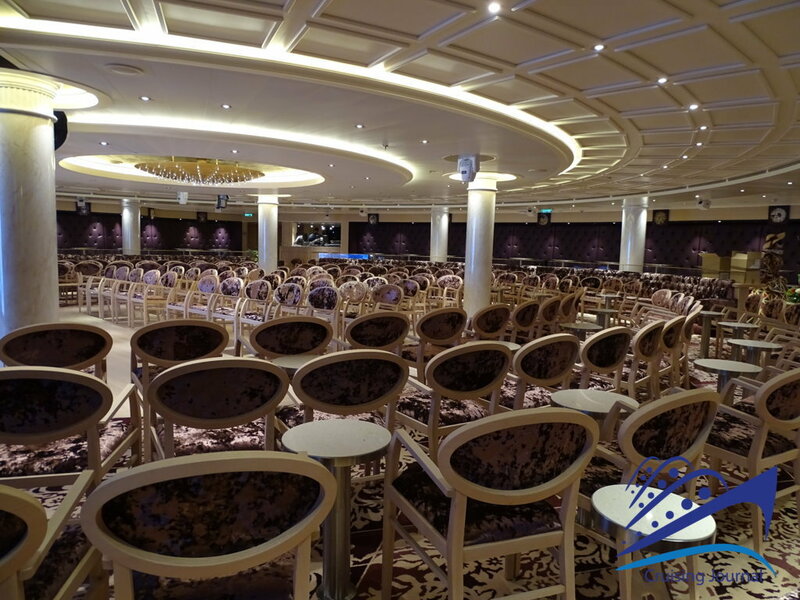 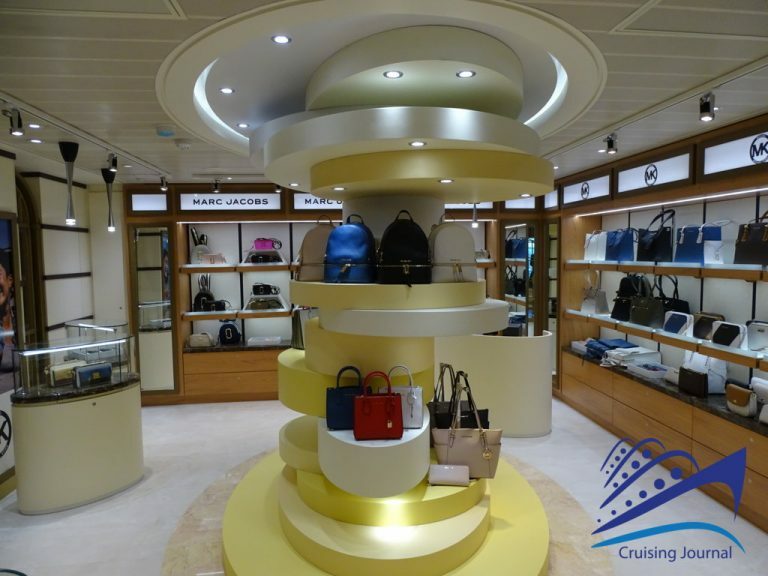 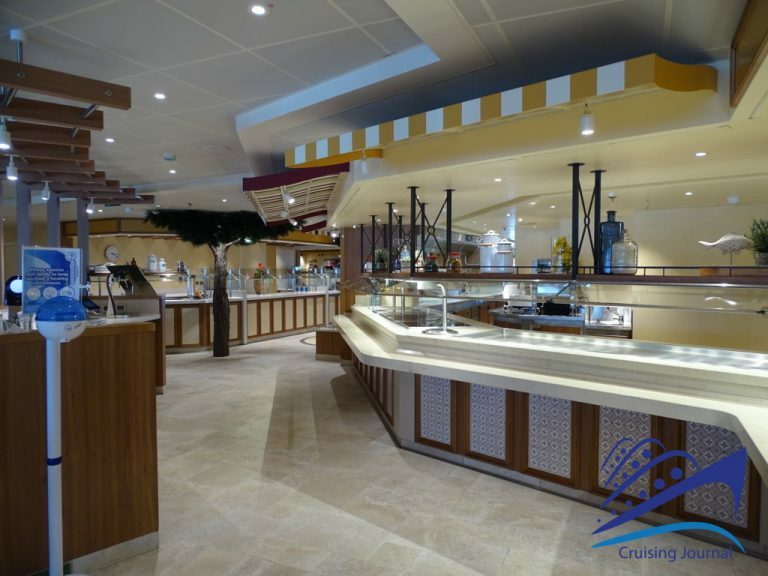 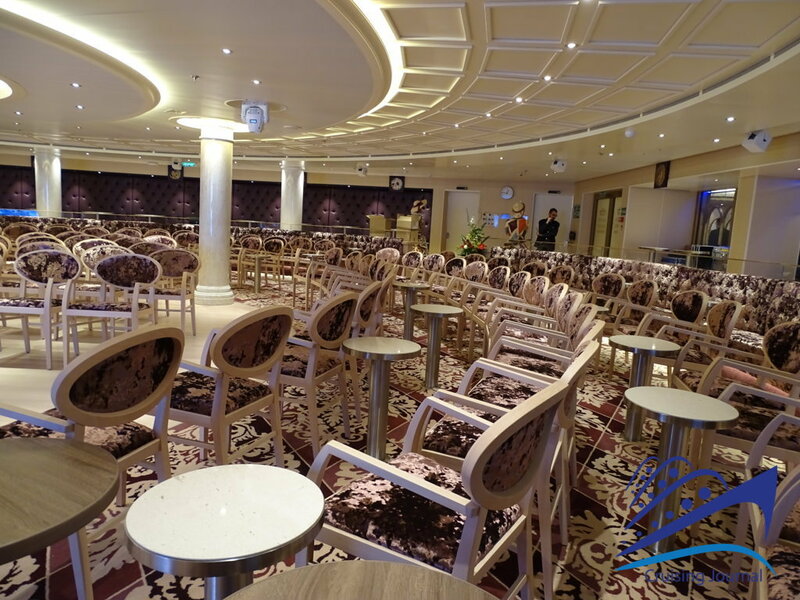 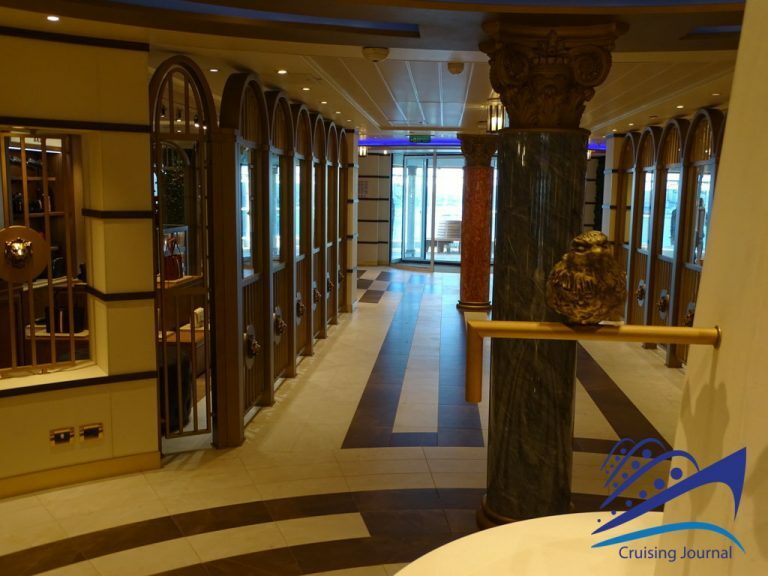 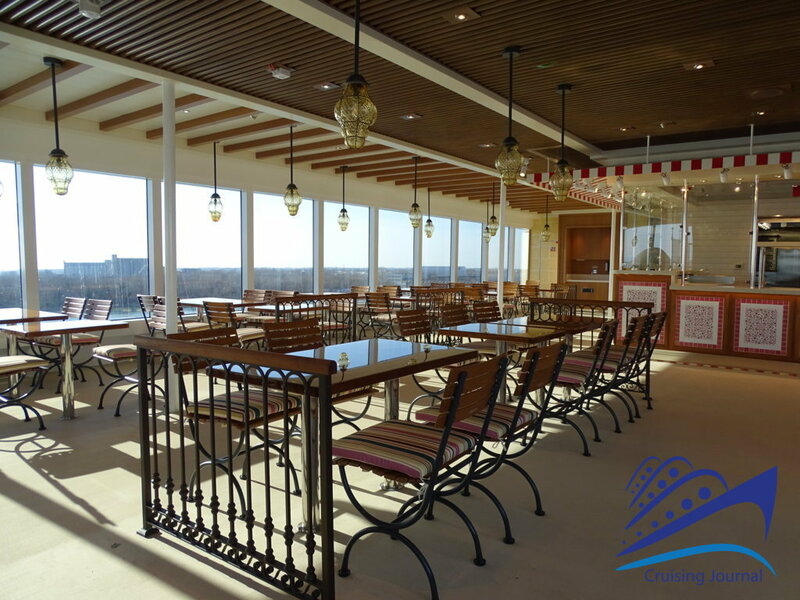 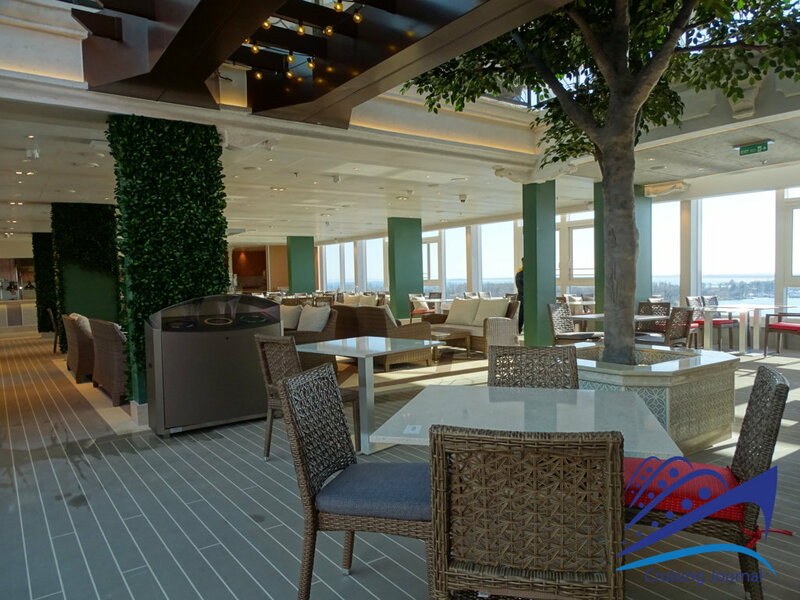 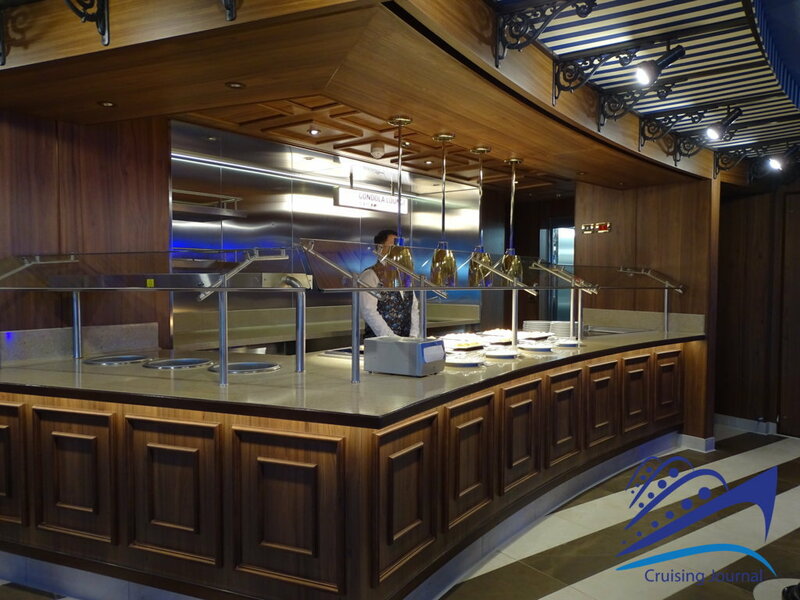 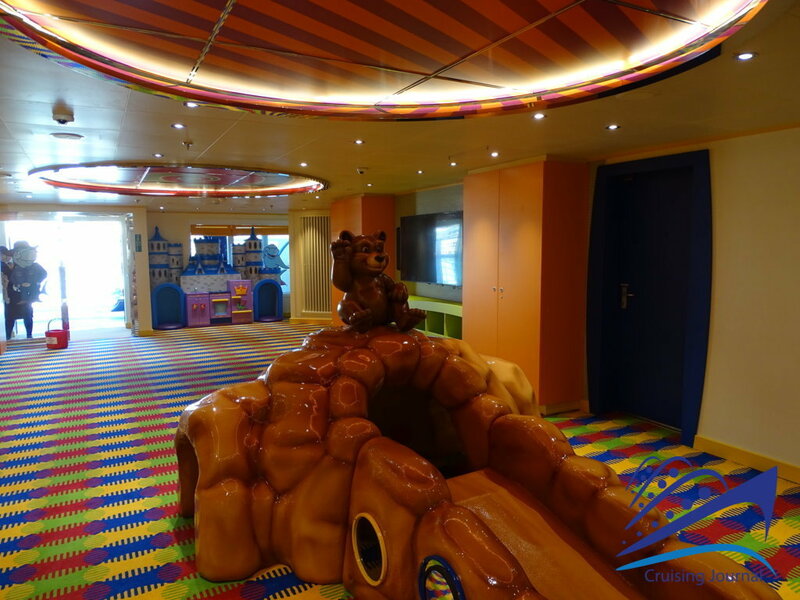 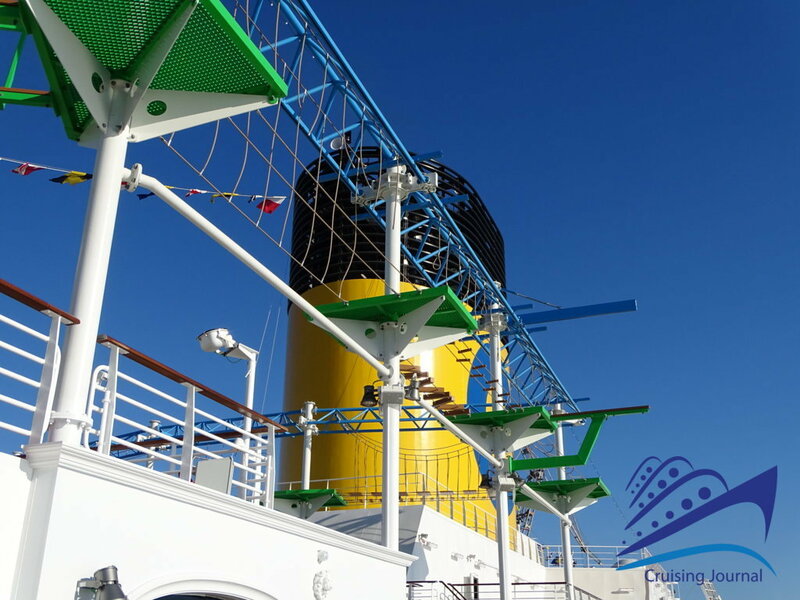 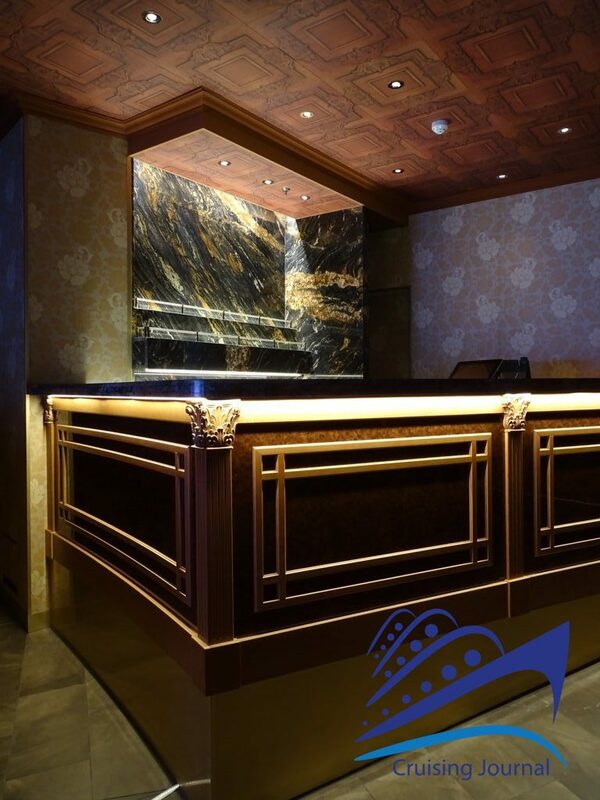 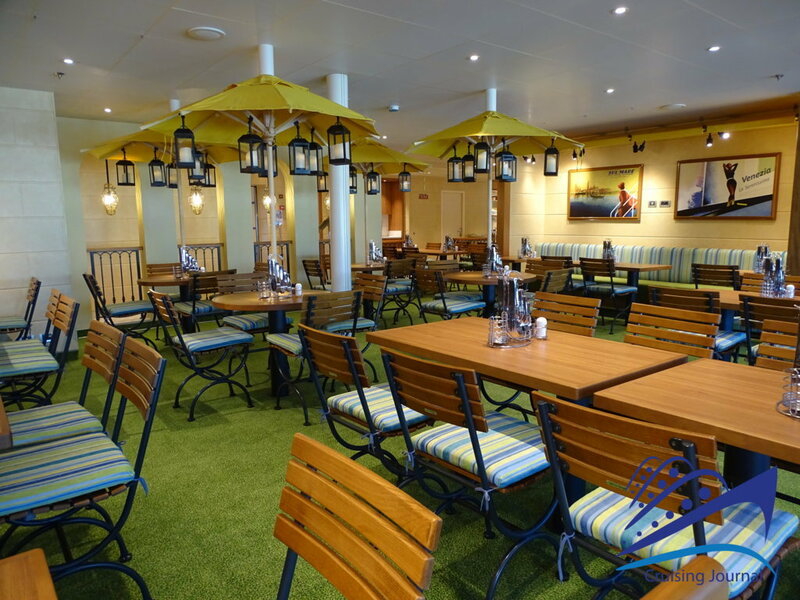 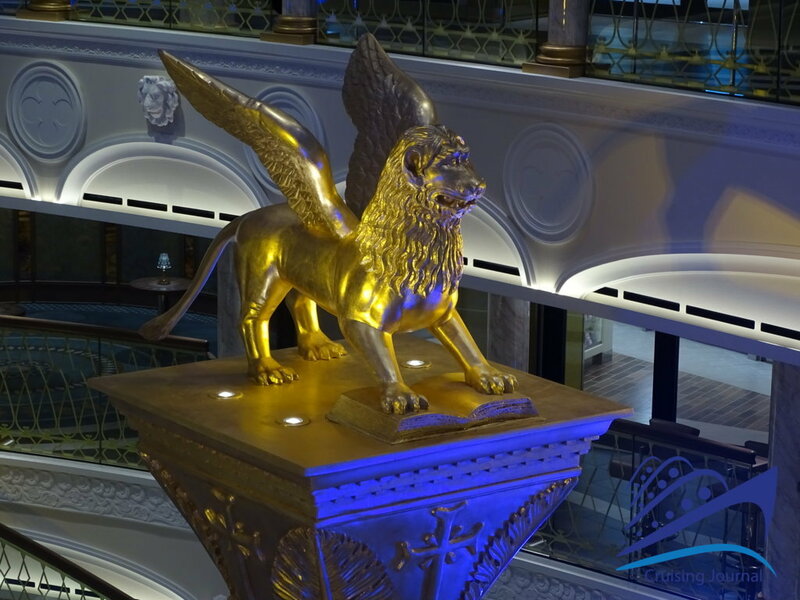 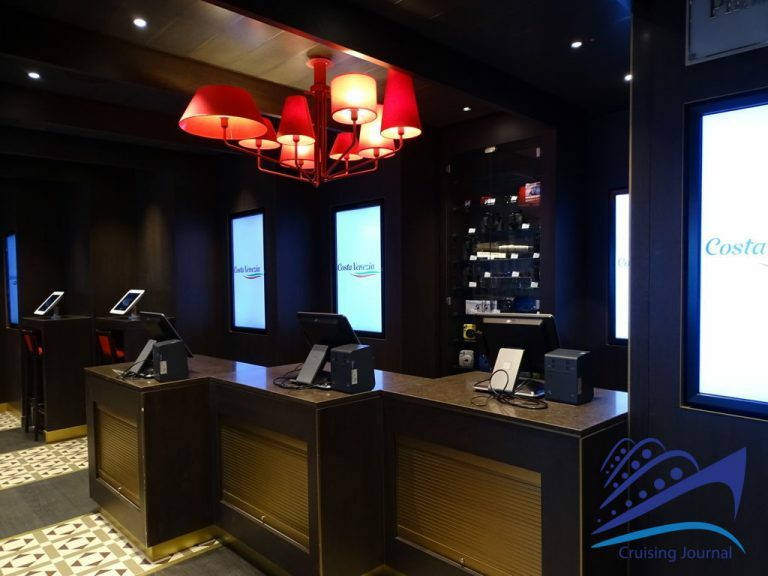 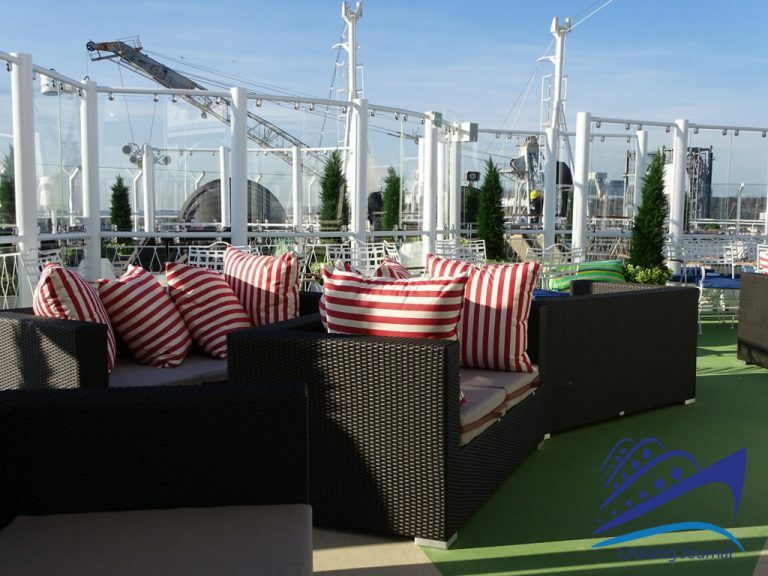 The first passenger zone is found on deck 3, with the beautiful Pizza San Marco, the main atrium of the ship. 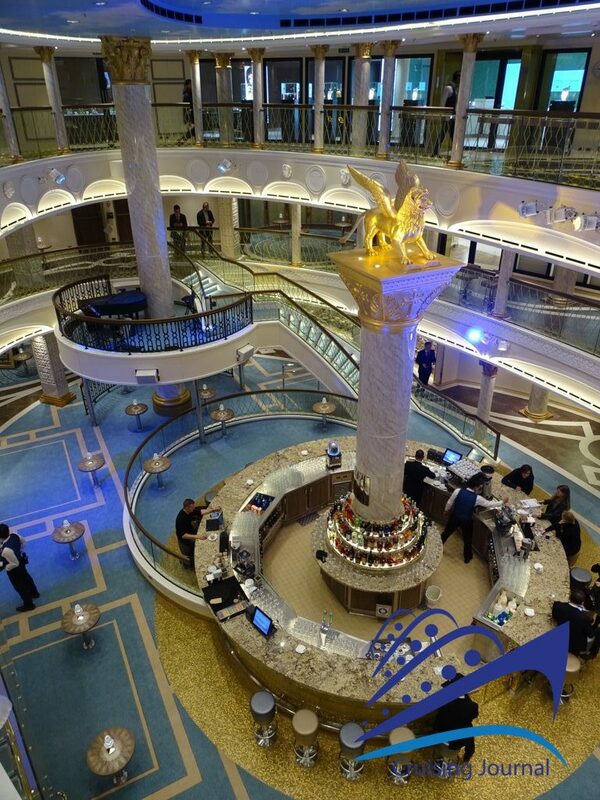 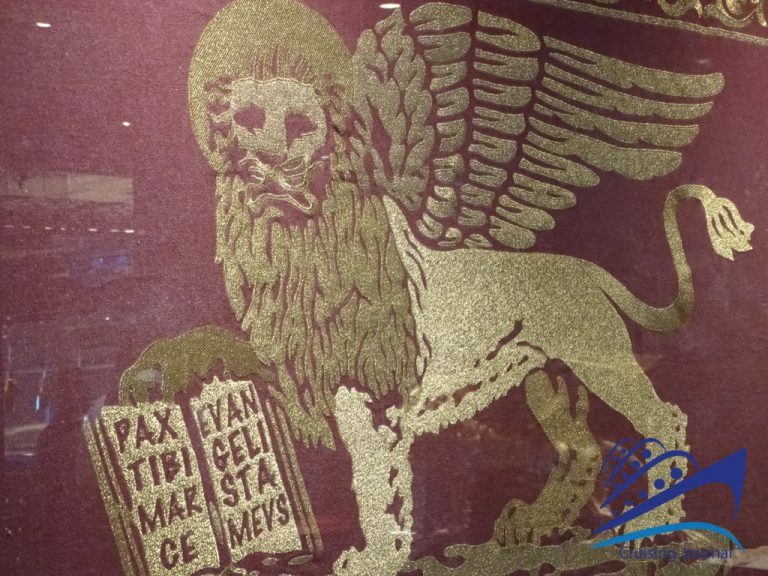 The Bar at the center is circular with a column with the lion of San Marco on it, and is flanked by the Reception and the Excursion Office. 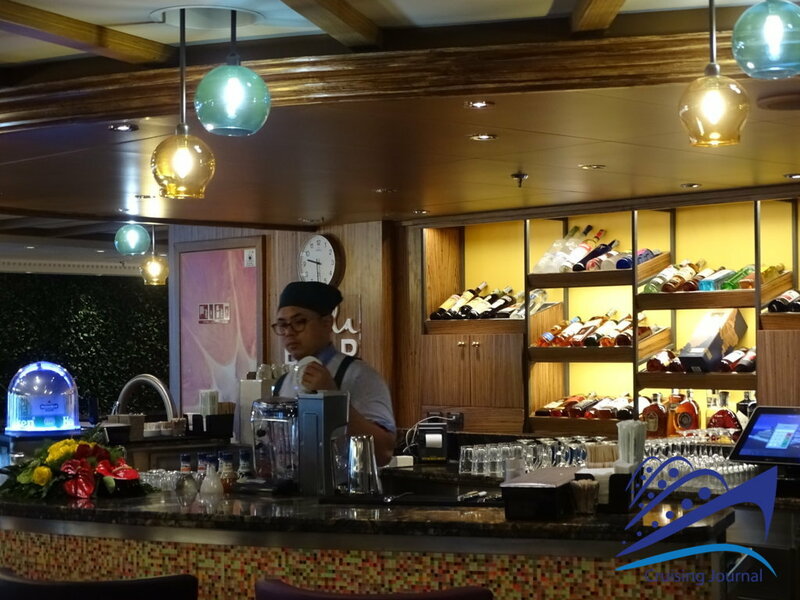 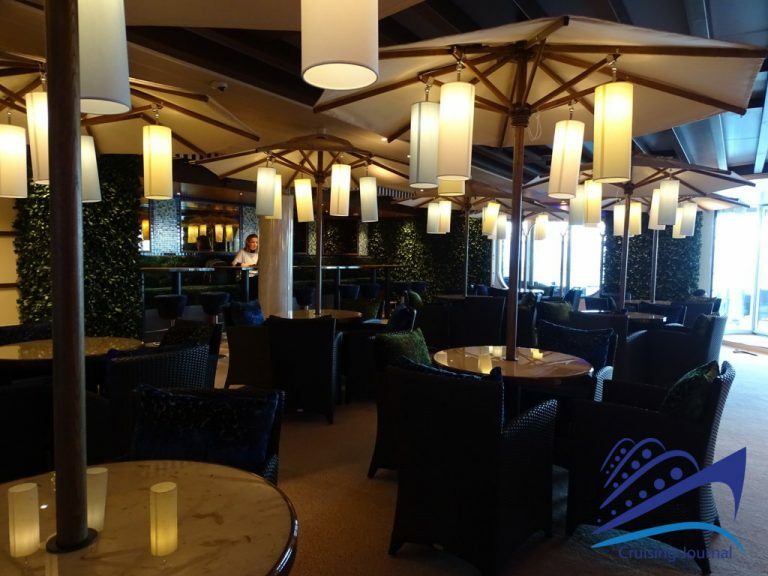 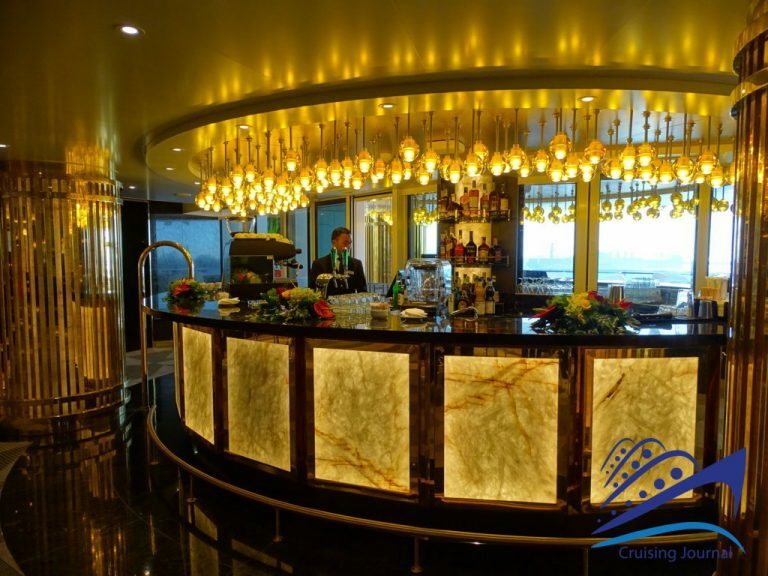 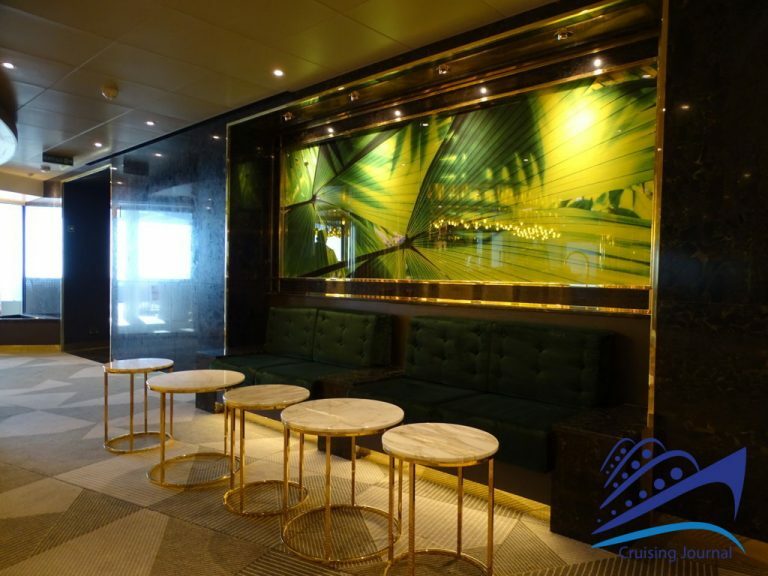 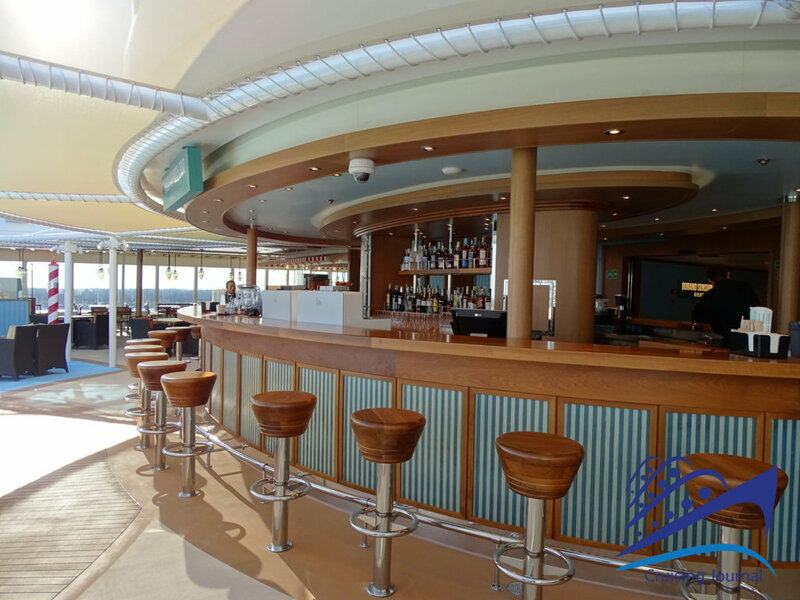 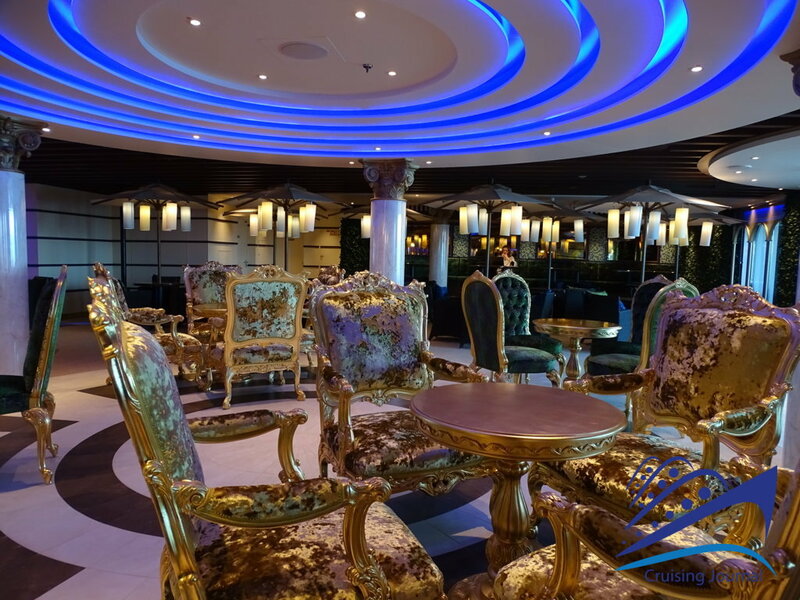 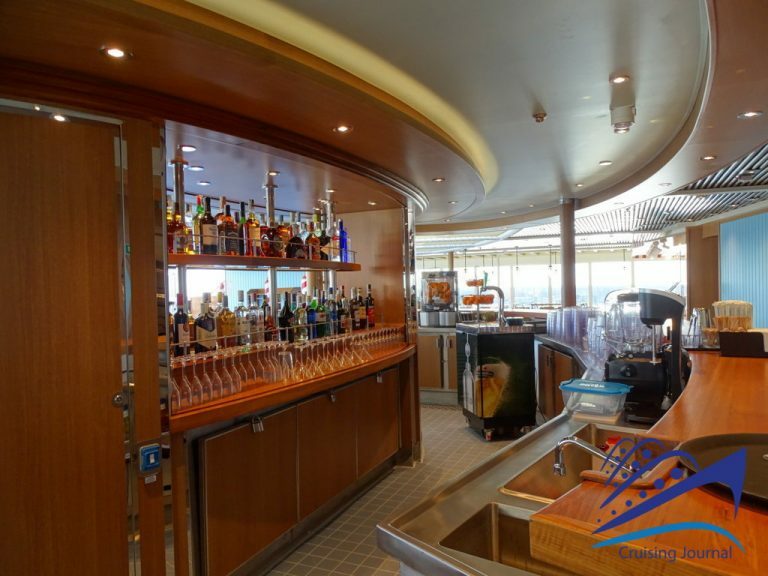 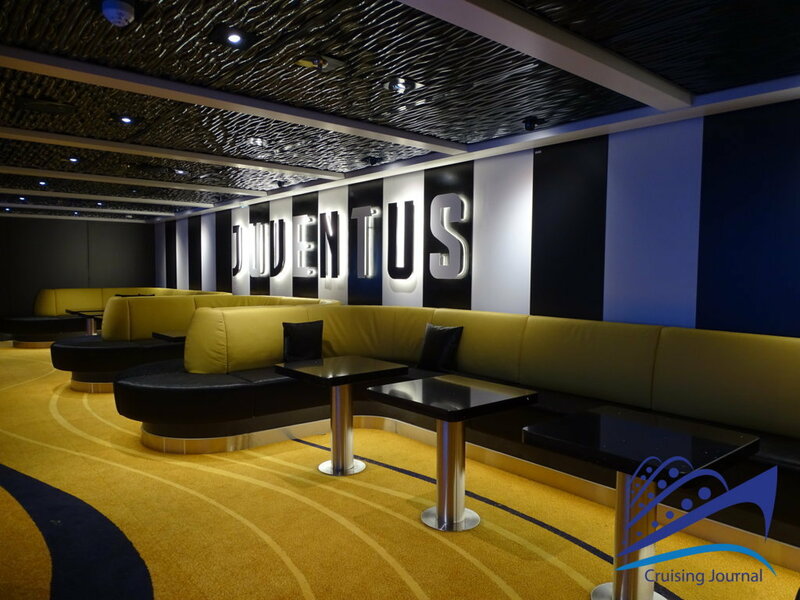 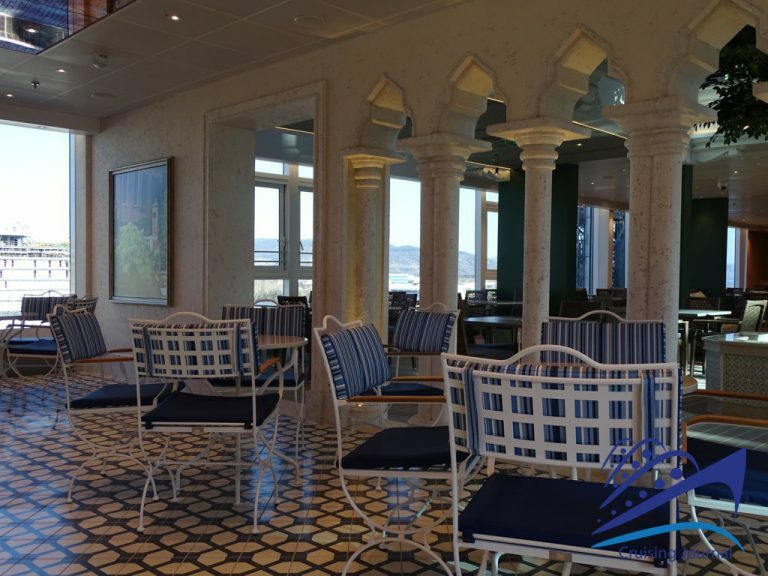 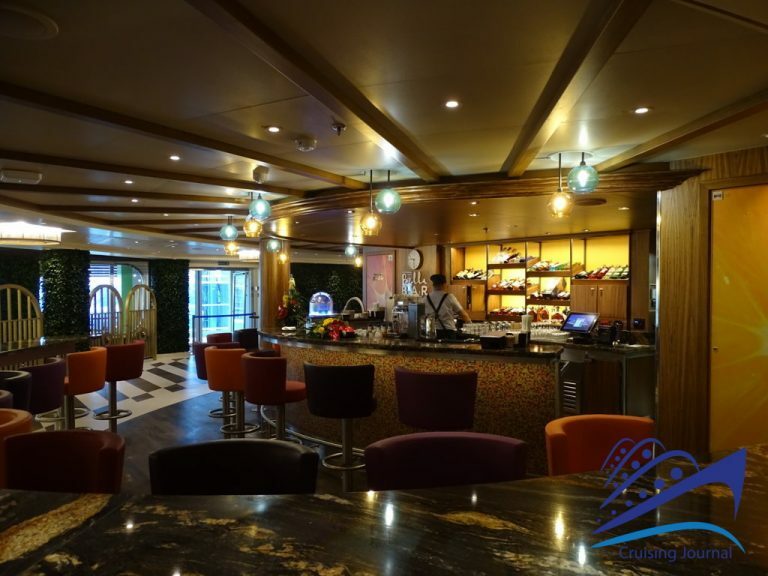 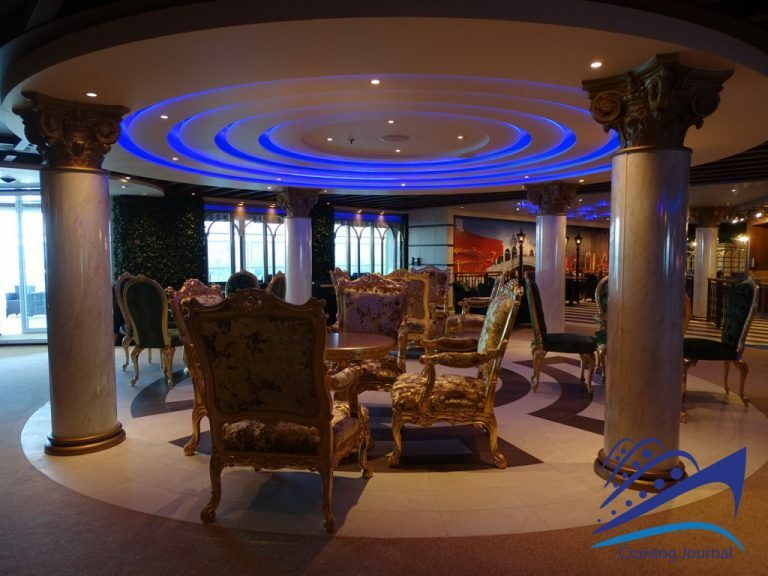 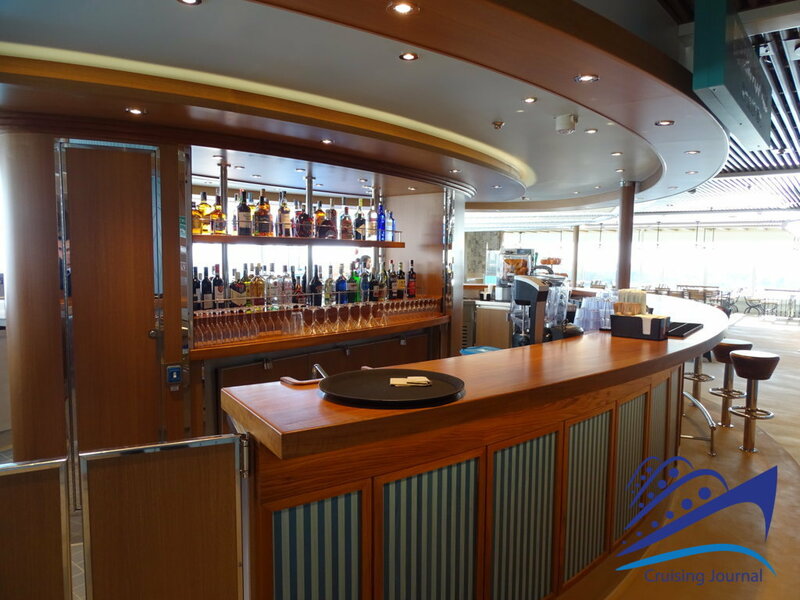 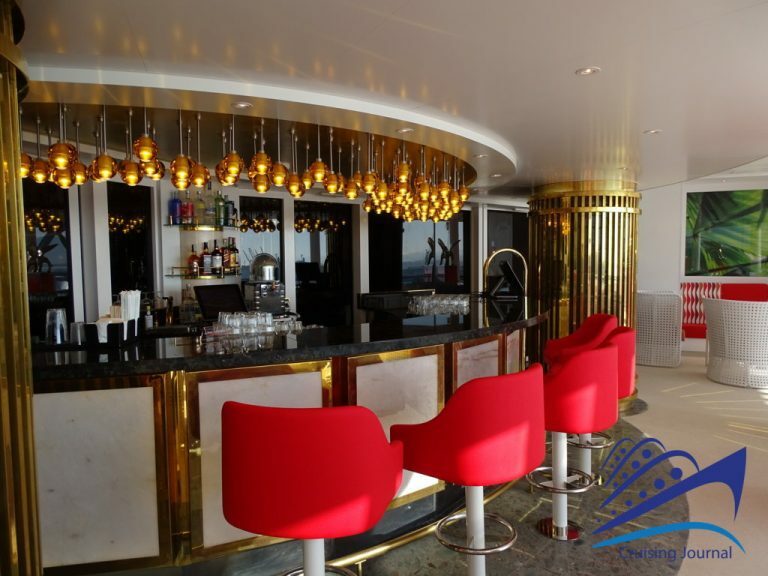 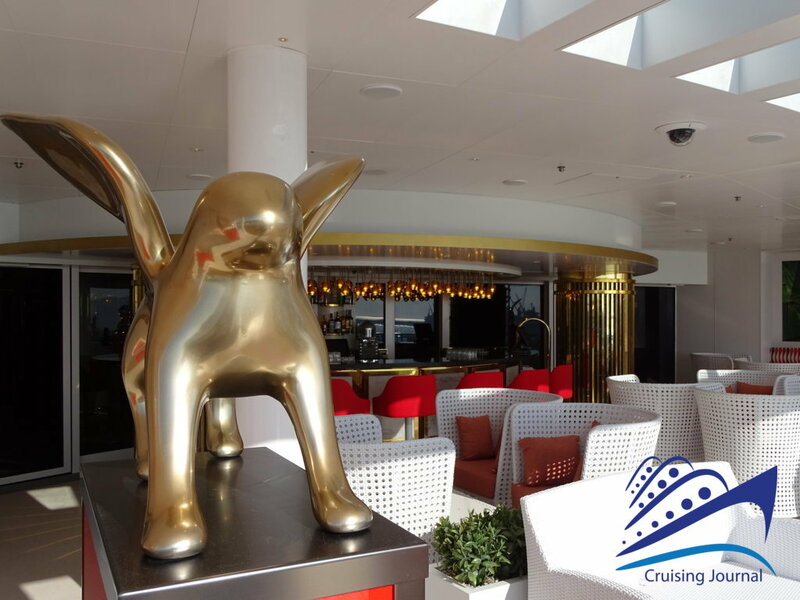 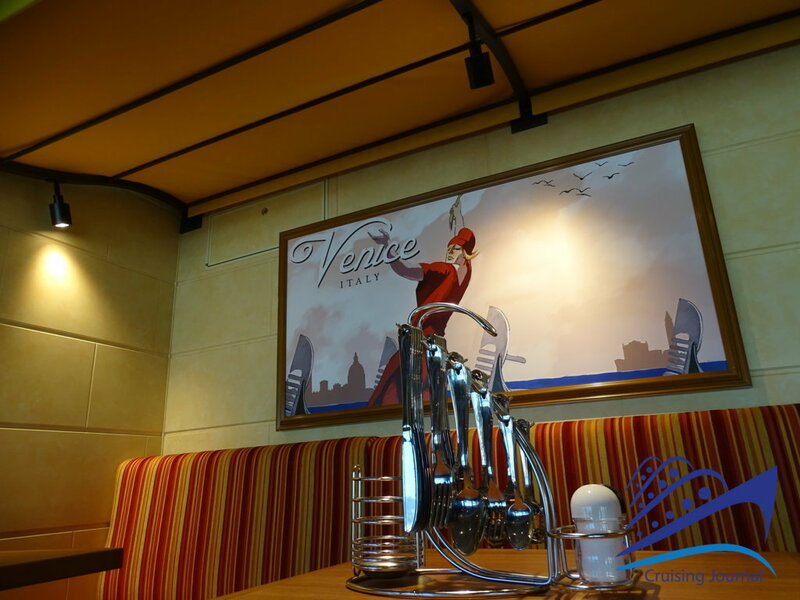 This is one of the most frequented areas of the ship, where you can have a good coffee, take an afternoon break, or enjoy an evening aperitif. 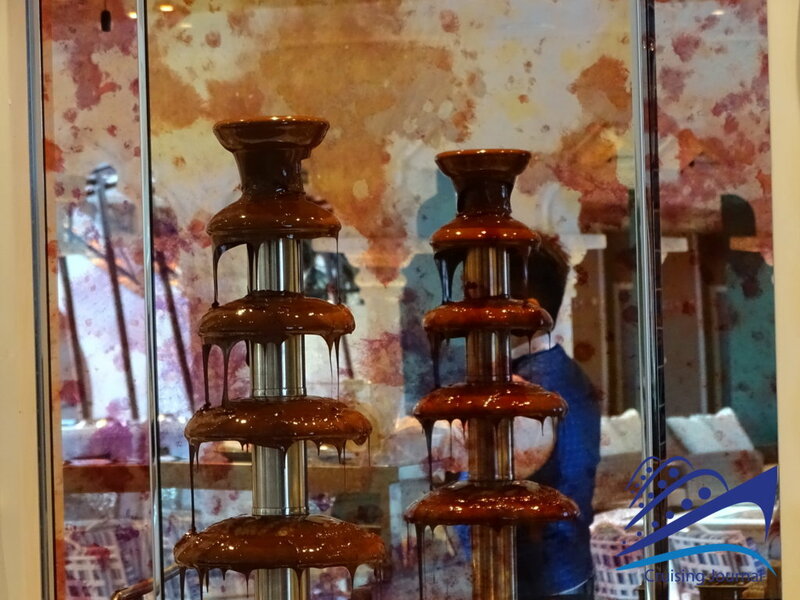 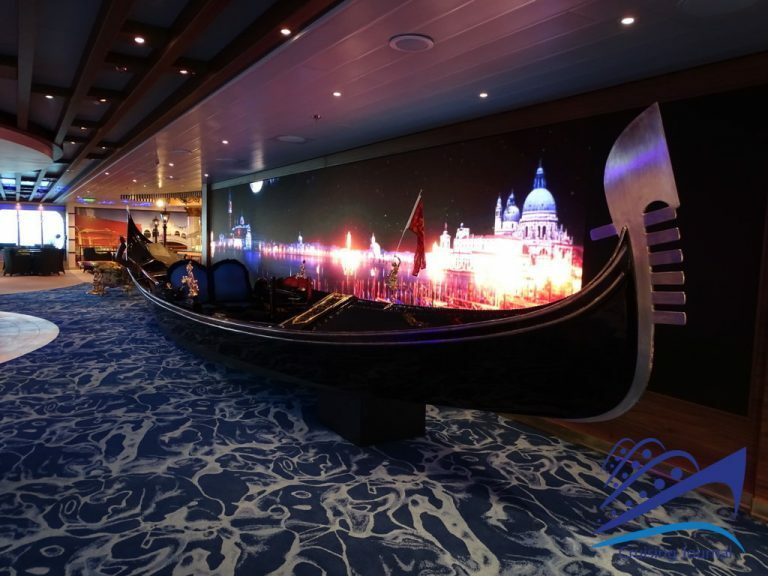 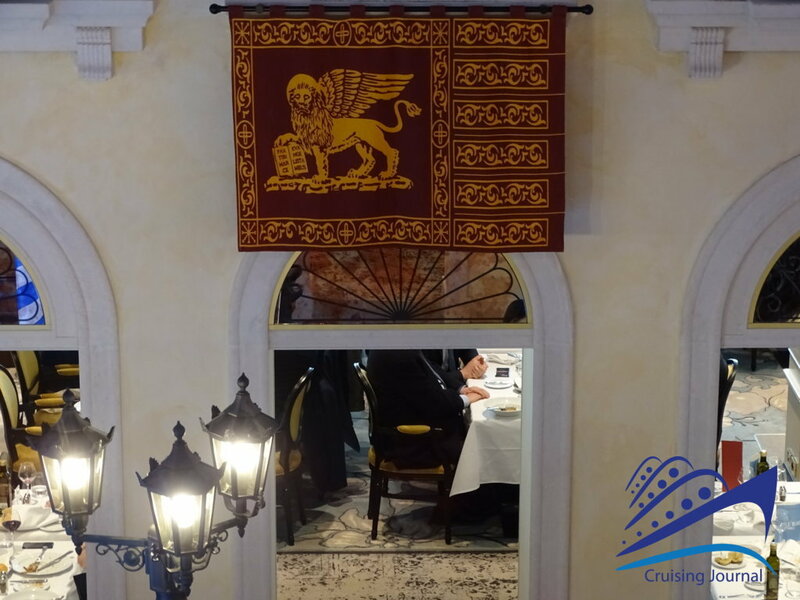 Right on the “Piazza” is the entrance to the Marco Polo Restaurant, one of the two main restaurants on the ship, decorated with taste, elegance and with tables placed comfortably around the Venetian arches and other décor. 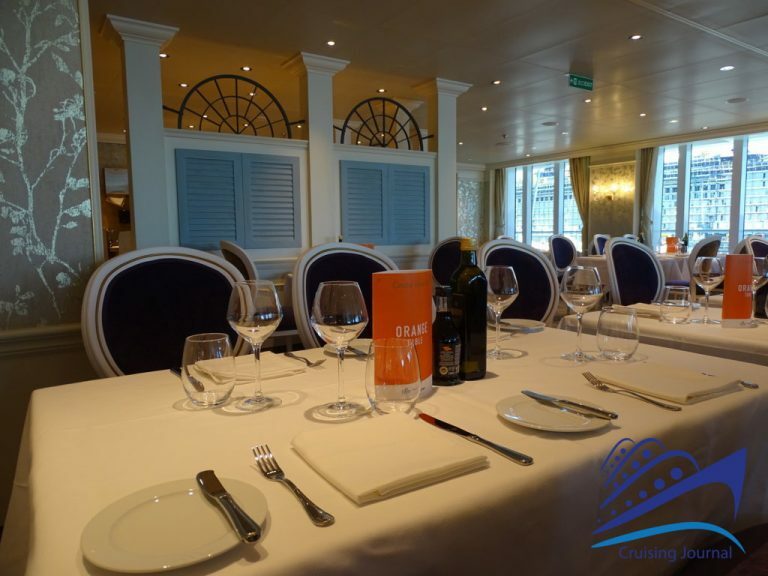 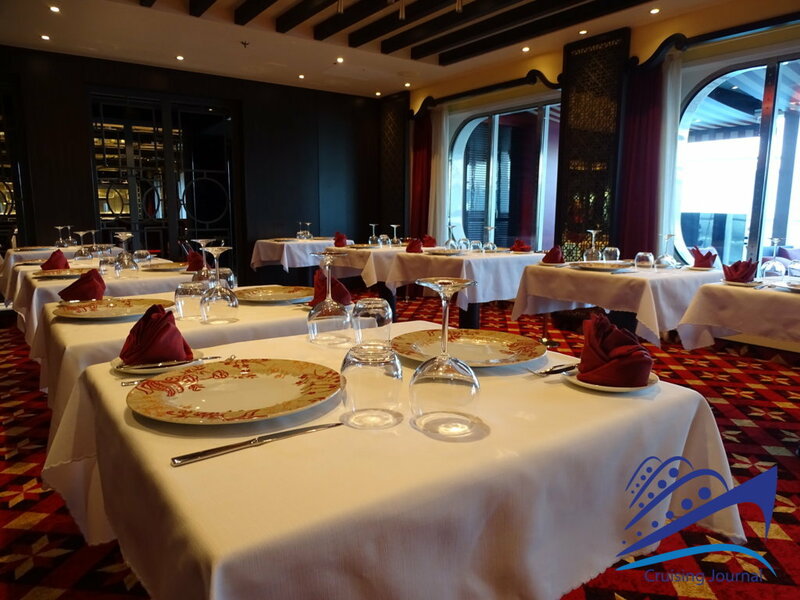 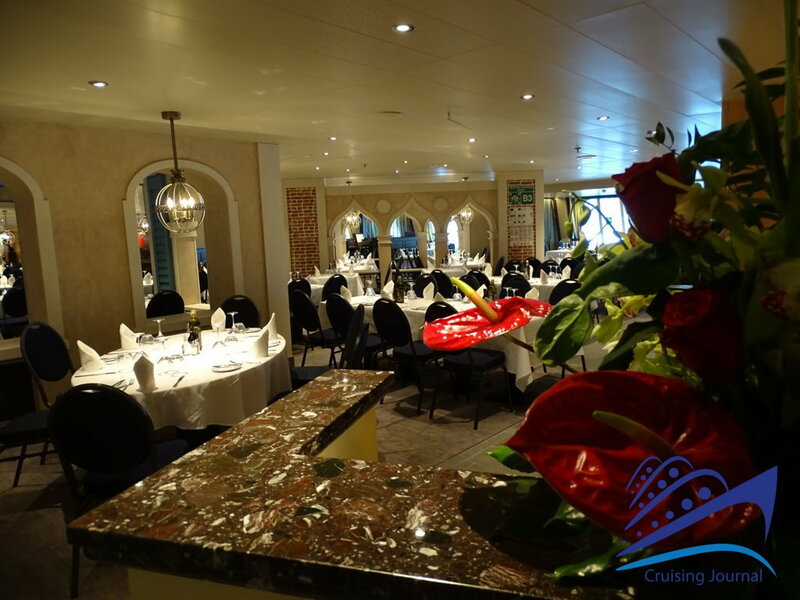 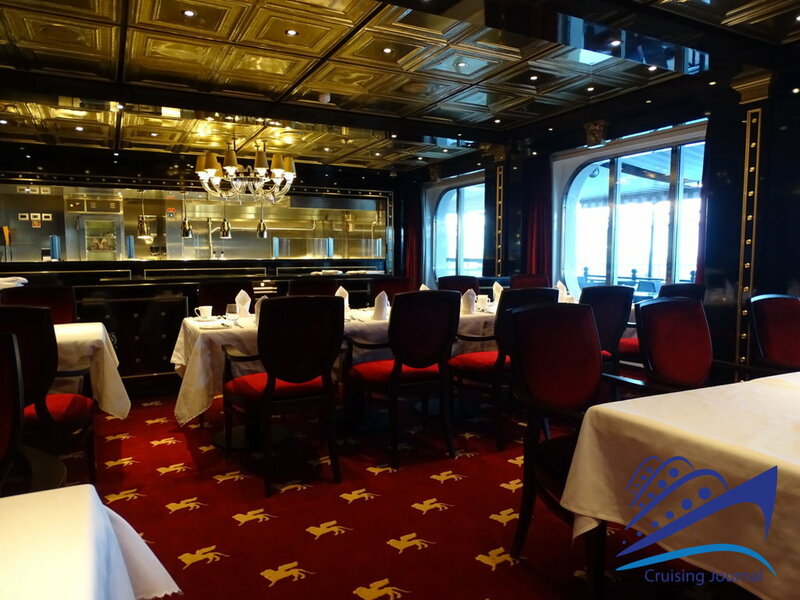 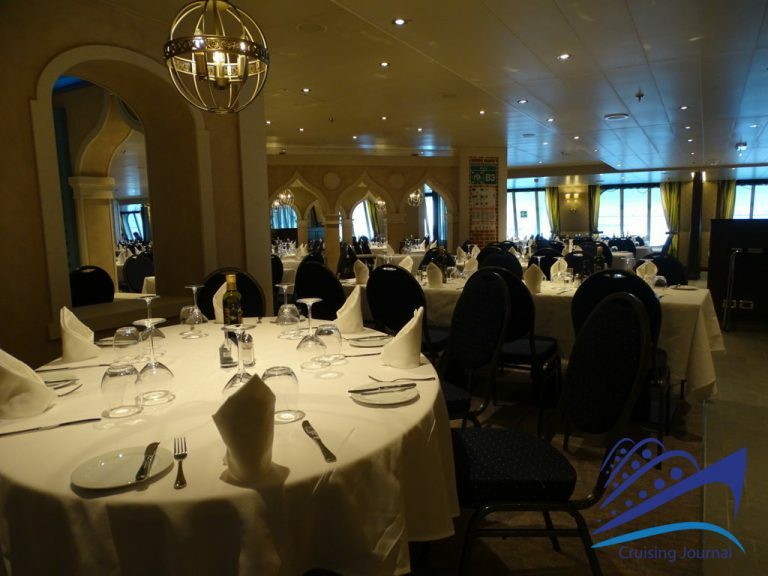 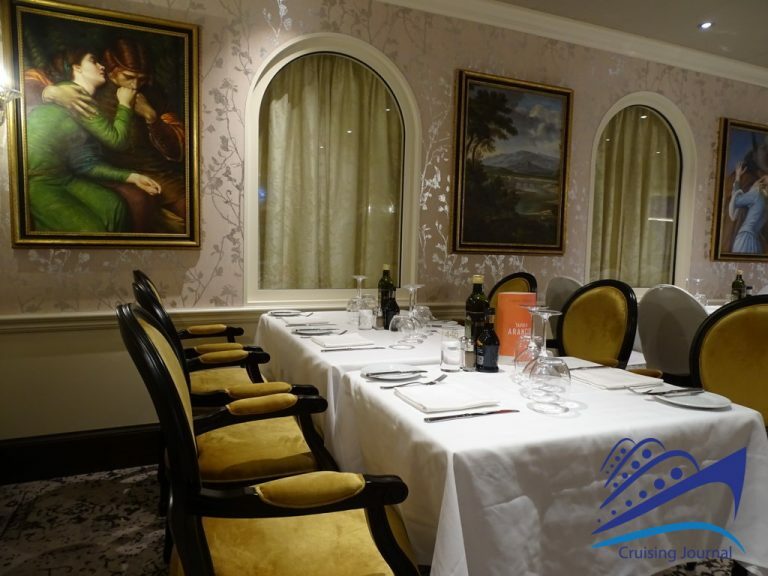 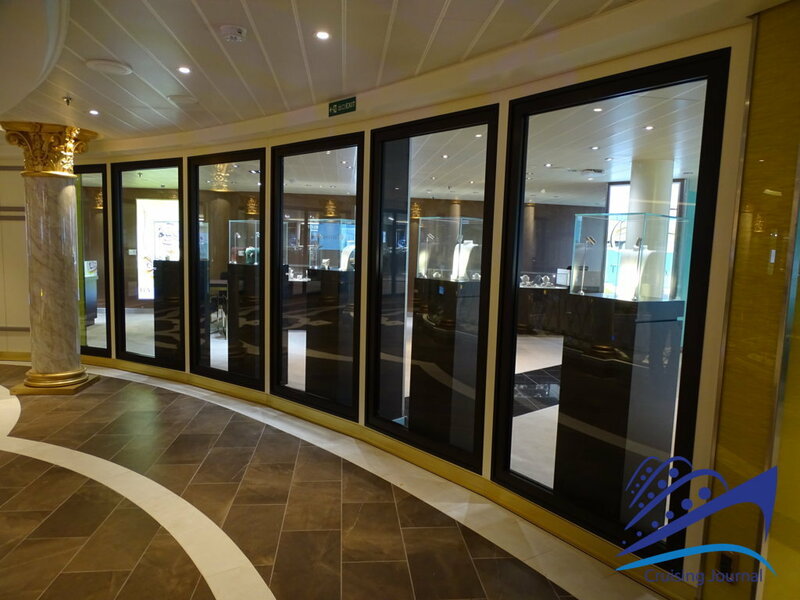 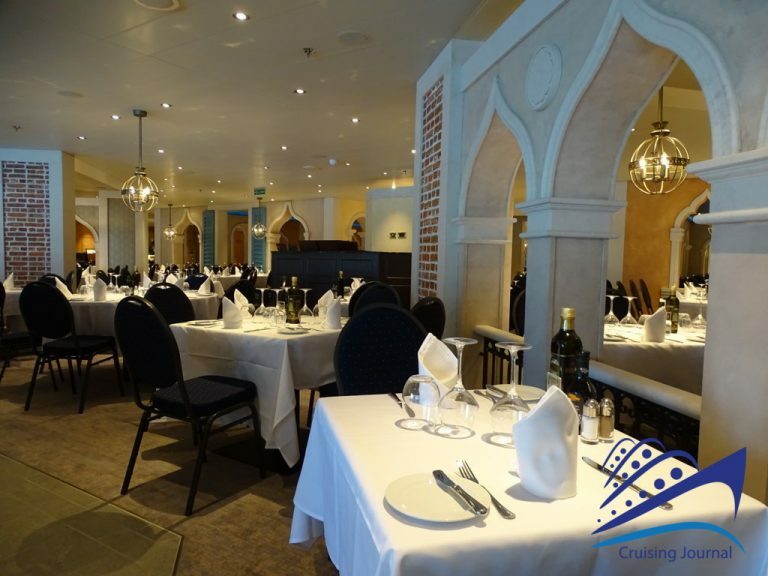 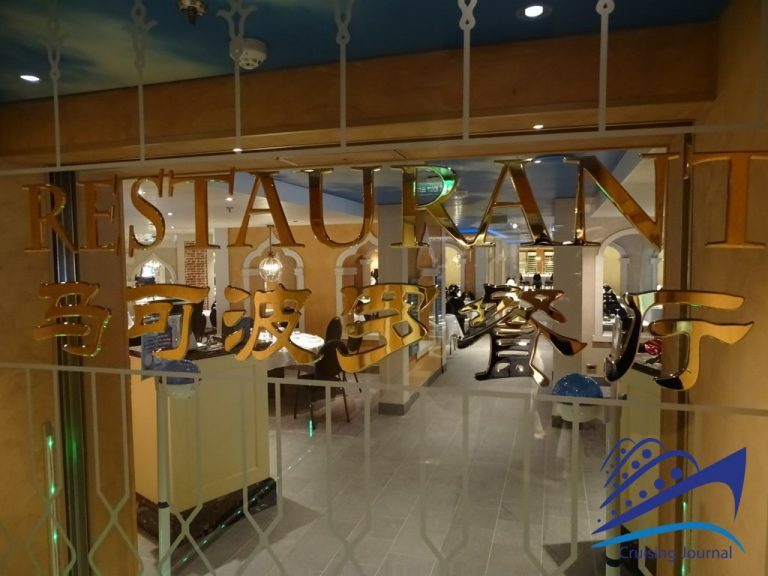 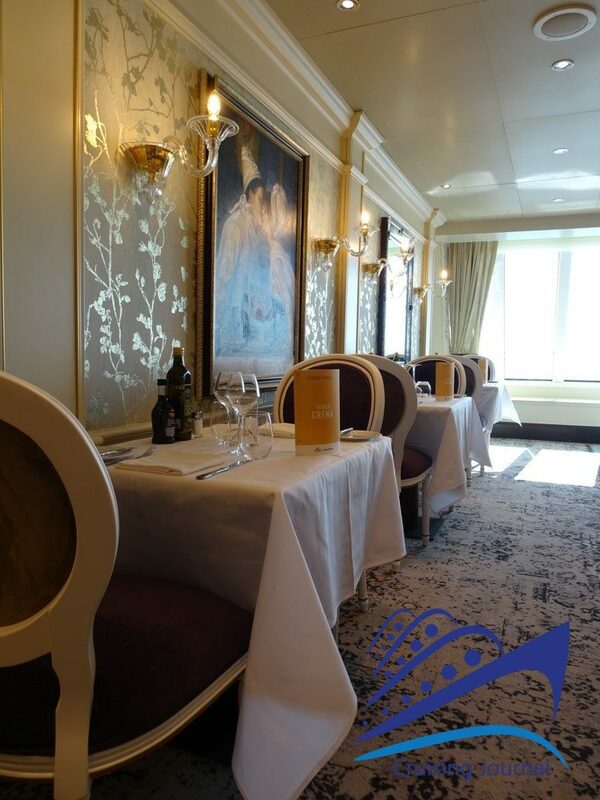 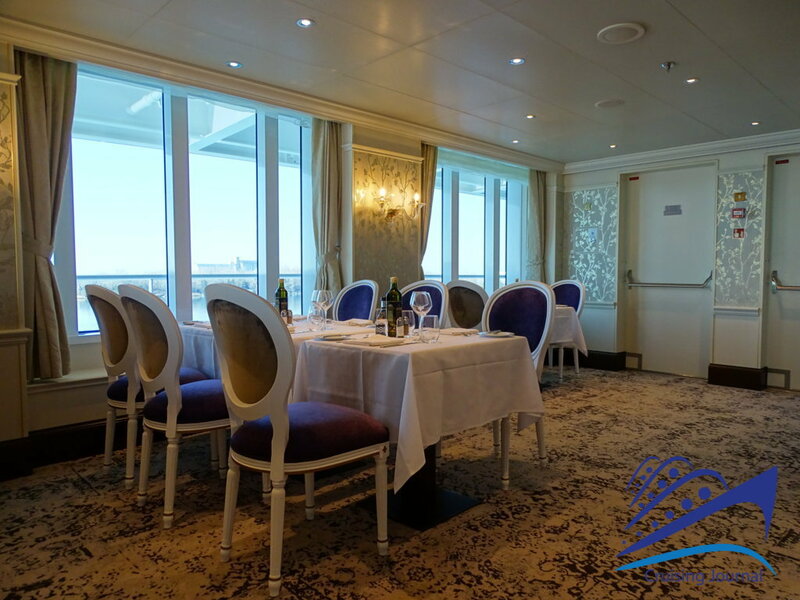 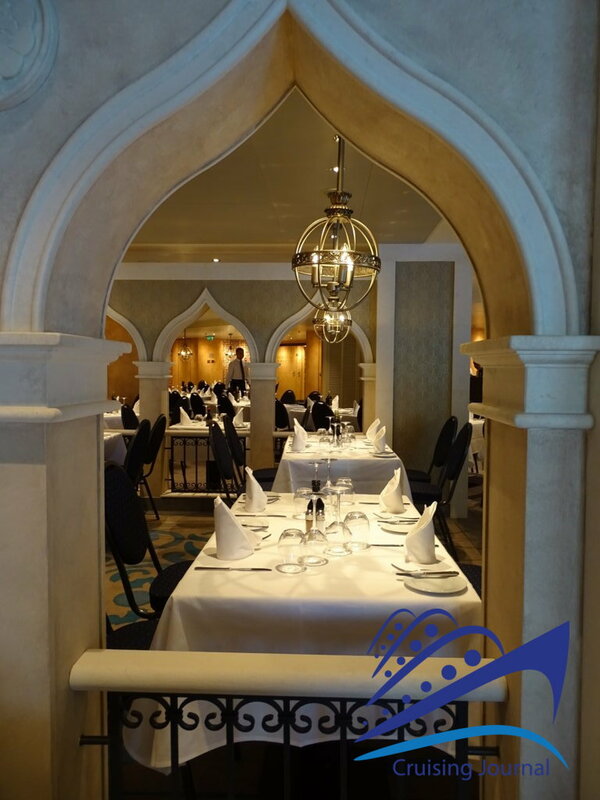 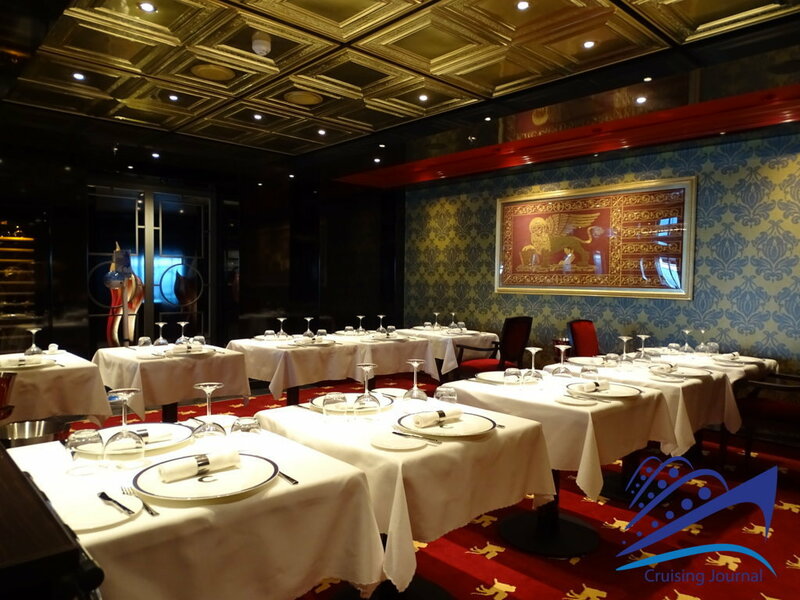 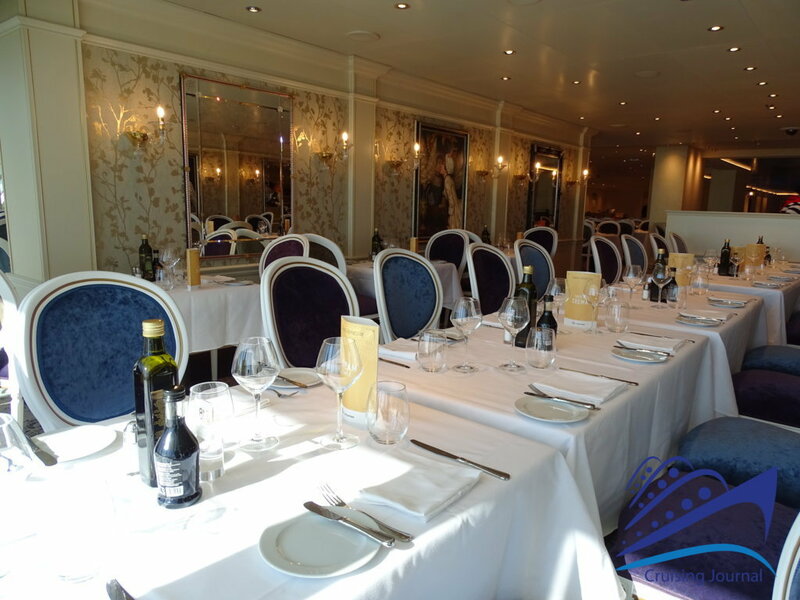 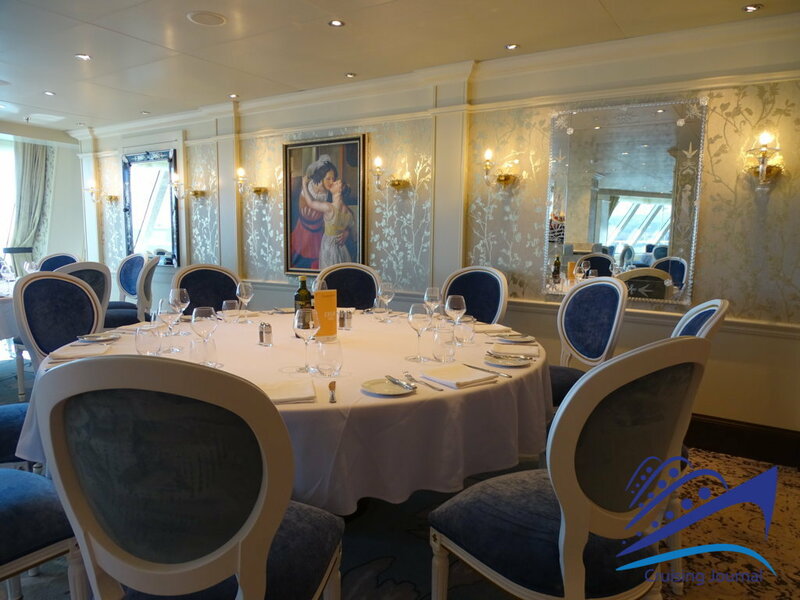 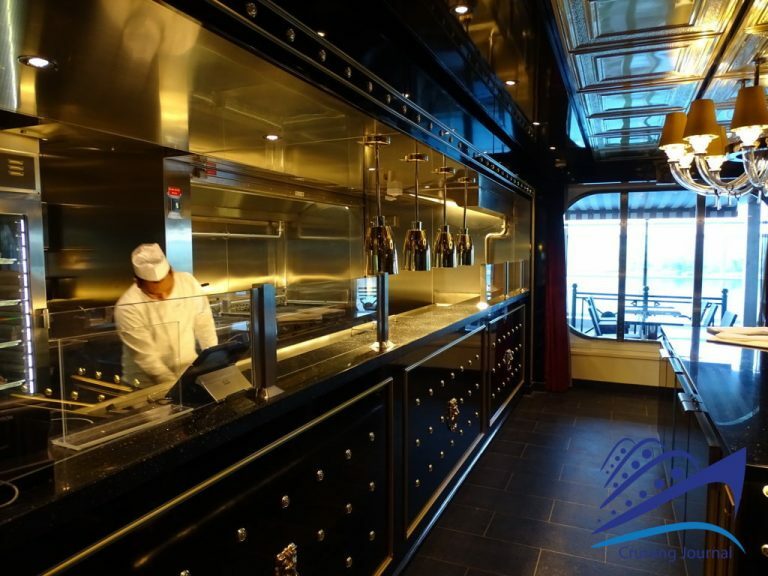 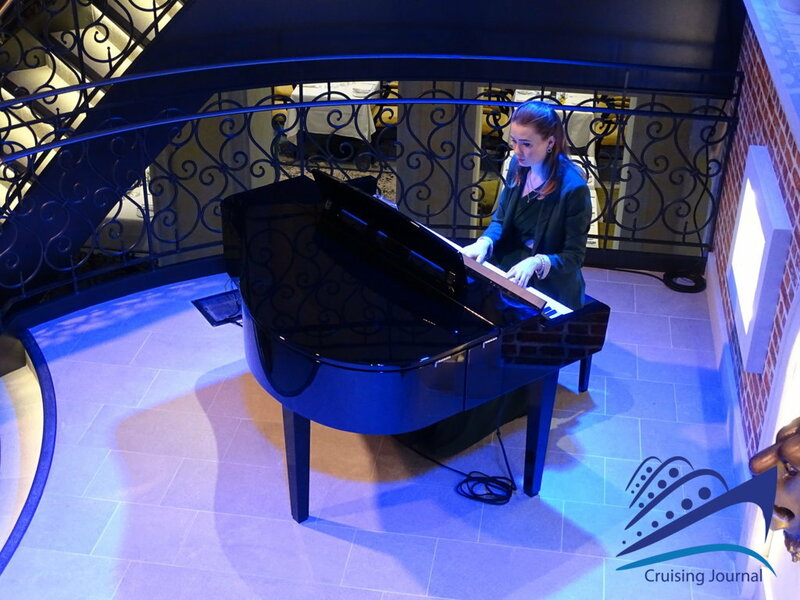 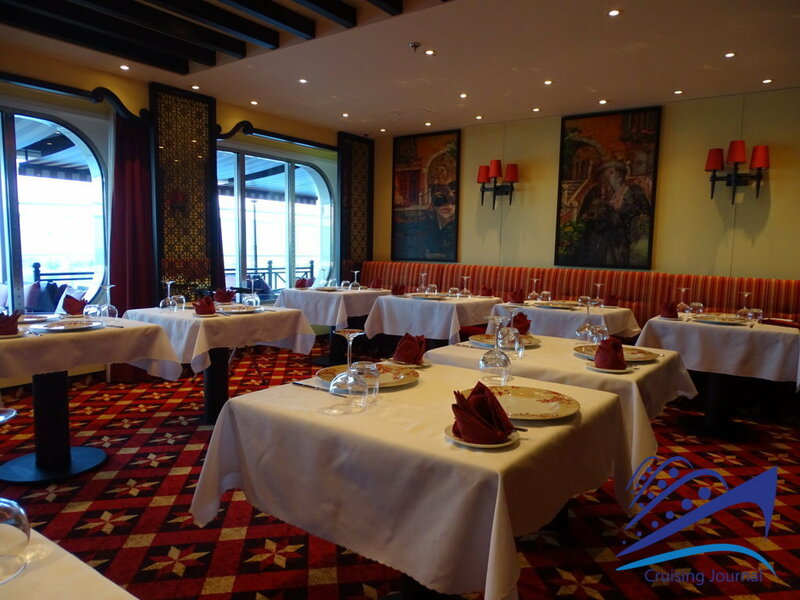 Also located on deck 3 is the lower level of the Canal Grande Restaurant, the other main restaurant on board, which is however accessed from deck 4. 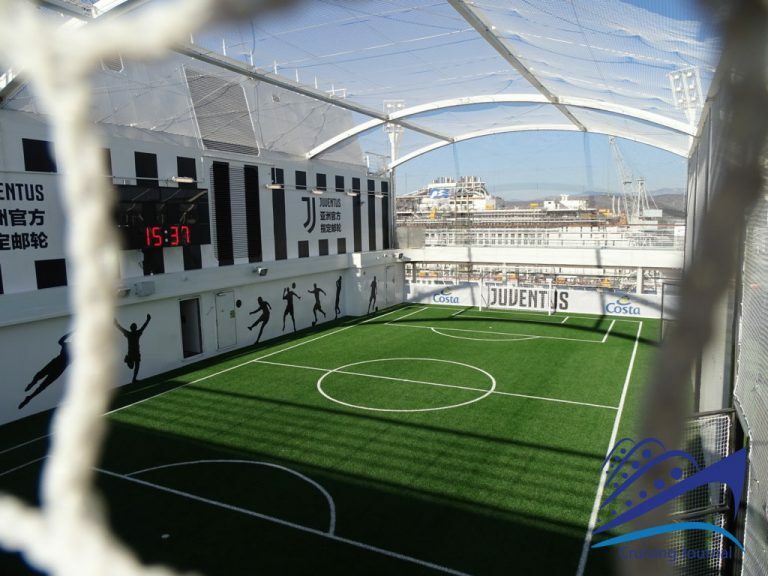 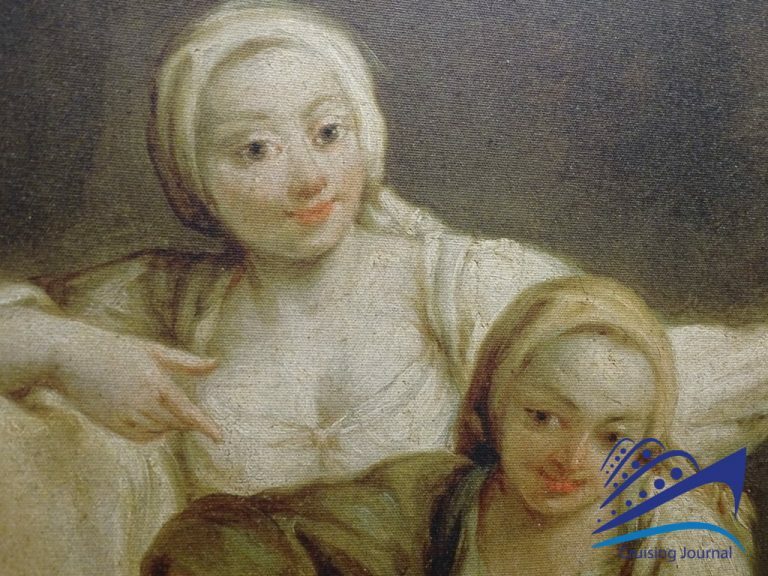 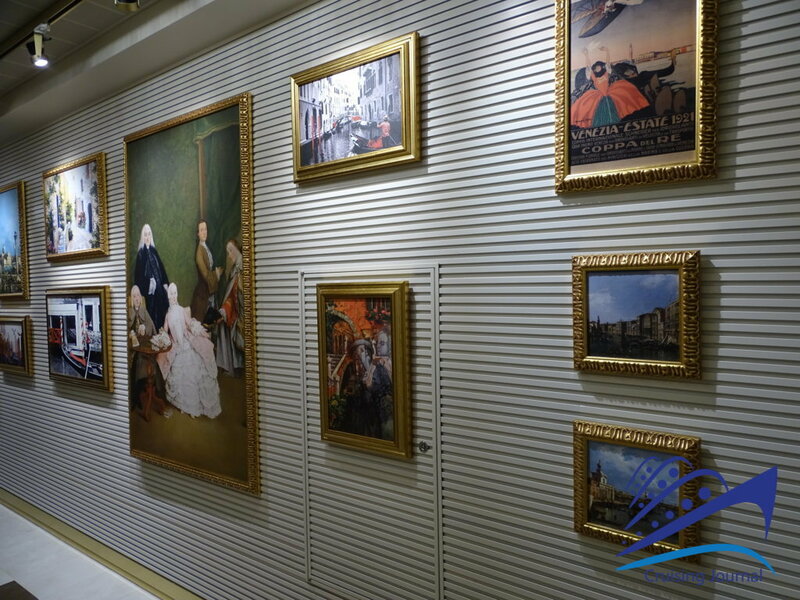 At the bow of deck 3 is an area for children and teenagers, with the Juventus Turin Museum, a collection of objects related to the team from Piedmont that will surely enthrall an Oriental public. 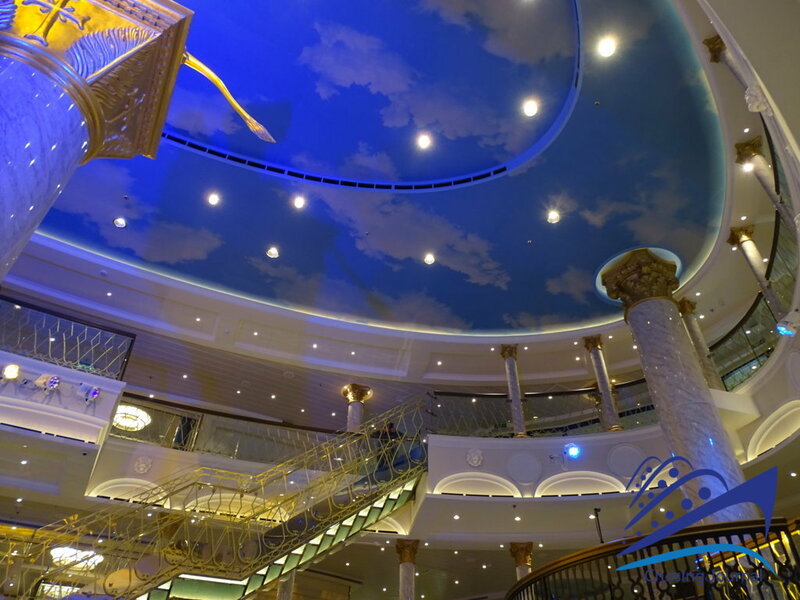 Going up to deck 4 there is, around the Pizza San Marco, a large semicircular balcony that overlooks the area below. 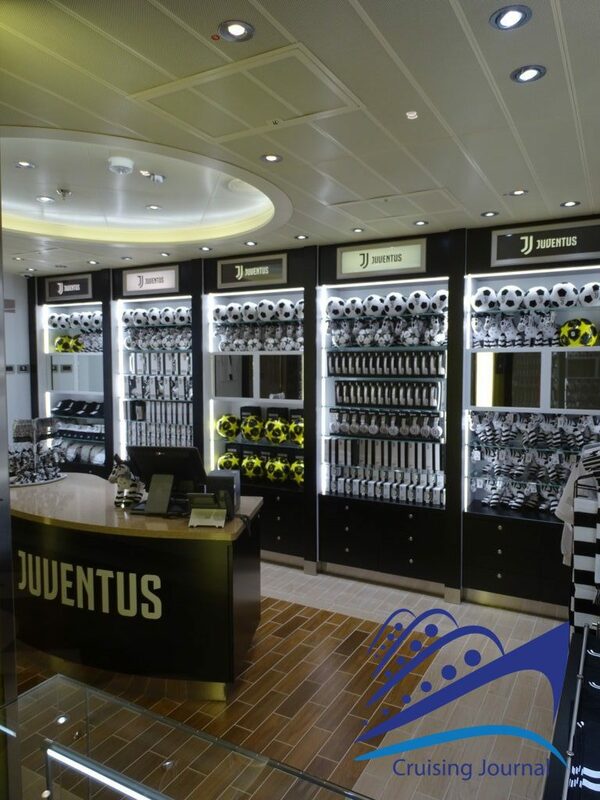 Here there are numerous shops (San Marco Shops), from Tiffany to sweets, from Juventus Shop to souvenirs. 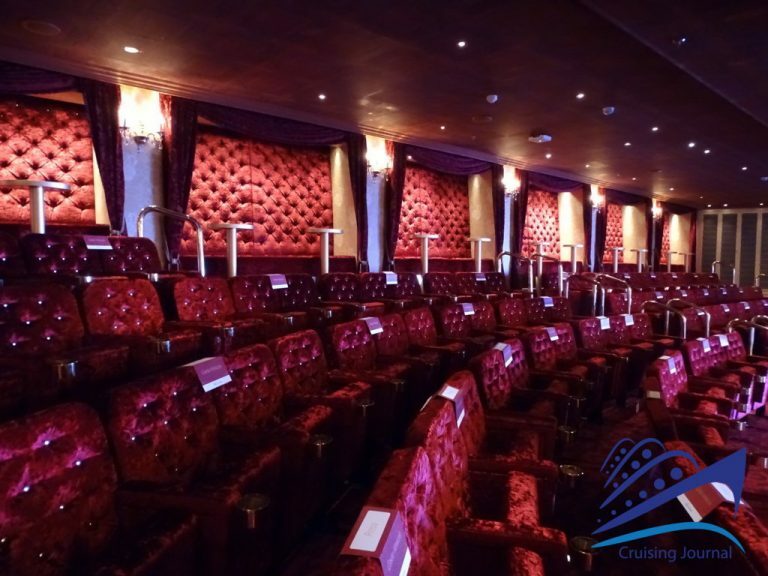 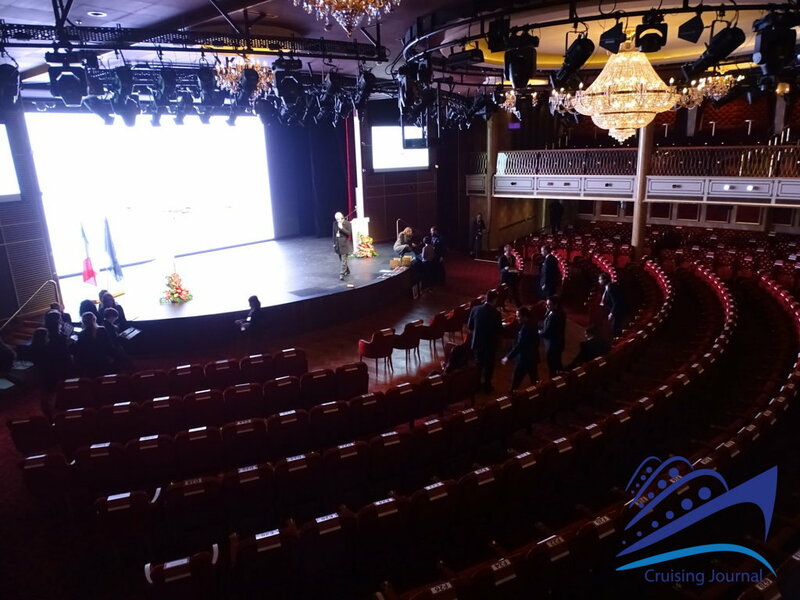 Moving toward the bow, you can access the Teatro Rosso, an elegant theater divided on two decks. 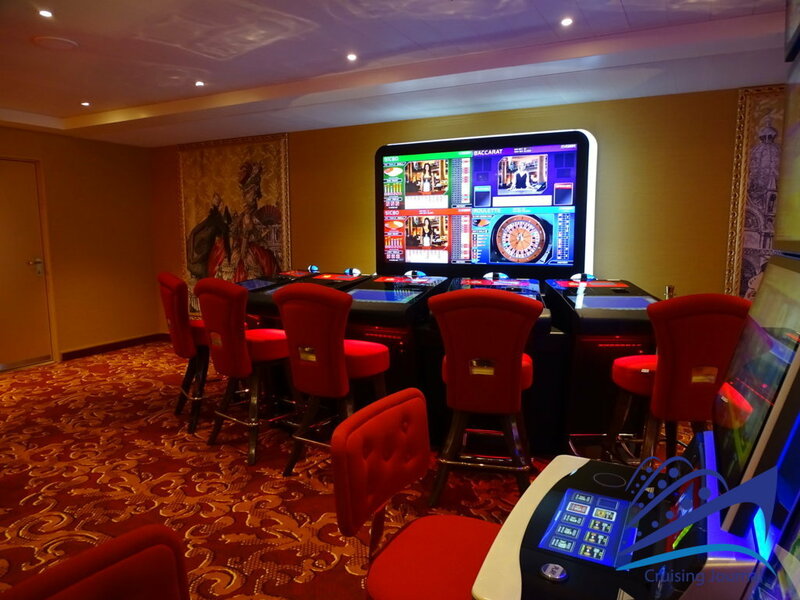 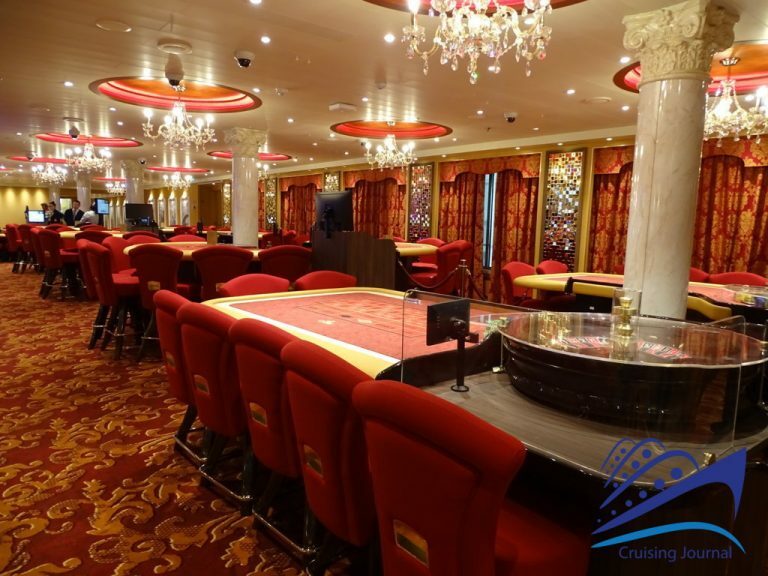 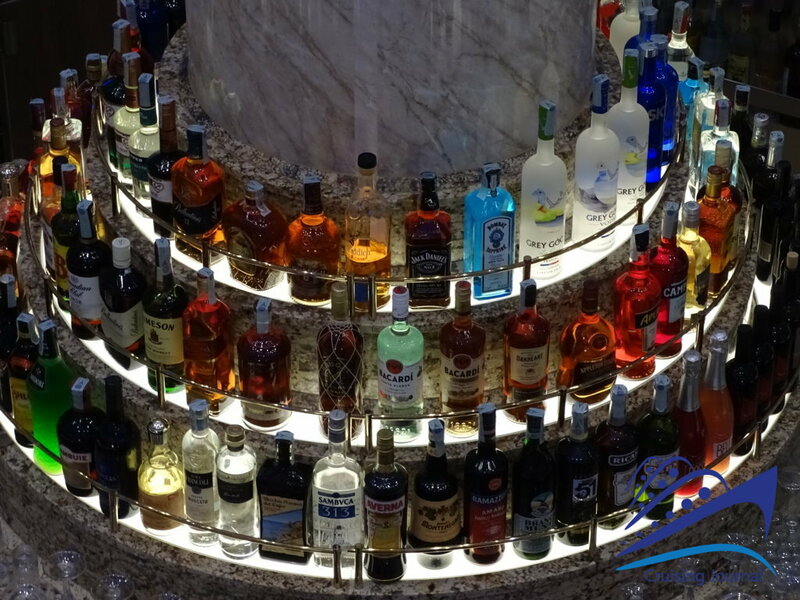 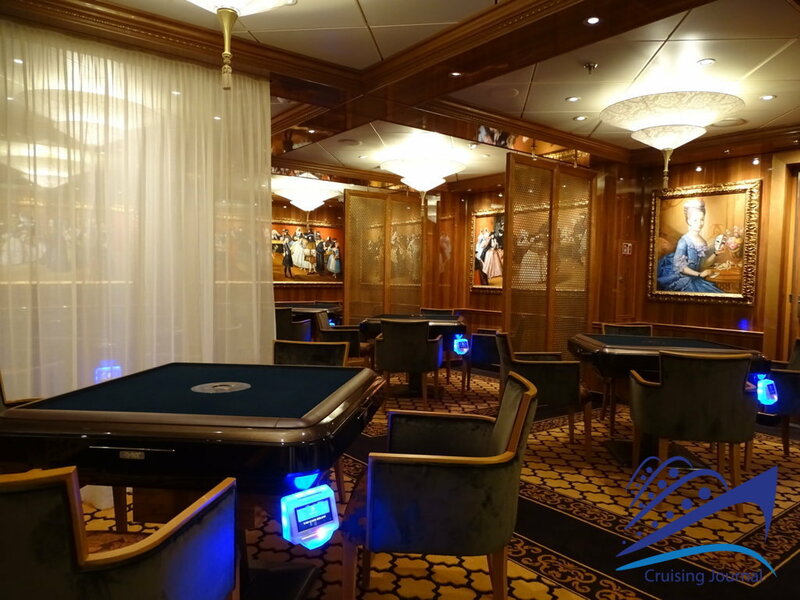 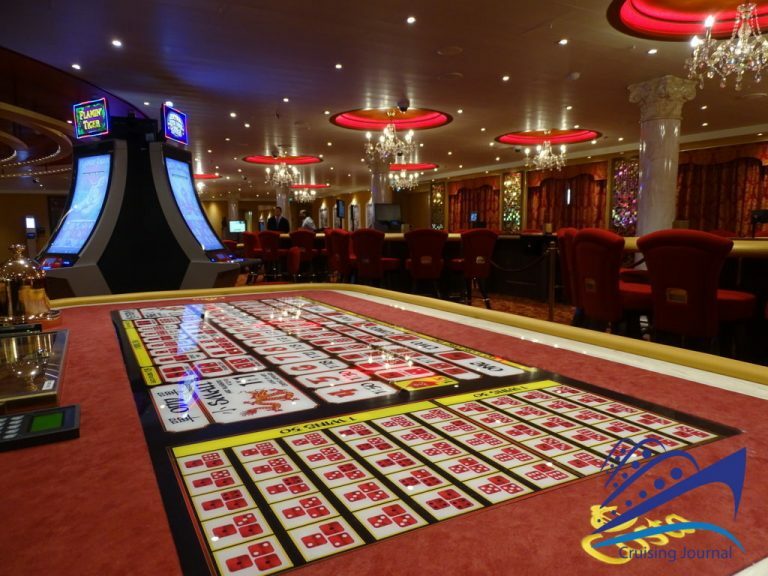 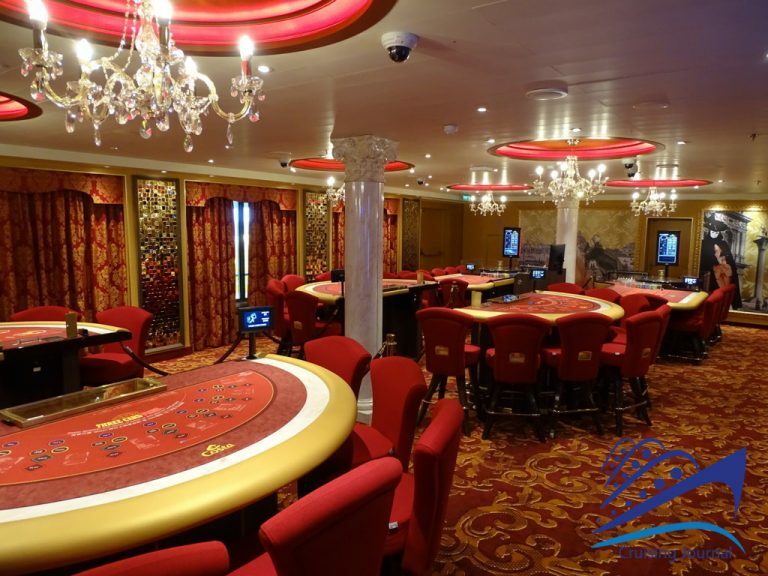 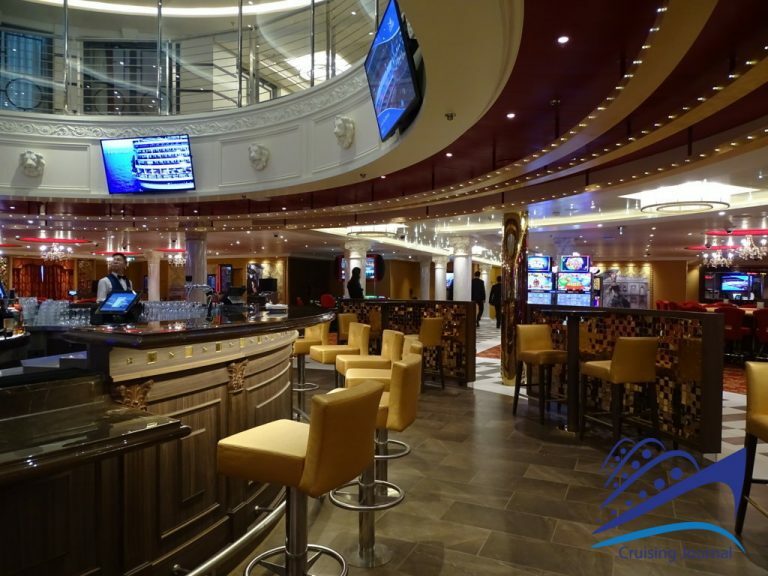 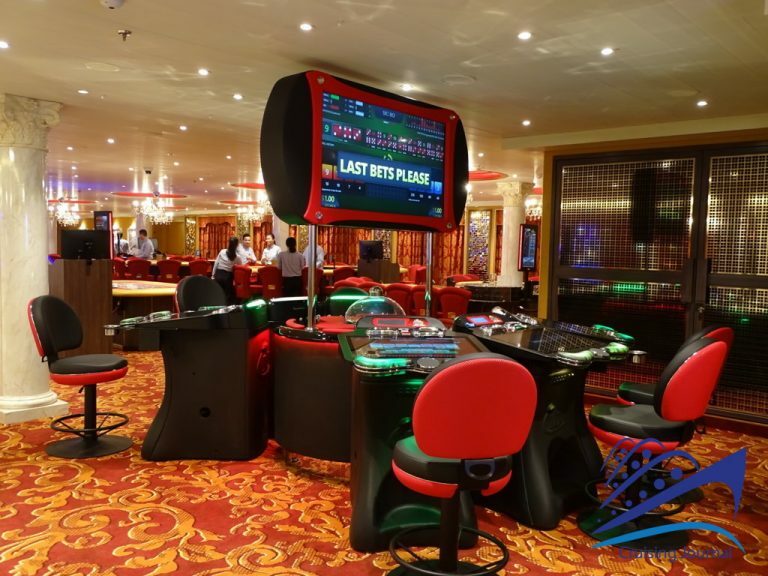 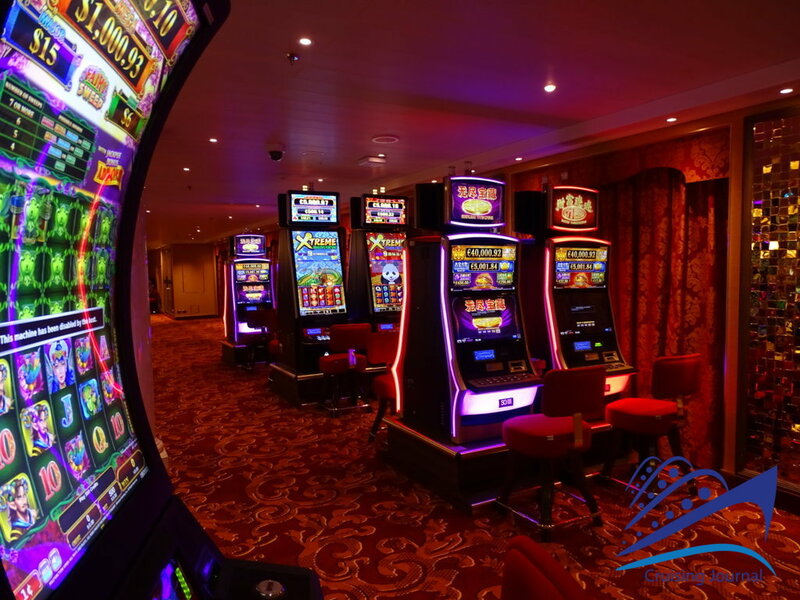 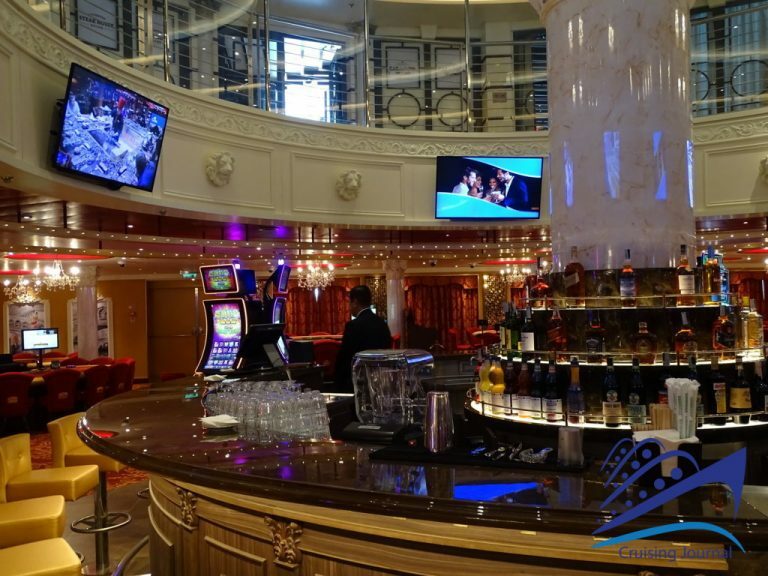 Moving instead toward the stern you will encounter the Dea Bendata Casino, serviced by a large circular bar and equipped with numerous tables and slot machines. On the left, continuing still in the direction of the stern, there is an elegant Game Room, an Art Gallery (that also runs along the corridor), and the Masque Lounge. 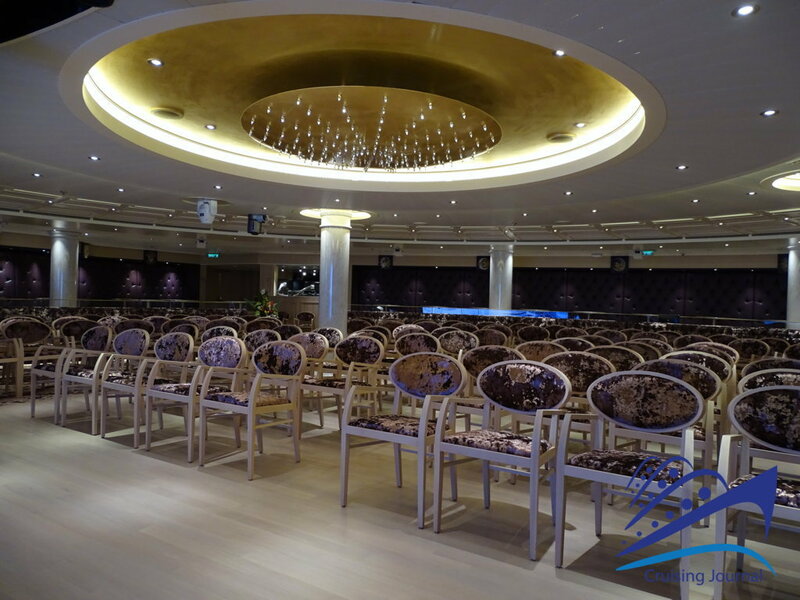 This last room can be used as a conference room or as a dance club at night, and features a large dance floor and its own vast bar. 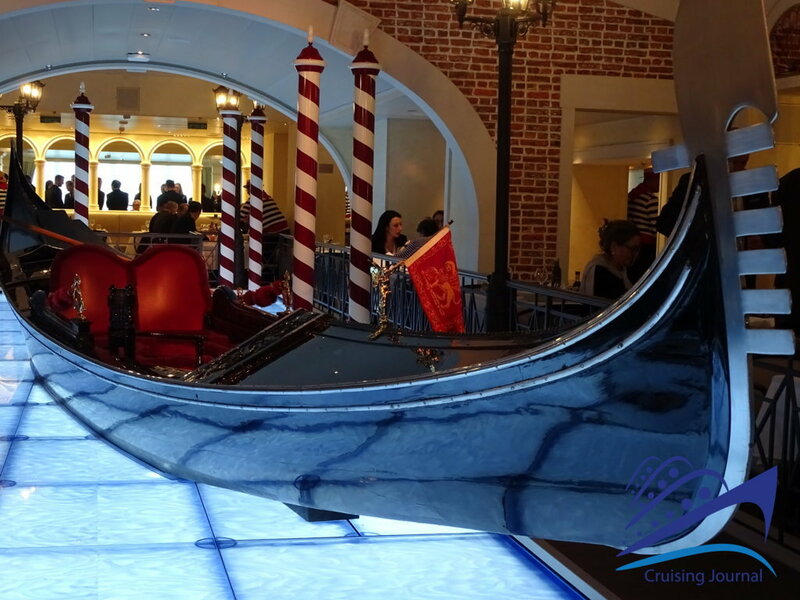 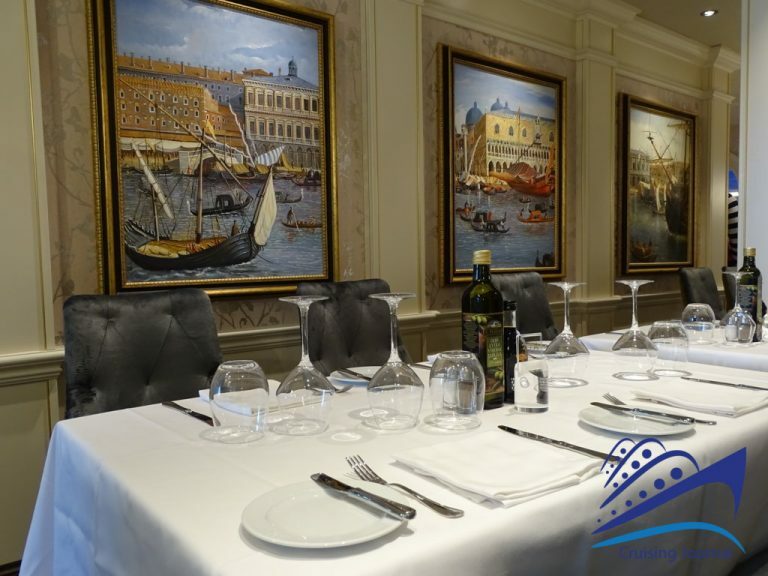 At the end of the stern is the upper level of the Canal Grande Restaurant, the most spectacular area, with a reproduction of a canal in the center of the room, a large gondola moving through it, and a beautiful view through glass windows to the sea at the end. 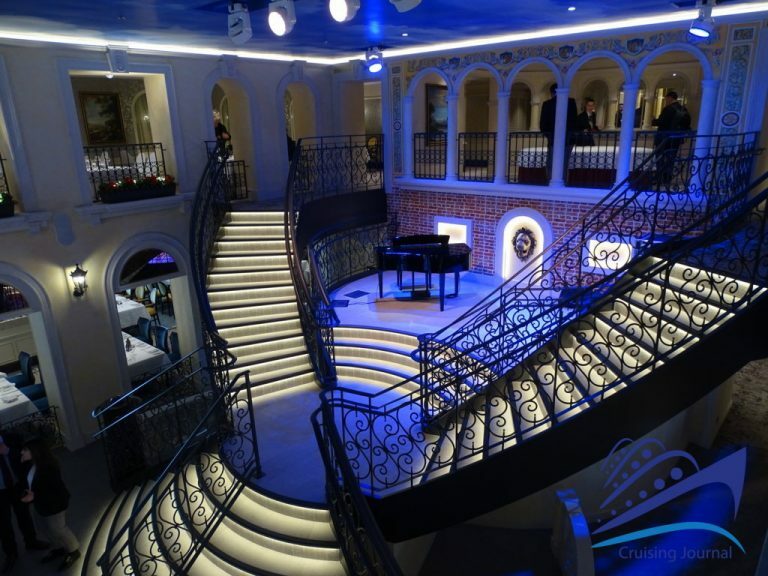 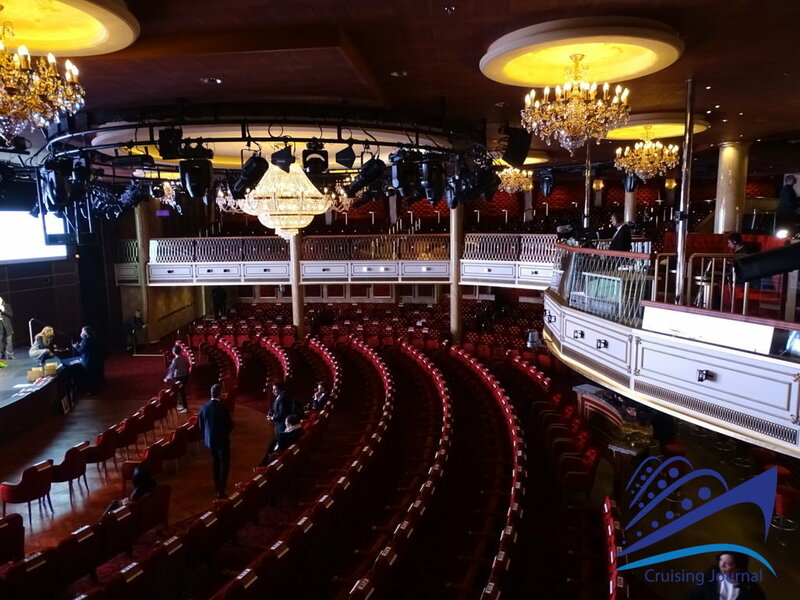 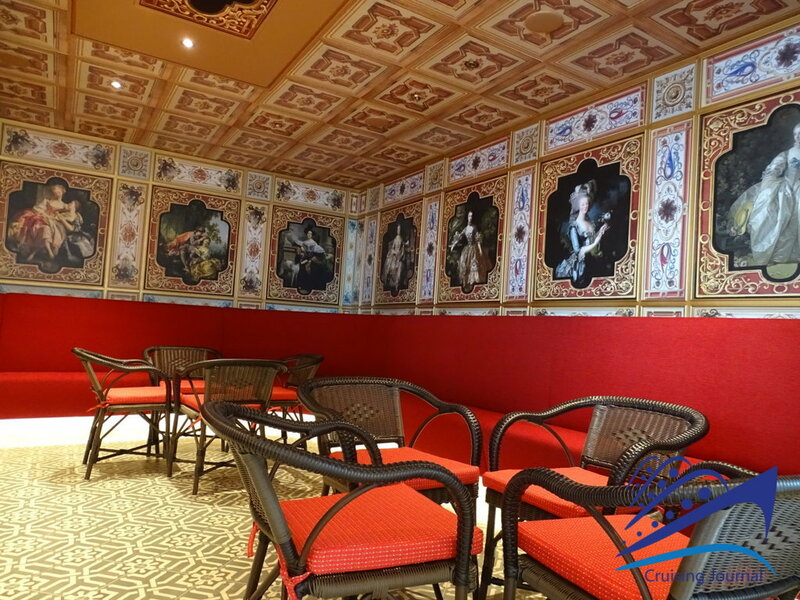 The stage of the Teatro Rosso is located in the bow of deck 6, along with some stores in the further balconies that open on the center of the ship along the Pizza San Marco. 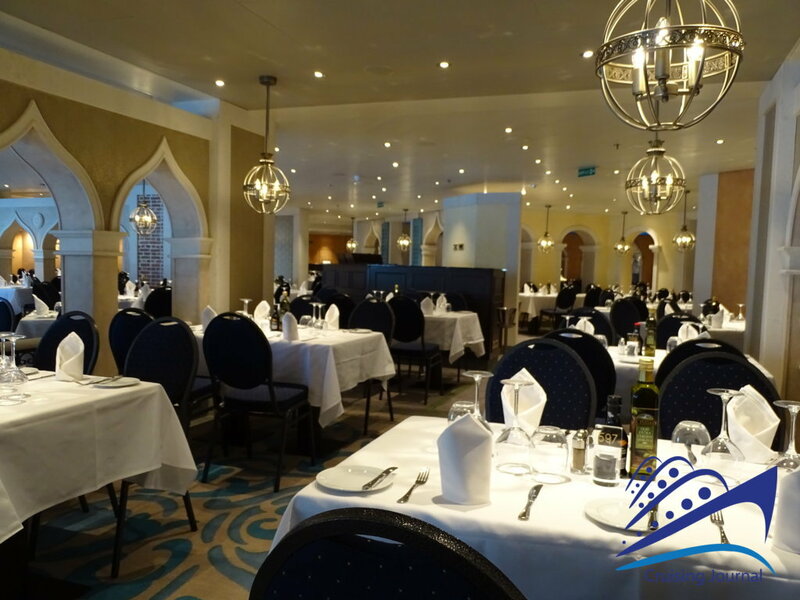 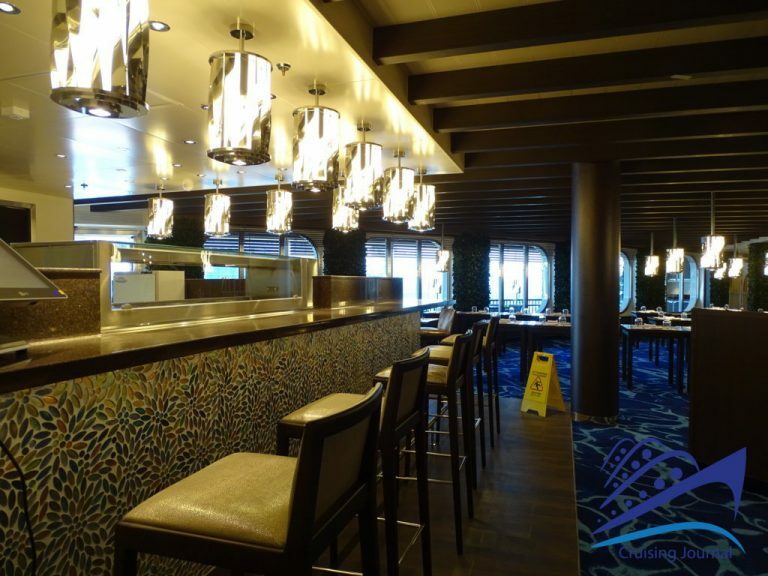 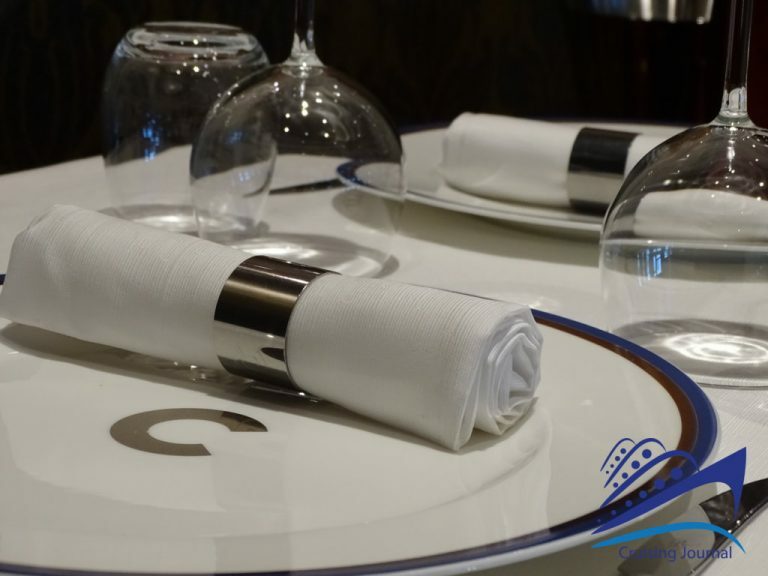 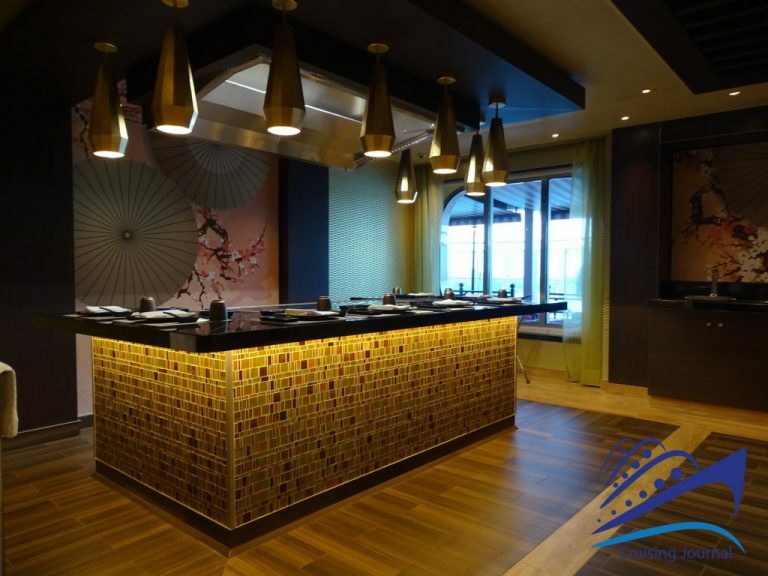 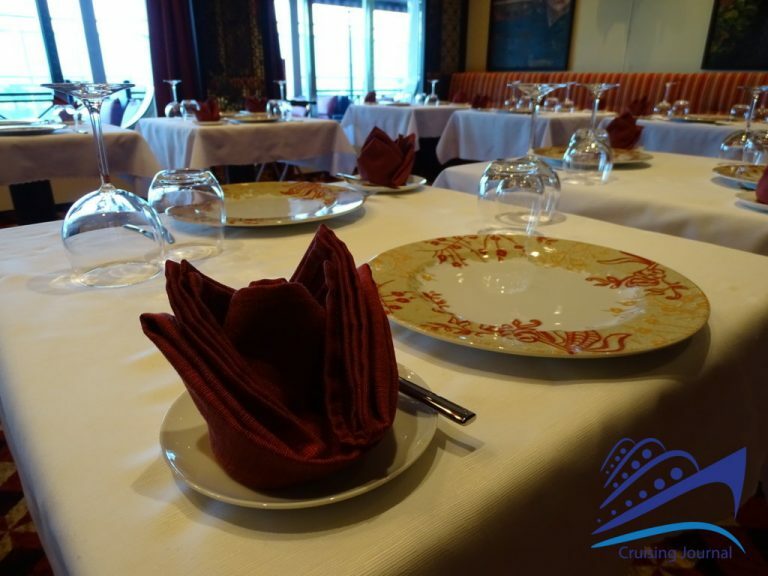 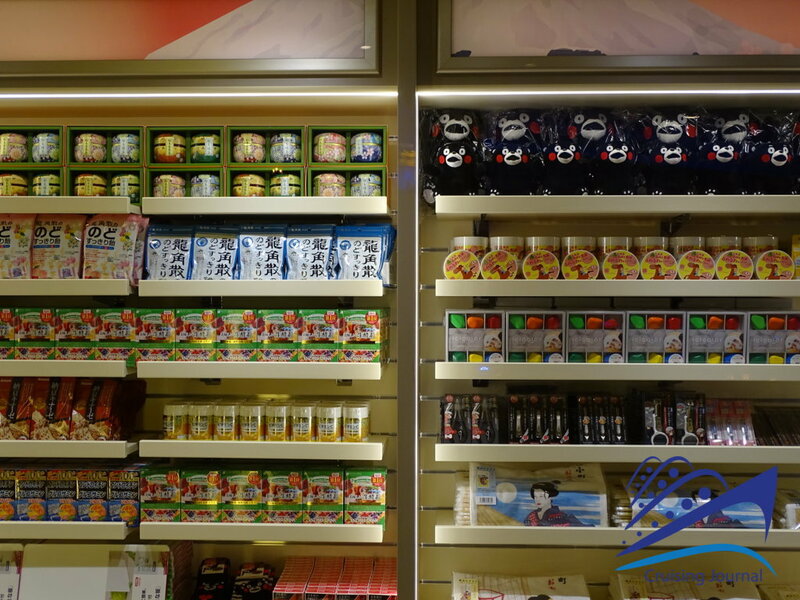 Continuing on, you will encounter some specialty restaurants on board. 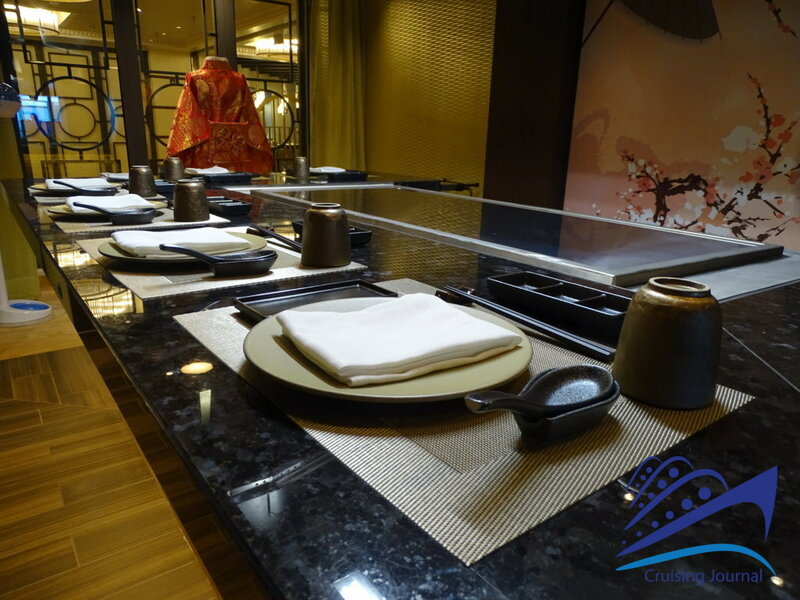 The first of which are the Yan Teppanyaki and the Lu Hot Pot, located in front of each other. 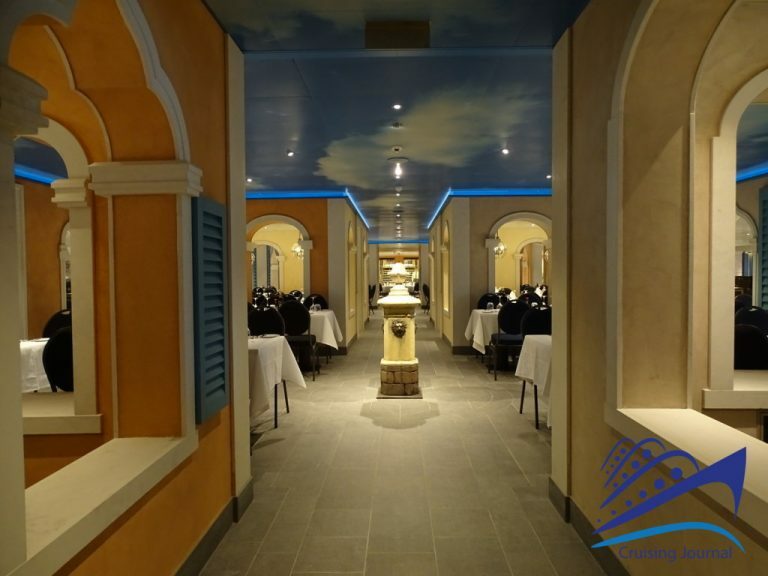 On the right, going toward the stern, you will find the Casanova Restaurant, in perfect Venetian style, and the Fiorentina Steak House, a little intrusion of Tuscany in the middle of all this Venetian inspiration. The Bella Bar opens on to the center of the ship and serves drinks and cocktails, perhaps for while waiting to be seated at the Frutti di Mare Restaurant that is positioned right in front of it, and features low tables and a high bar with barstools. The stroll through Costa Venezia continues past the Galleria Shops that, with the area Calle Larga Boutiques, represents another large space dedicated to shopping. 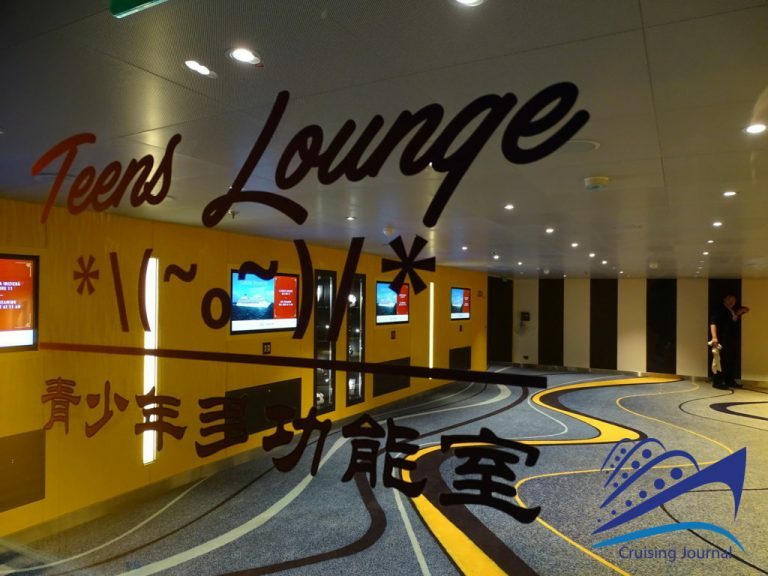 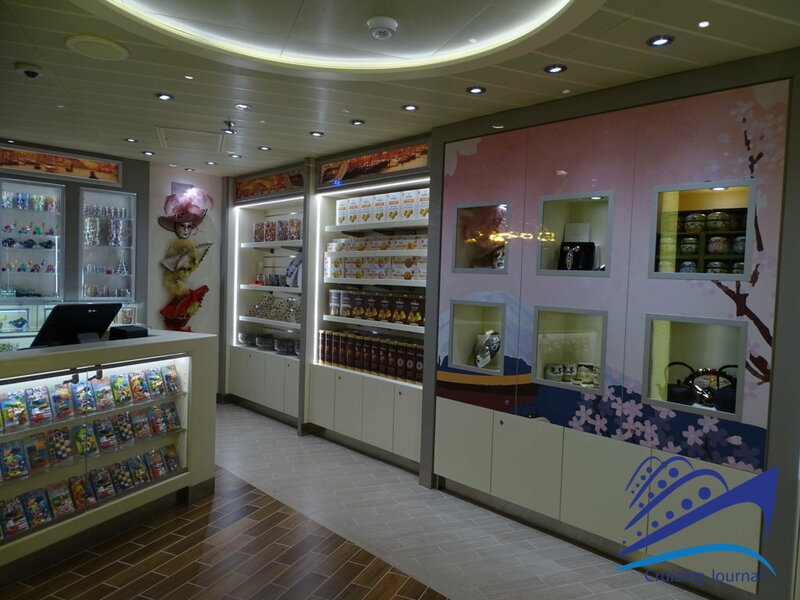 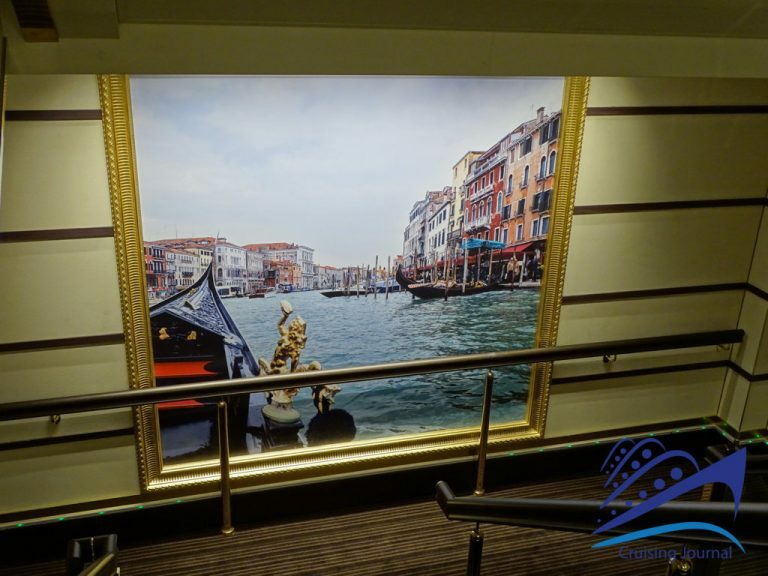 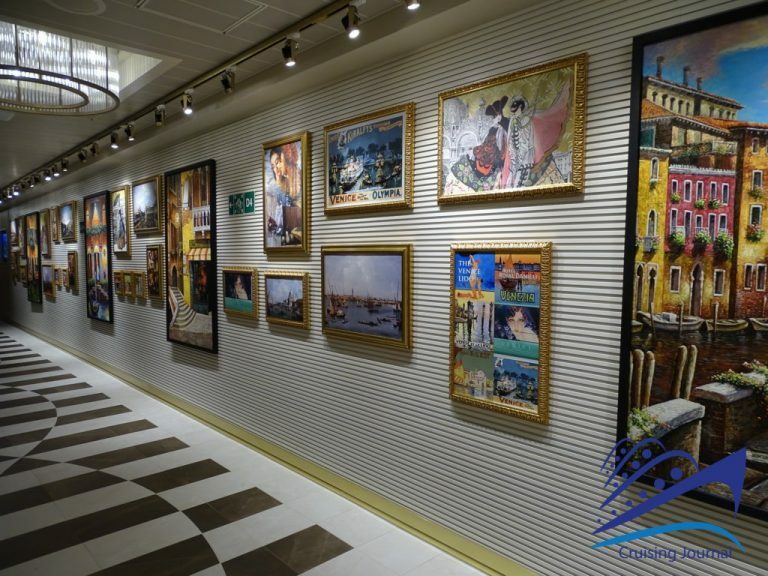 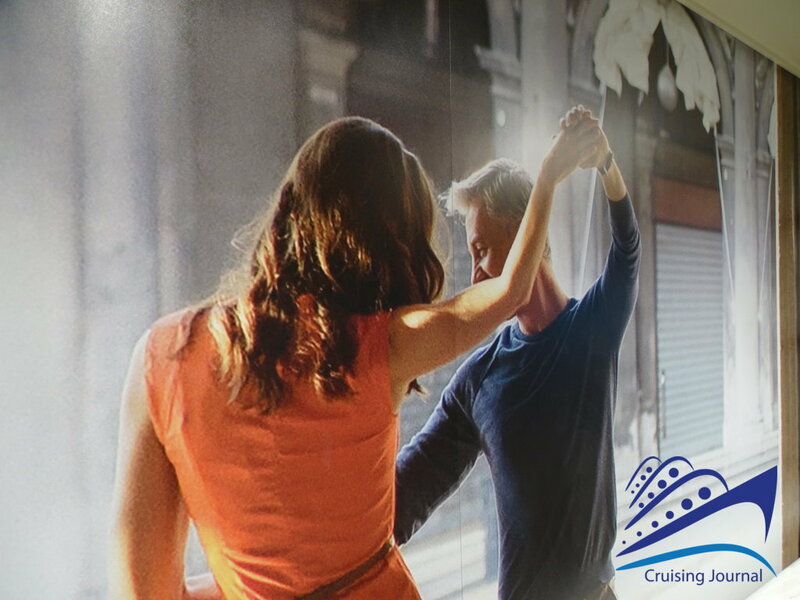 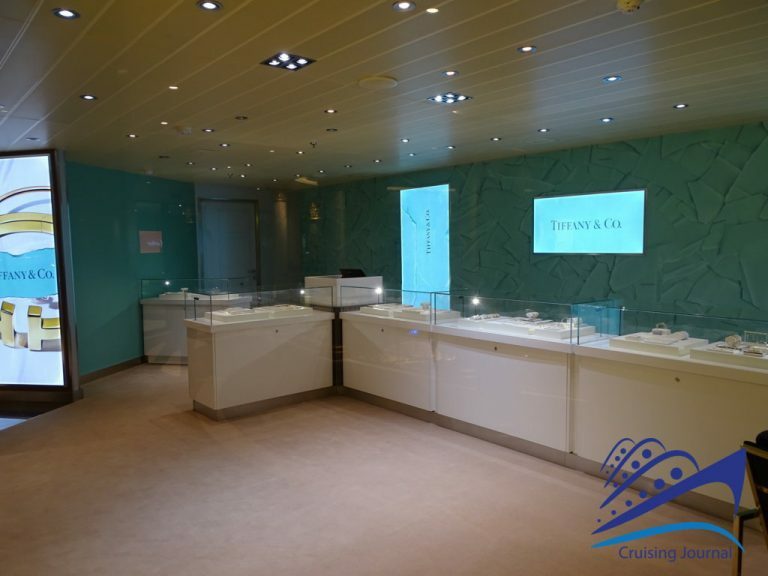 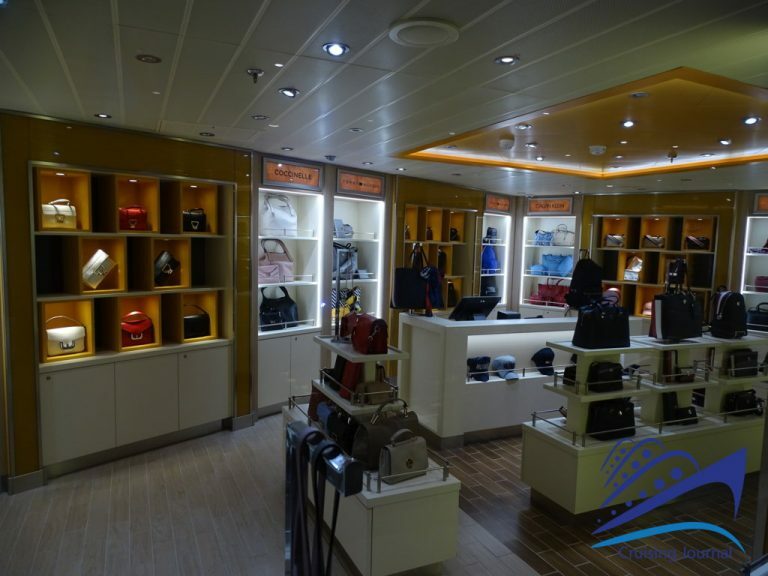 Located at the end of the Galleria is the Photo Gallery, completely digital, where you can peruse the photos taken by the staff during the cruise. 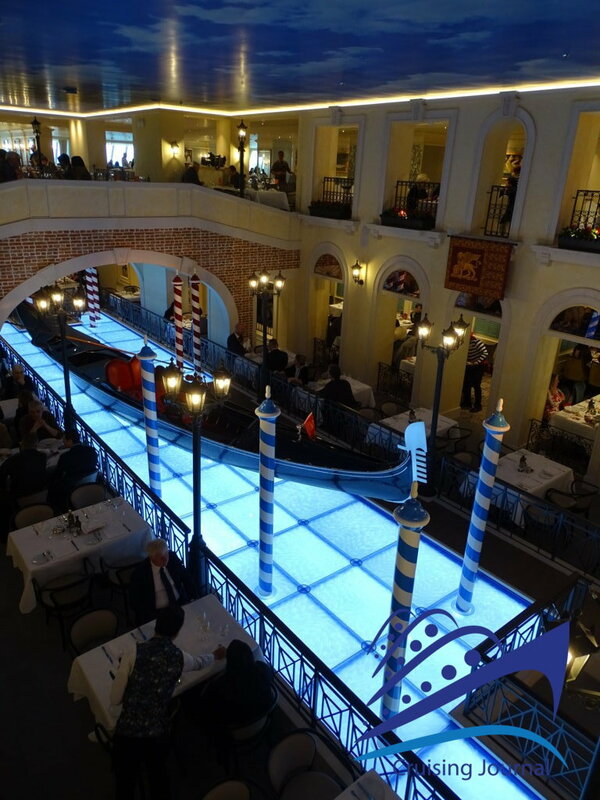 This brings us to the Gondola Lounge, characterized by a huge restored gondola that dominates the ballroom. 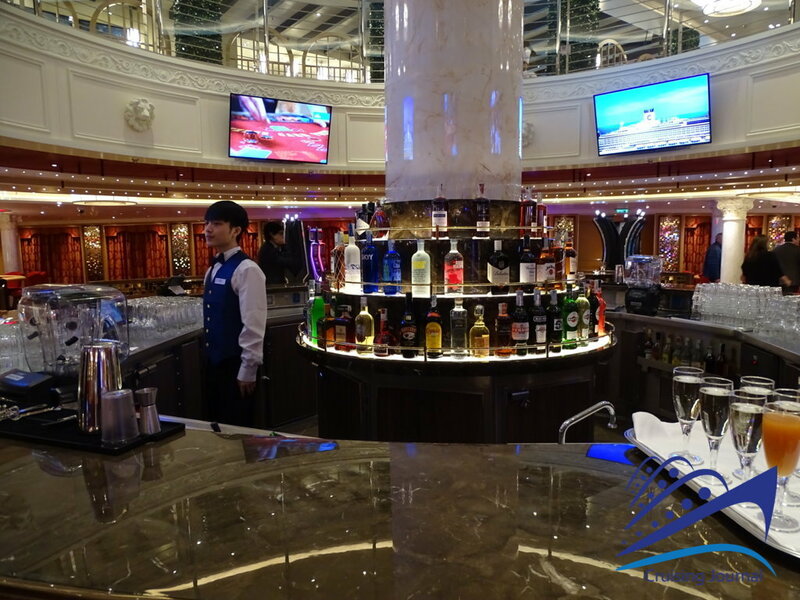 There is a dedicated bar, and in one corner sweet and salty snacks are served. 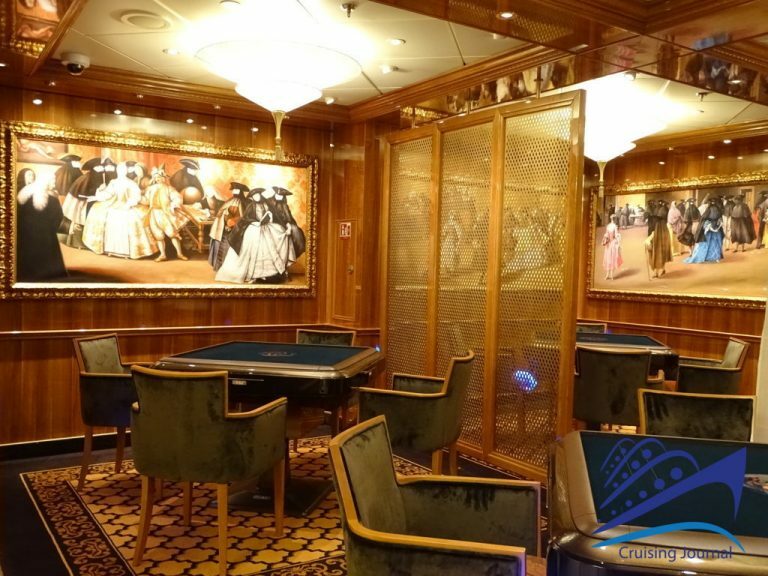 From here at the end you will find the Lounge delle Stelle, by going through the gallery of the celebrities. Watched by famous people such as Marilyn Monroe and Harry Potter, you arrive to the largest part of the Lounge that returns to a more subdued and elegant décor. 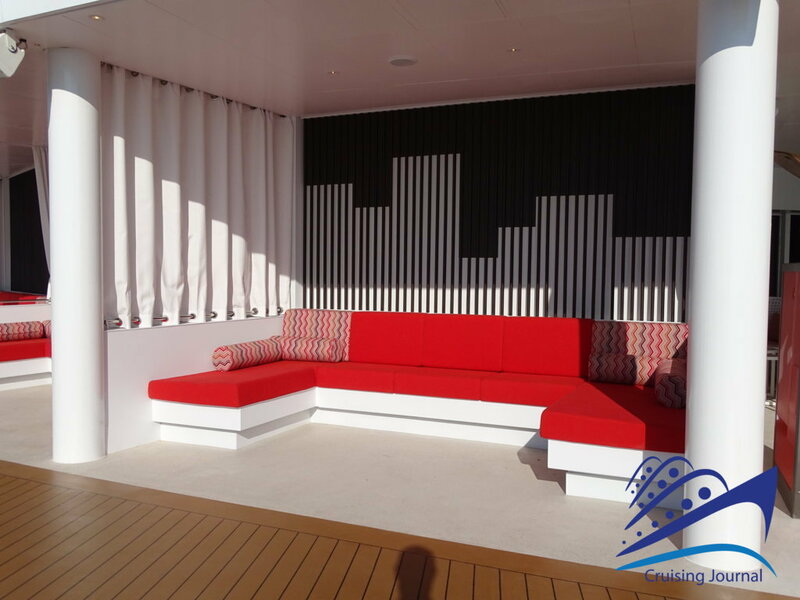 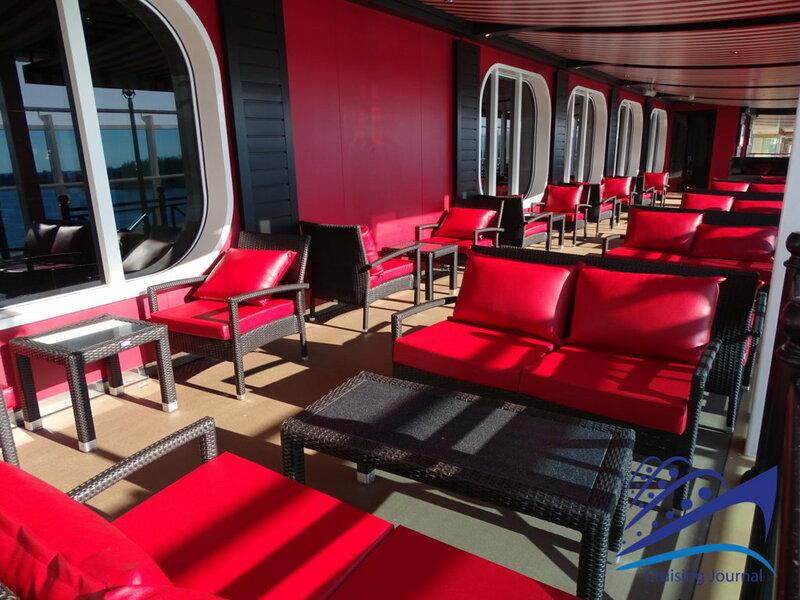 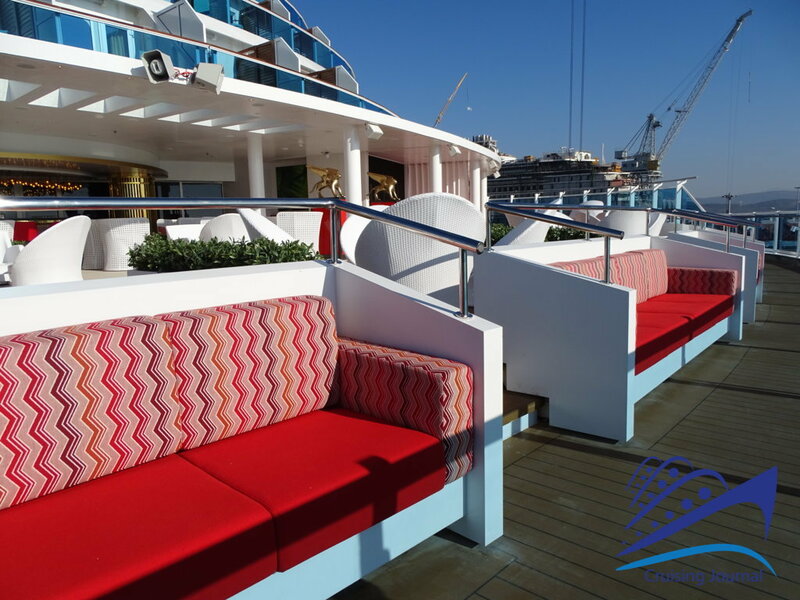 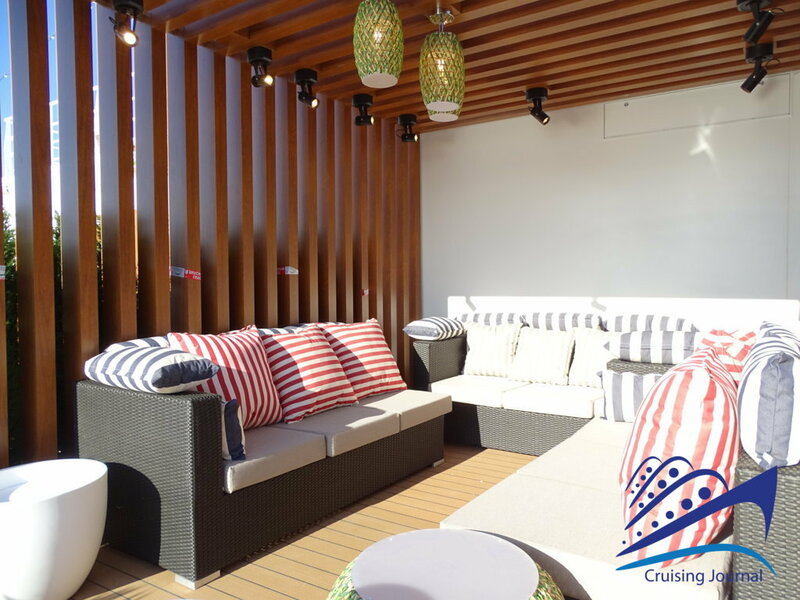 The lounge is served by a double bar, and offers a beautiful external area overlooking the stern, decorated in red and white tones, with comfortable sofas and chairs. 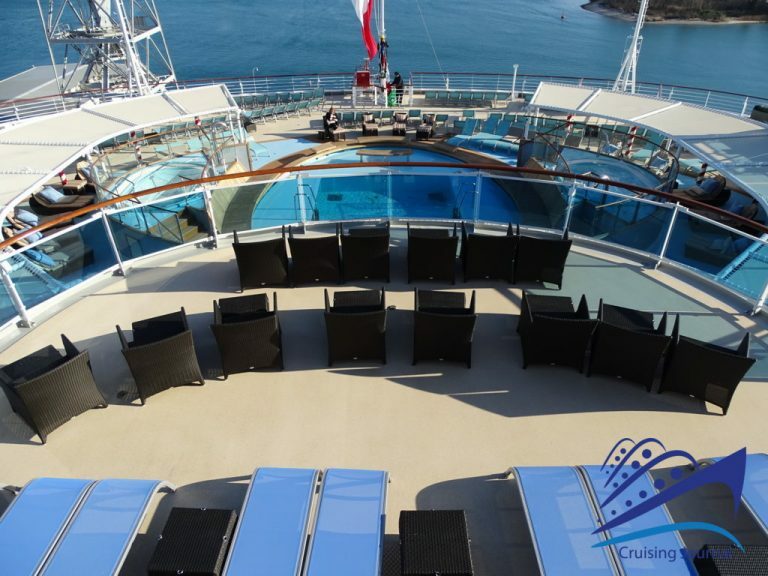 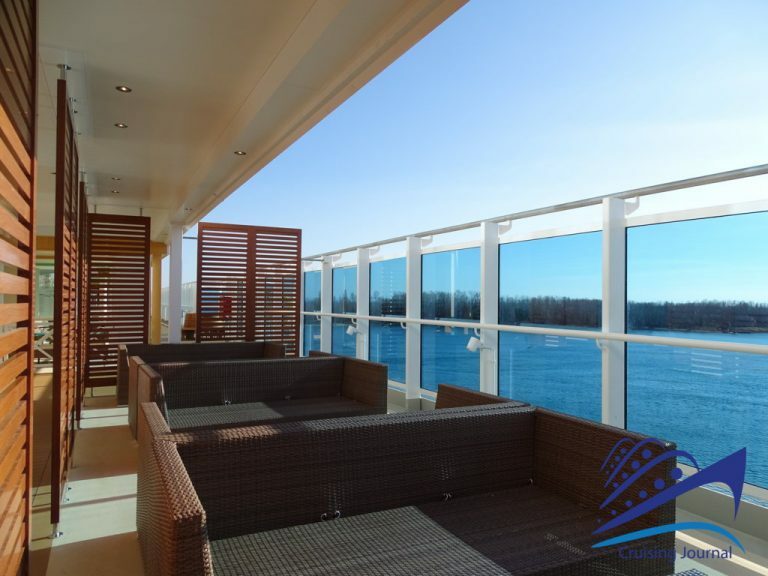 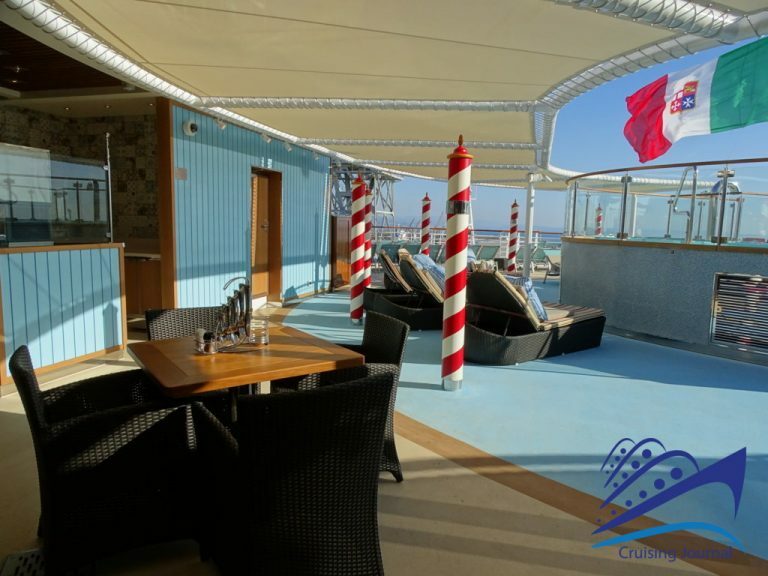 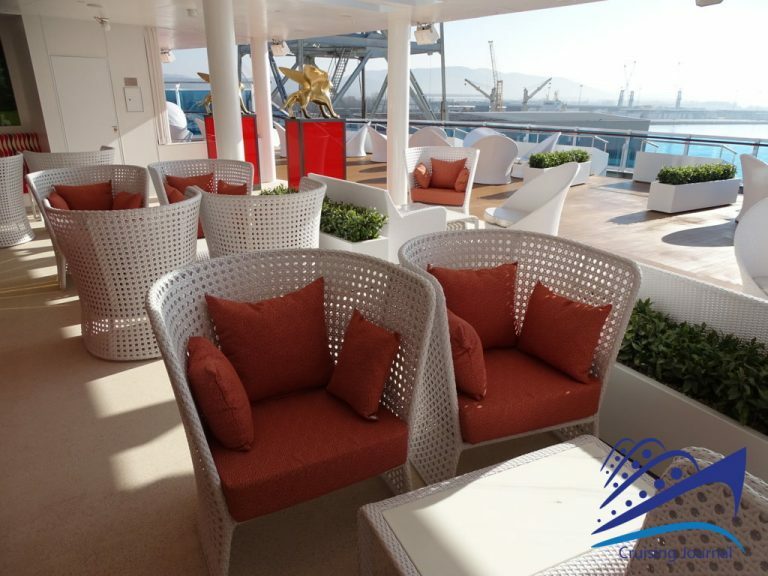 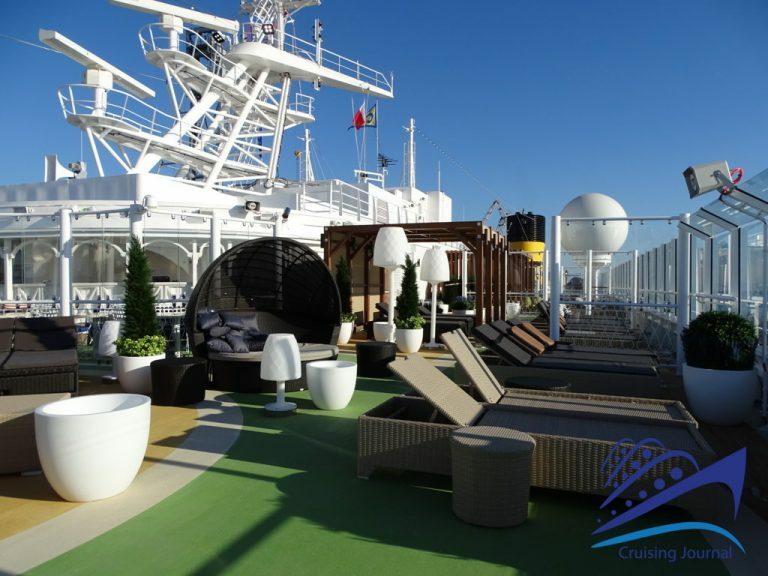 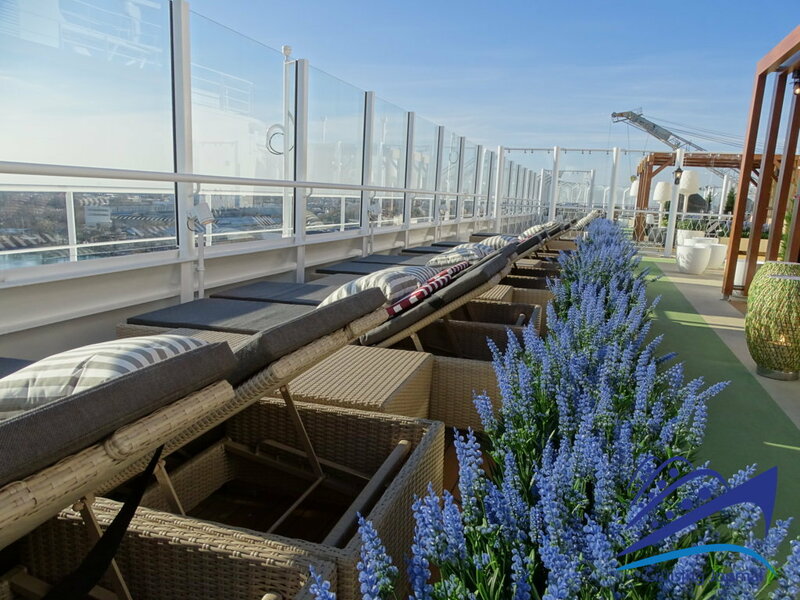 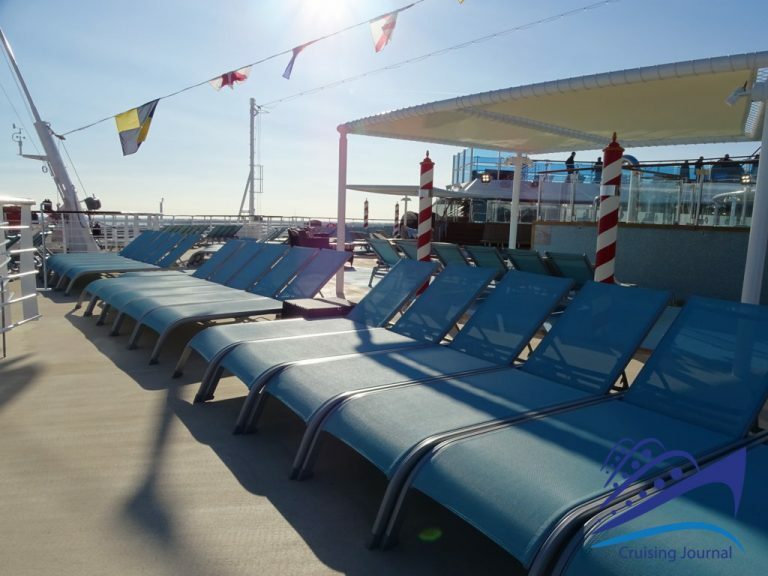 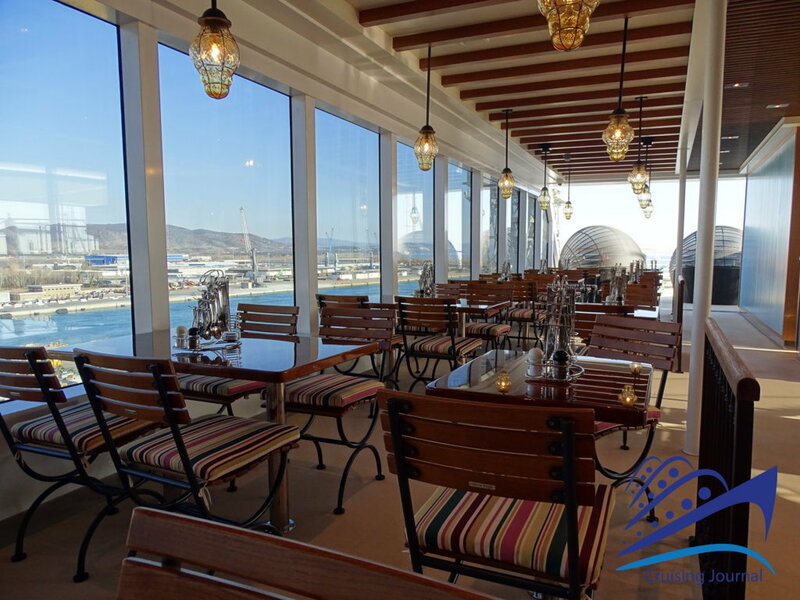 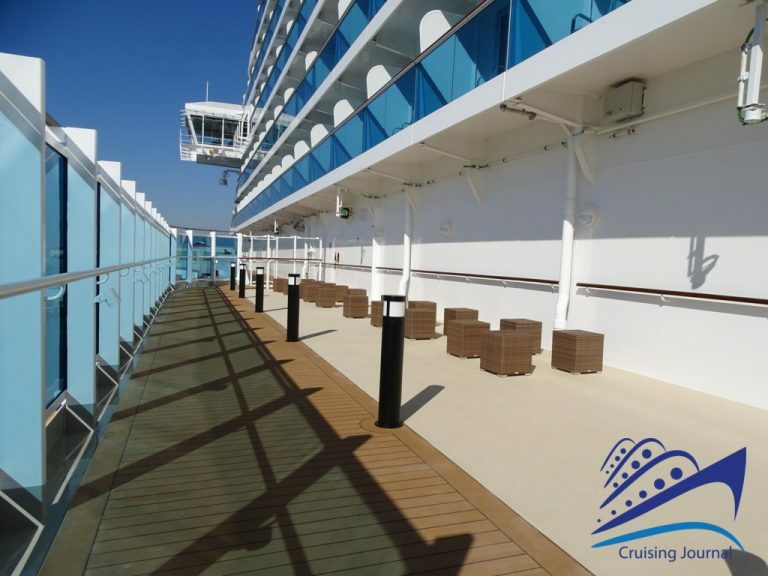 The entire deck 5 has an external Promenade that is very pleasing to walk and that has various areas equipped with armchairs, sunbeds, and tables that can be used also as an extension to the restaurants and their corresponding internal lounges. 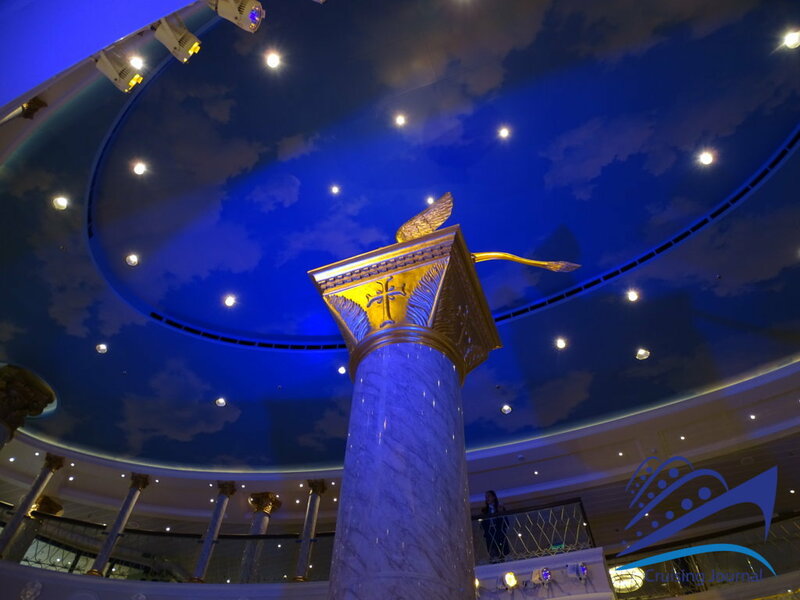 References to Venice, elegance, and innovation can also be found climbing to the highest decks. 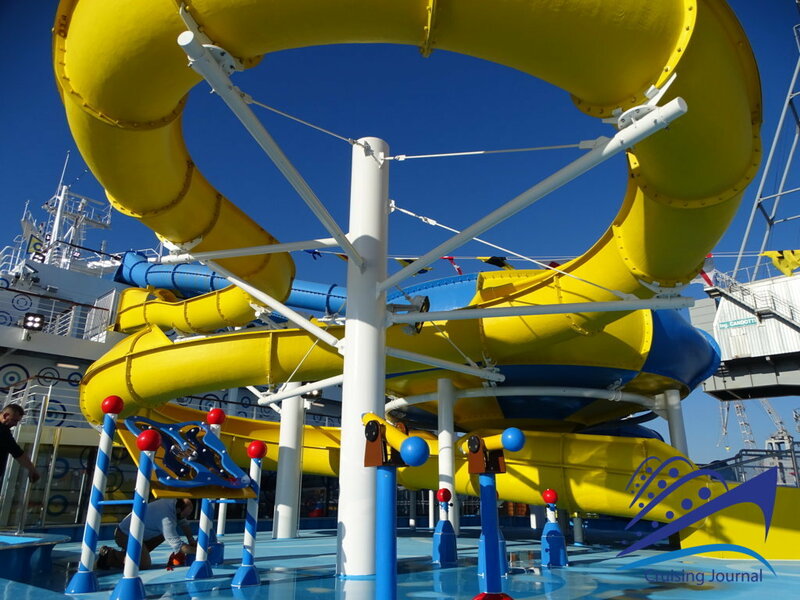 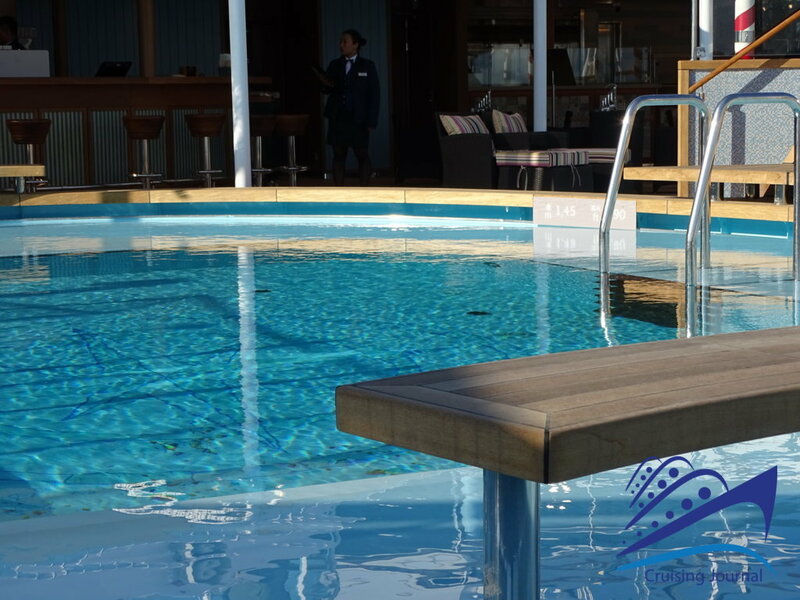 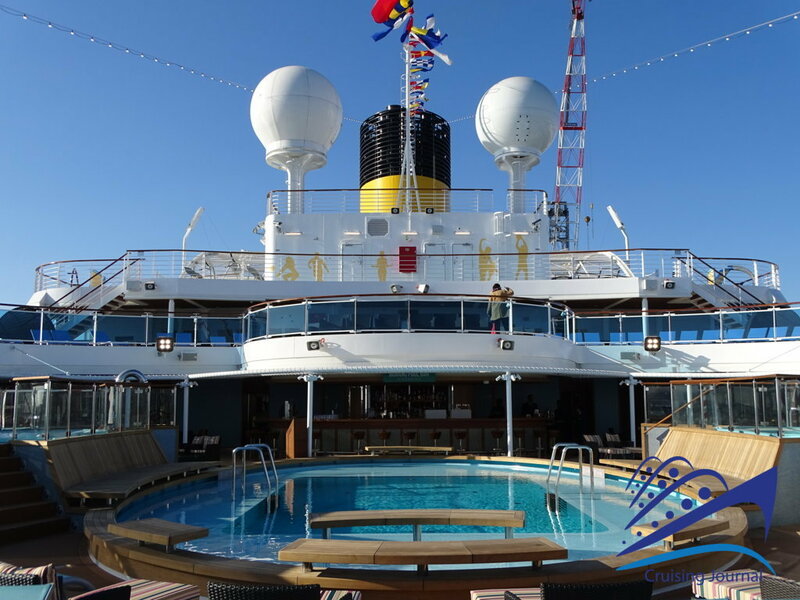 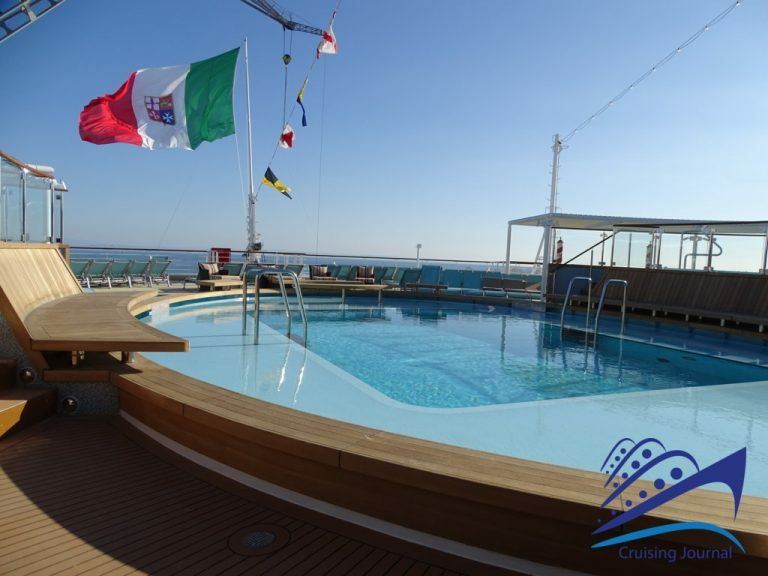 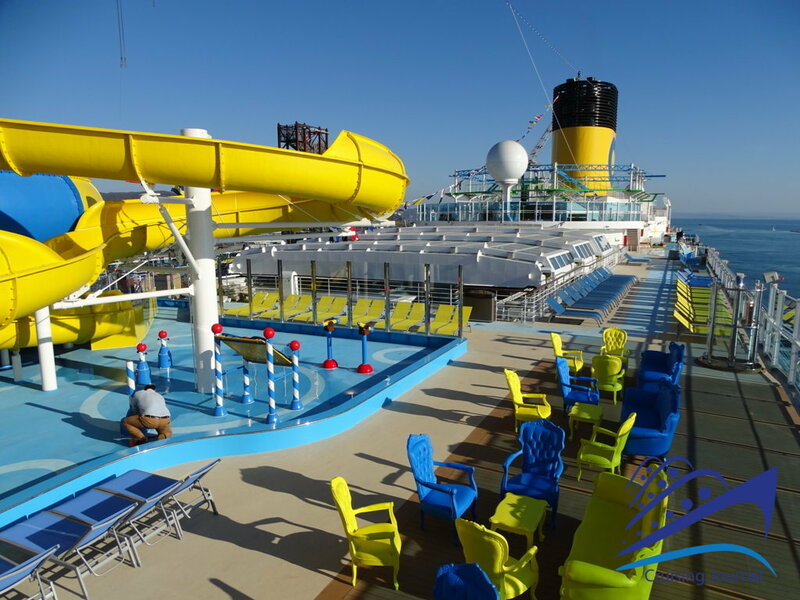 The Lido opens in the center area of deck 10. 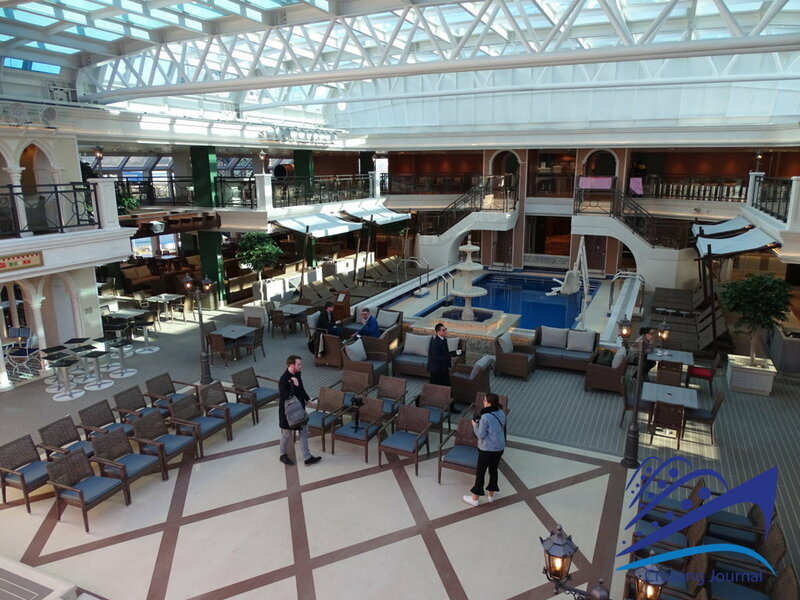 The pool is surrounded by the Lido Bar, which is similar to the Florian of Costa Atlantica except with lighter furnishings, and the Gelateria Dolce Vita, with elegant chairs positioned under an appealing loggia. In the area closer to the stern you can find the Burger Bar and the Dim Sum restaurants that represent the perfect place for an afternoon snack. 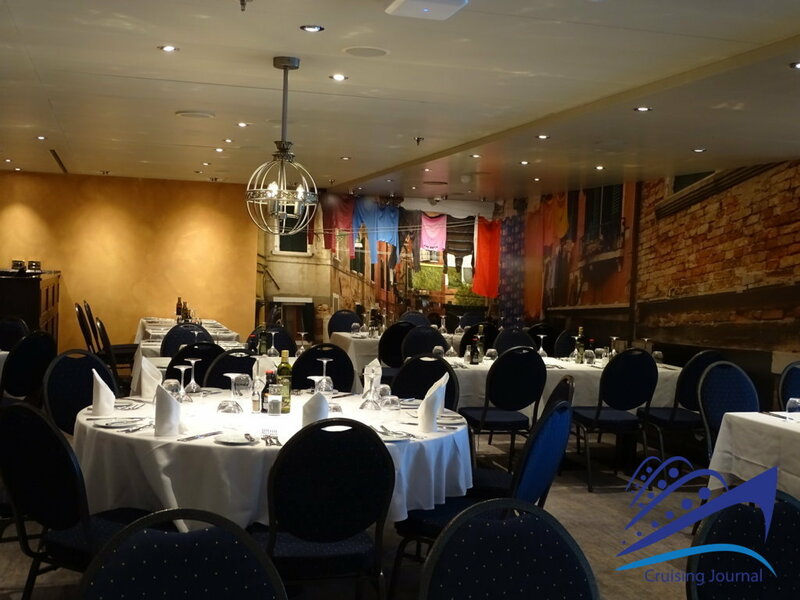 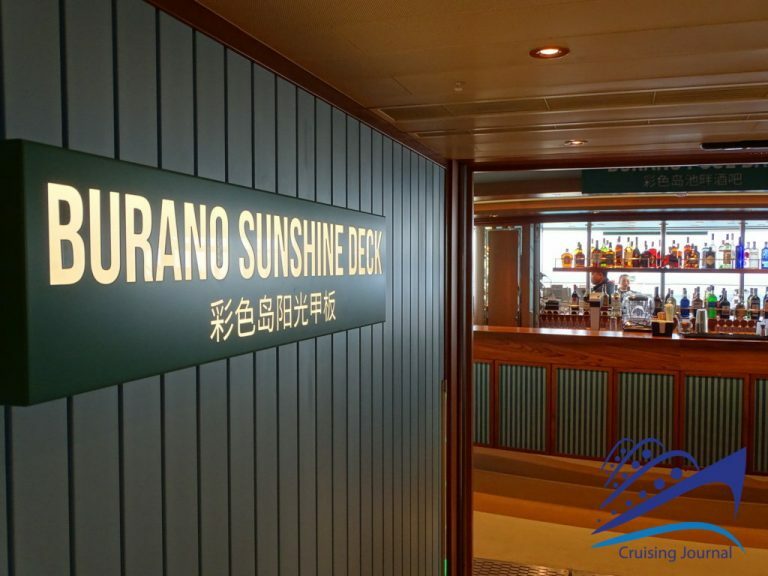 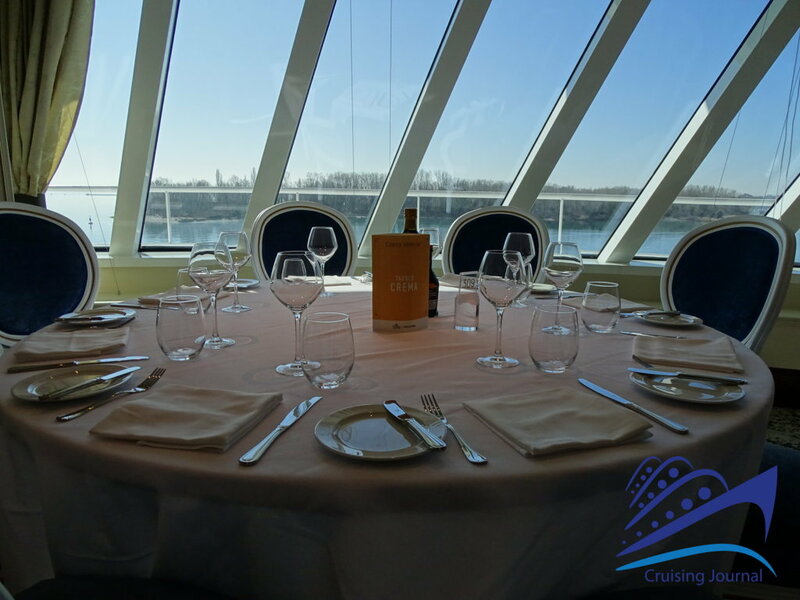 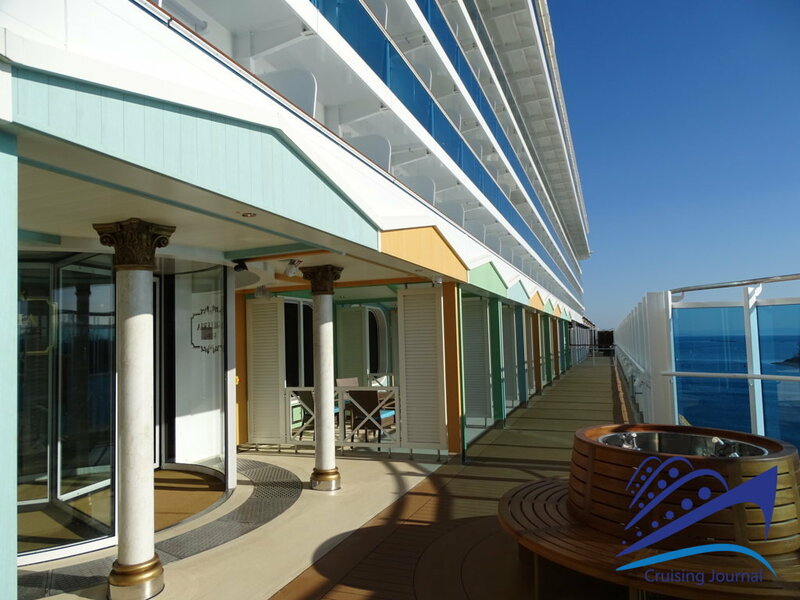 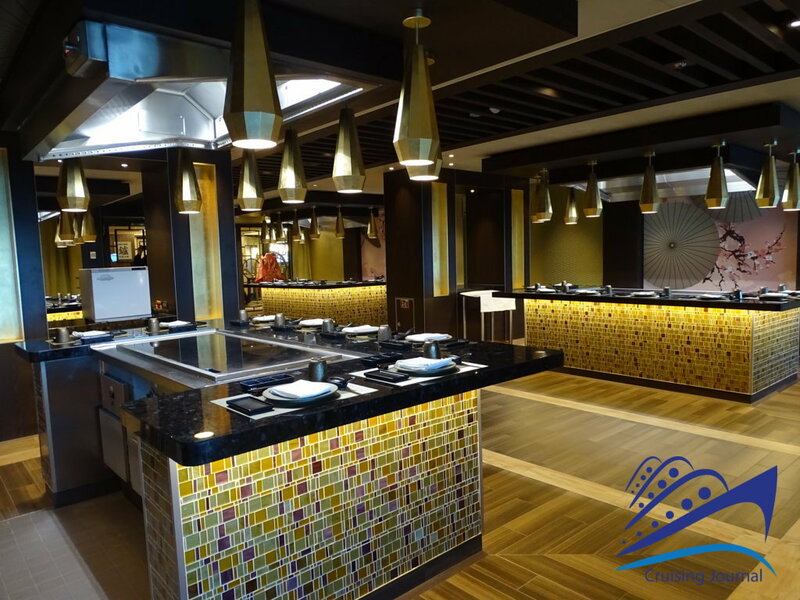 The bow of deck 10 is occupied by cabins while moving toward the stern you will find the Buffet Marketplace Restaurant and the Lido Burano. 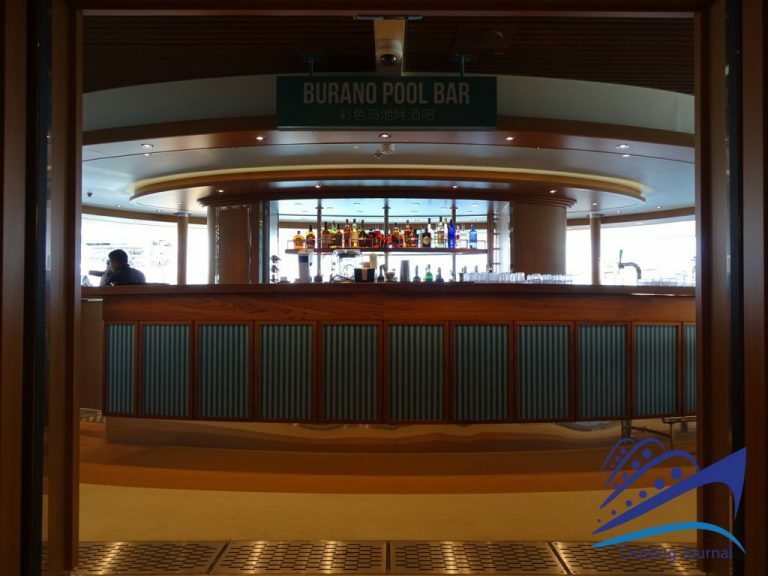 This last offers a relaxing pool area and two hydro-massages, the Burano Bar and tables for the Buffet, which allows guests to also dine outside. 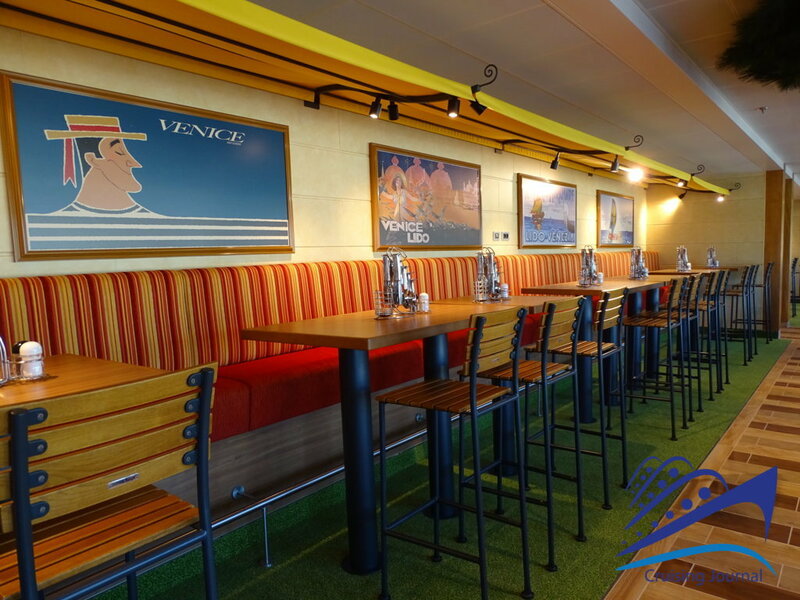 To one side you can find the Pizza Napoli, with its own tables, and on the other side the Seafood Shack, dedicated to fish alternatives. 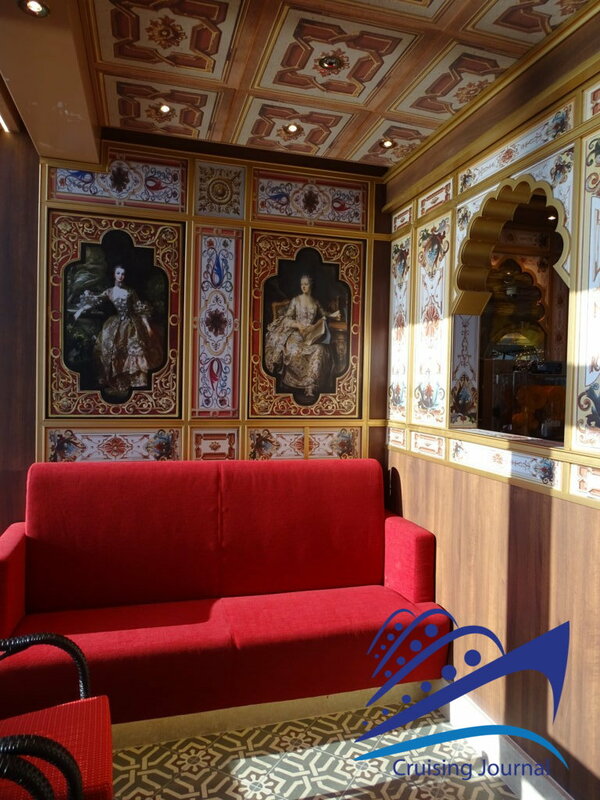 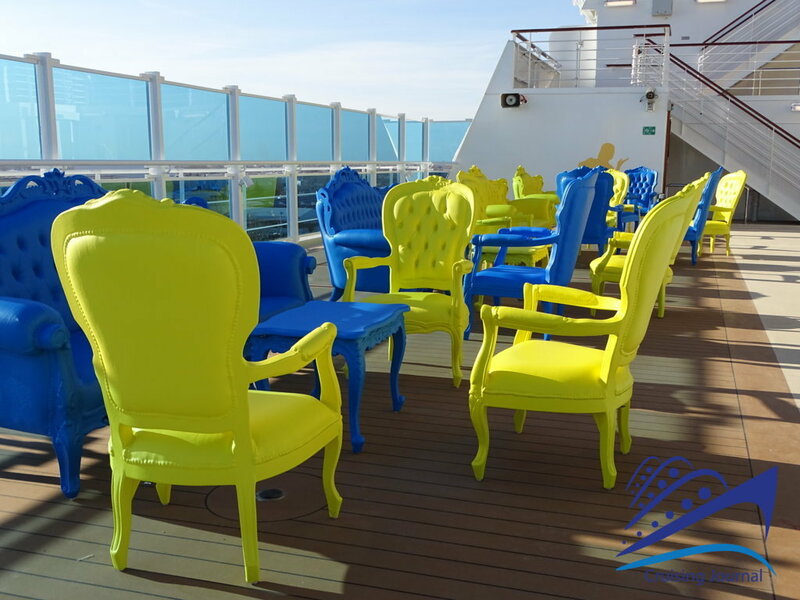 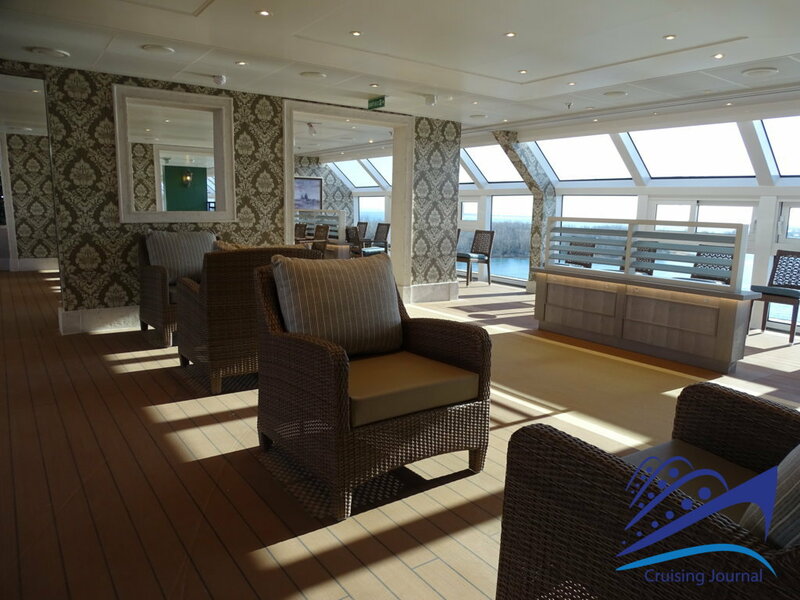 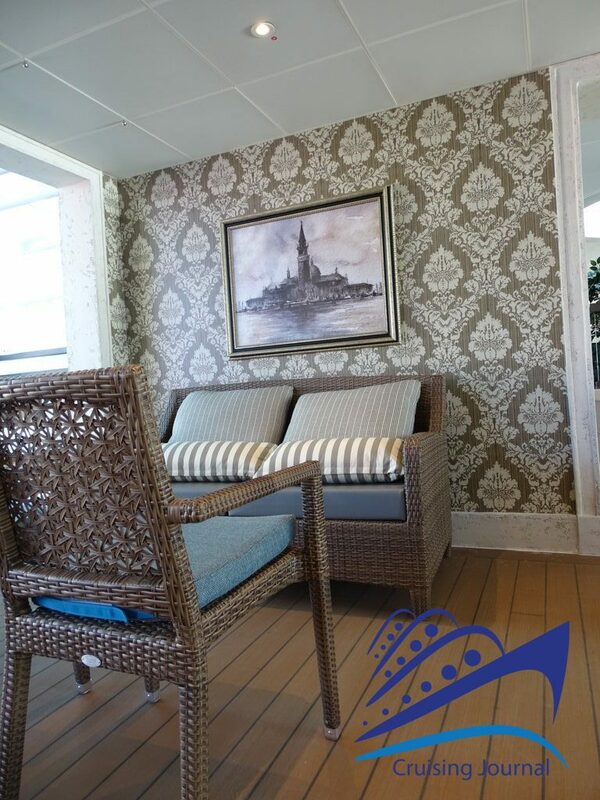 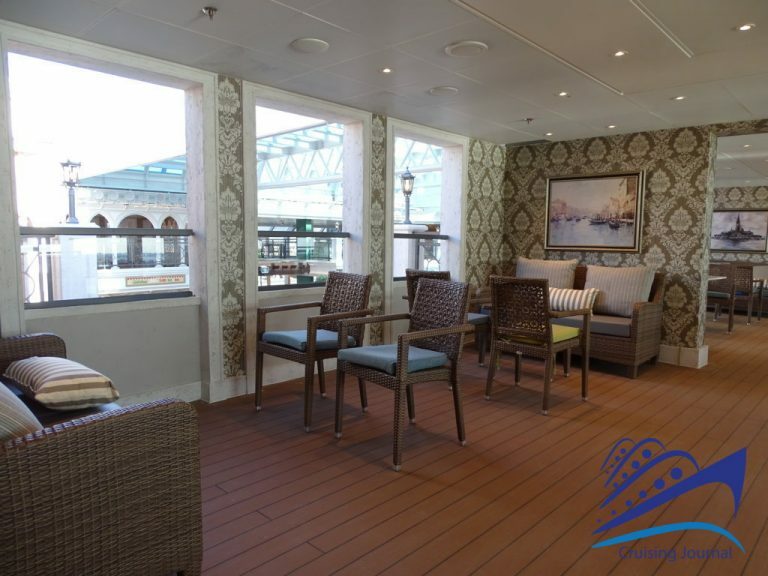 Deck 11 also hosts cabins at the bow, while the area overlooking the Lido offers a relaxing environment with elegant armchairs and beautiful Venetian villas depicted on the walls. 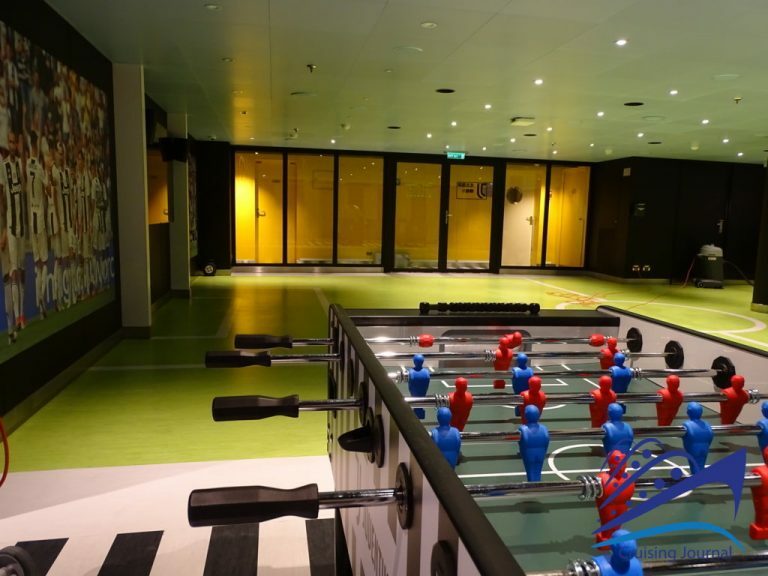 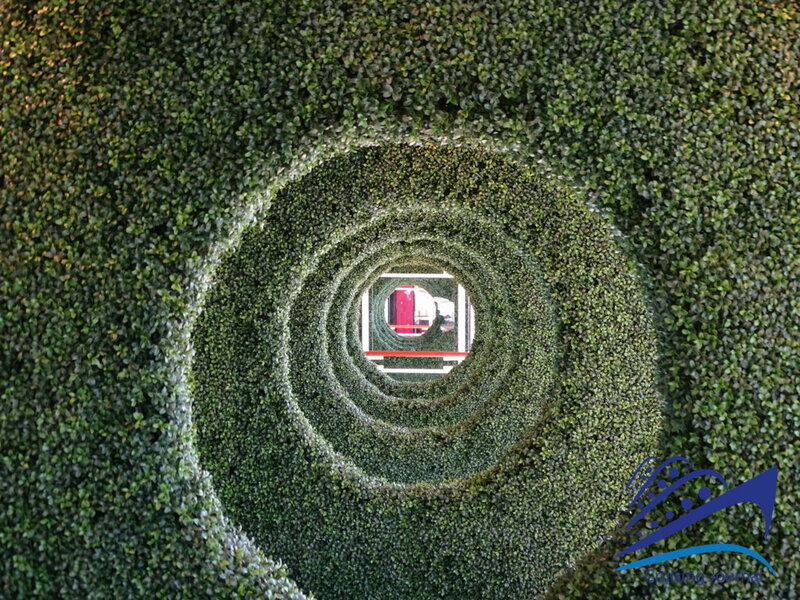 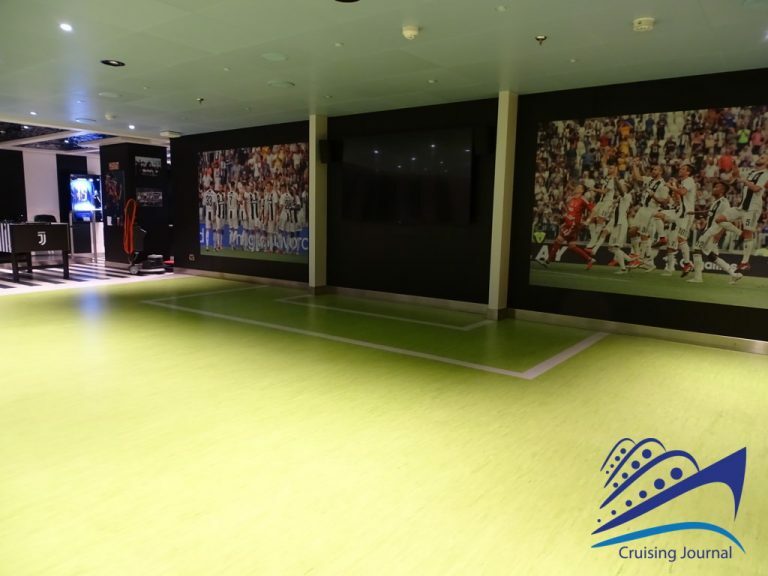 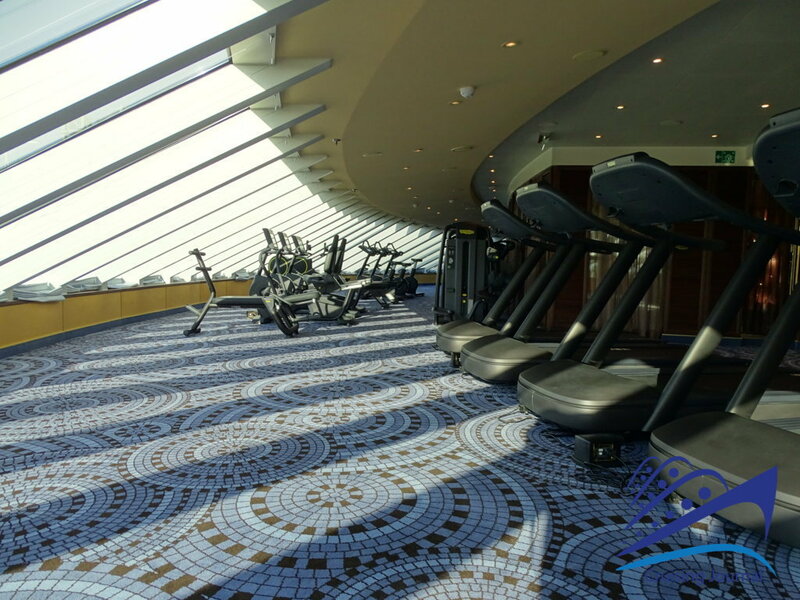 The stern area is dedicated to a very large Squok Club, and various sports activities, from a multipurpose basketball court, to outdoor exercise equipment. 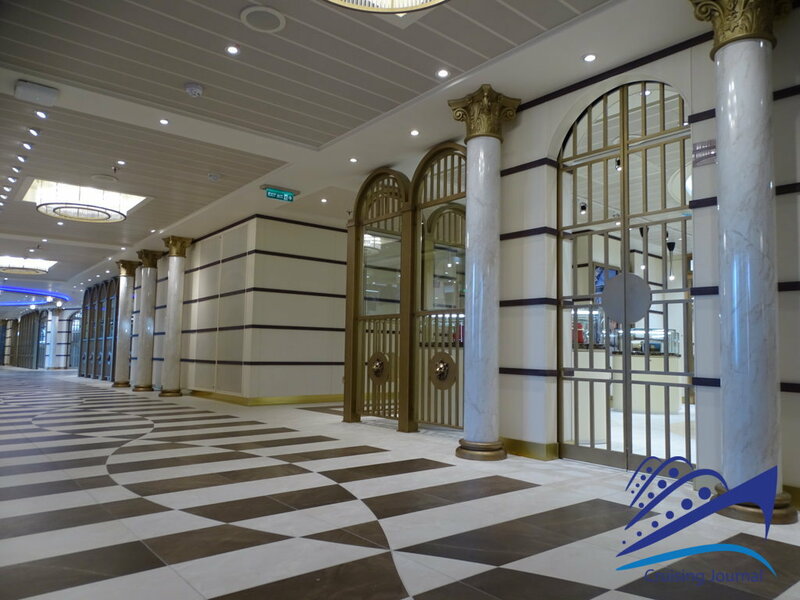 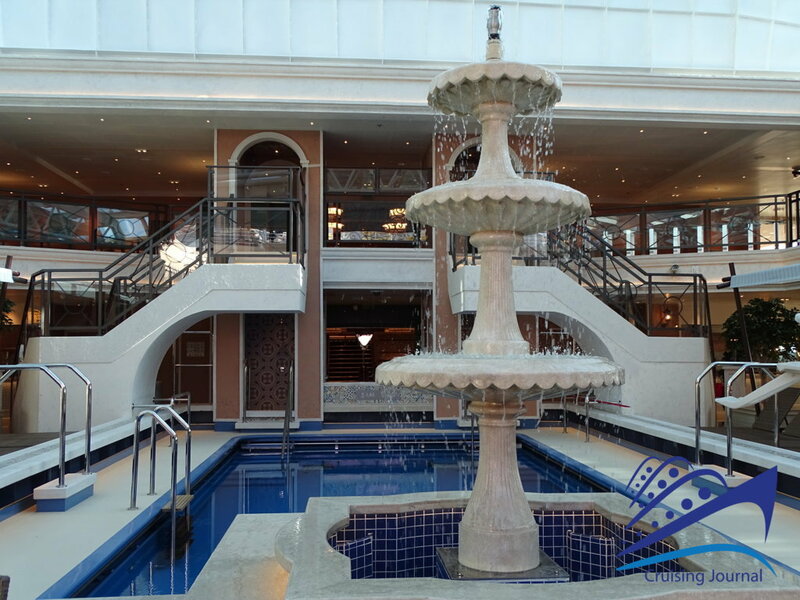 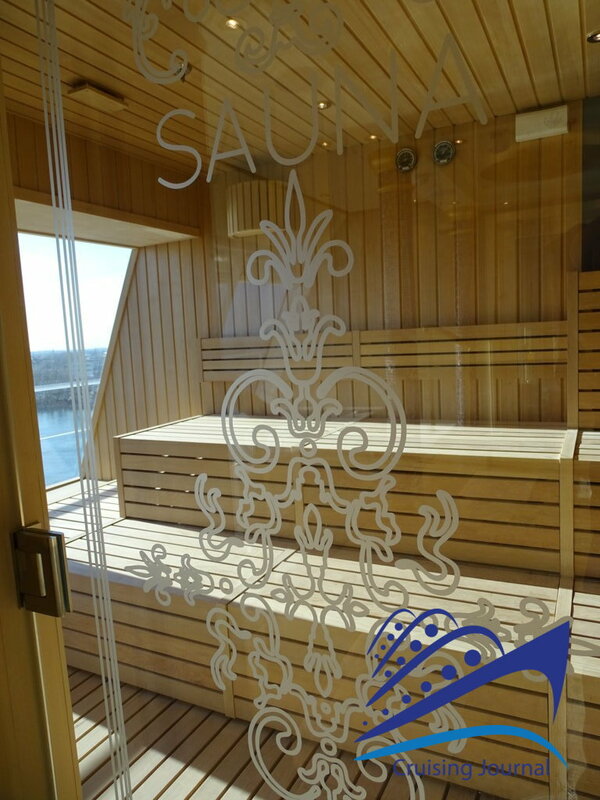 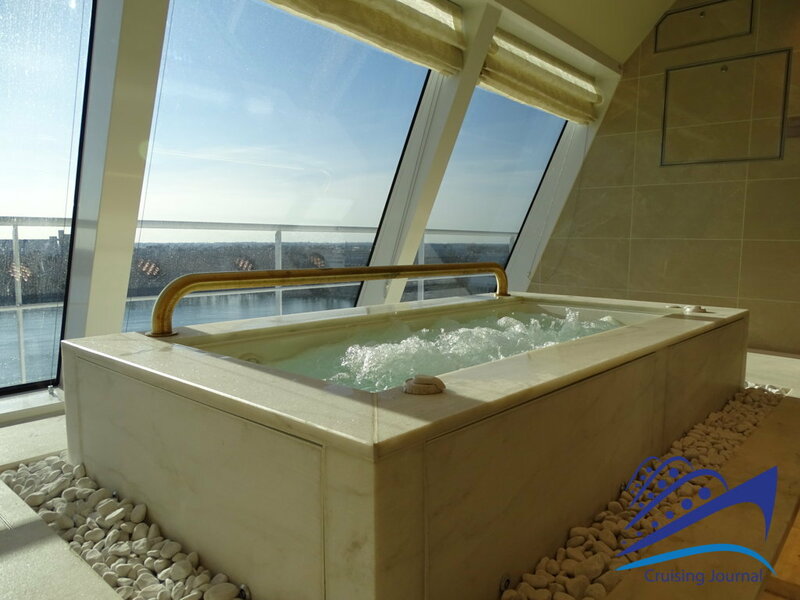 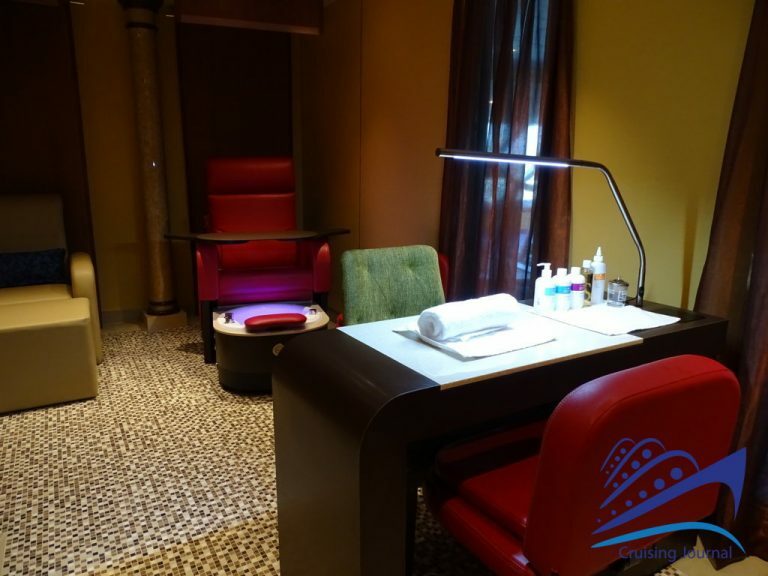 The bow of deck 12 is occupied by the Bellezza Spa. 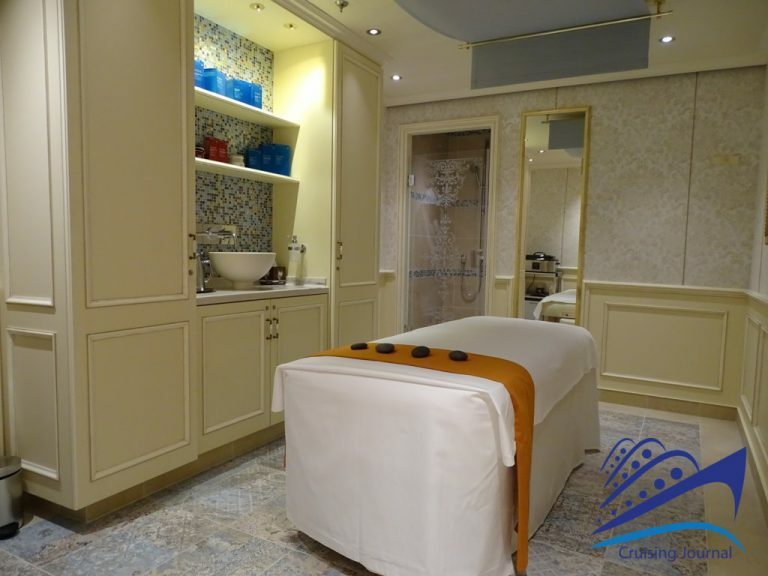 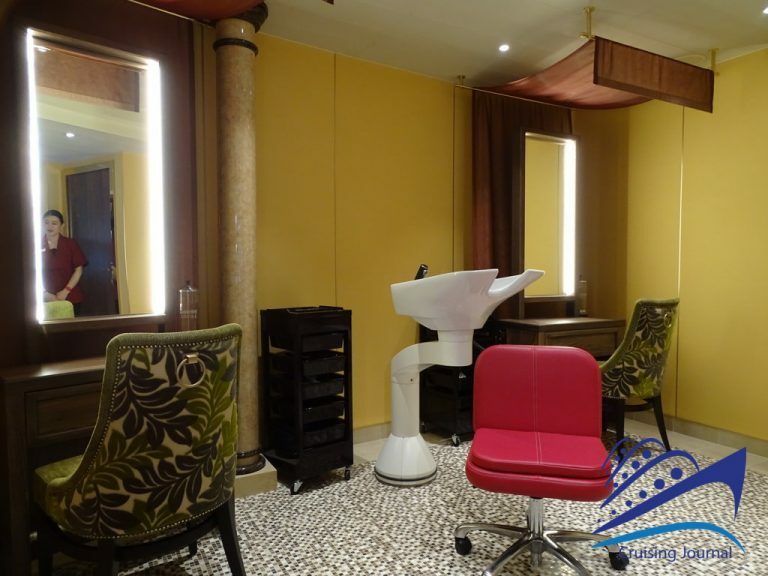 There are two separate areas, one for men and one for women, with sauna, Turkish bath, relaxation area, numerous treatment rooms and a beauty salon. 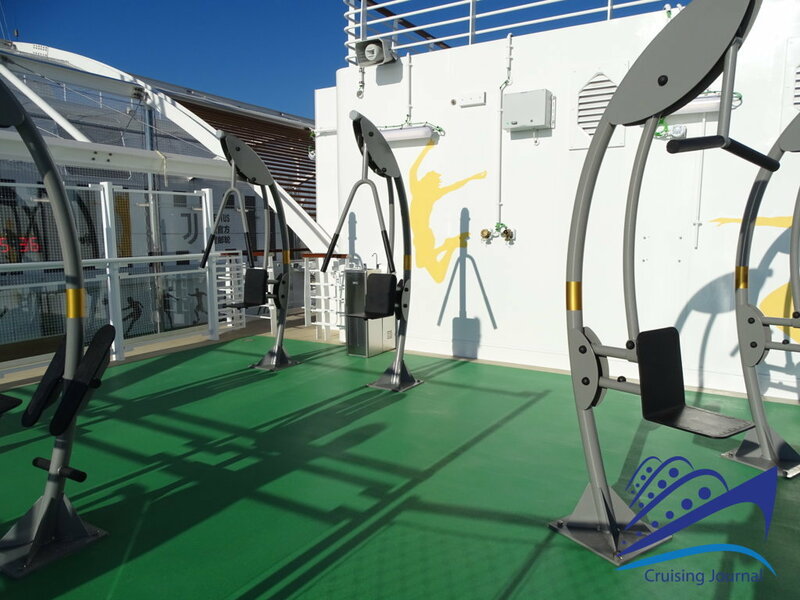 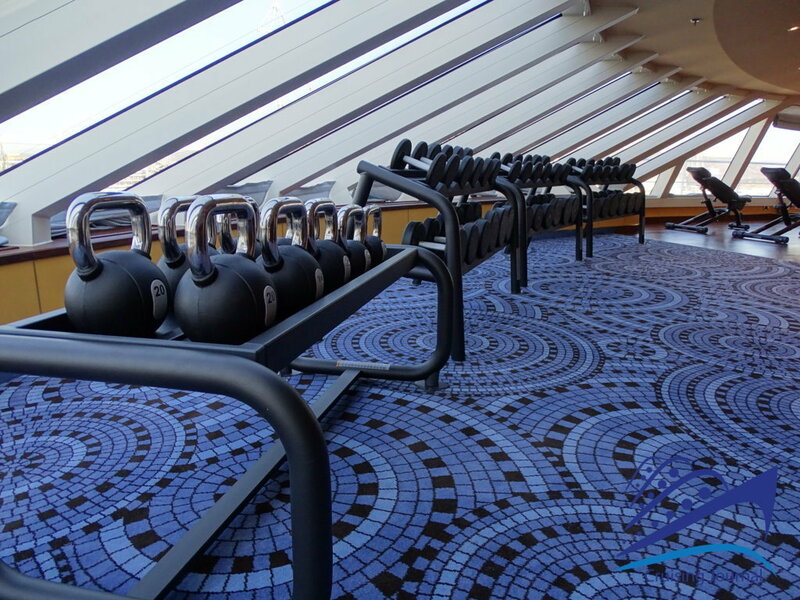 The gym has a beautiful view over the bow and has the most modern equipment. 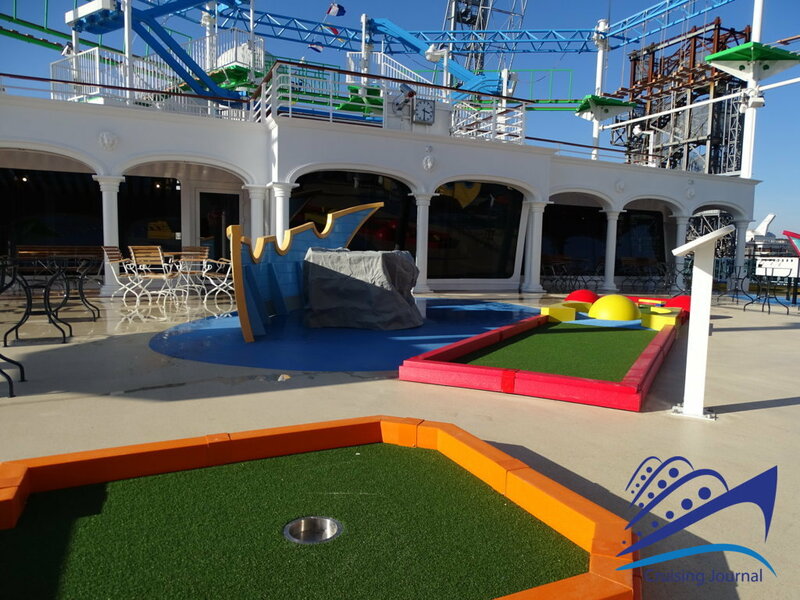 Still on deck 12 are the outside Teen Zone, the Mini Golf and access to the Rope Garden, a series of suspended obstacle courses. 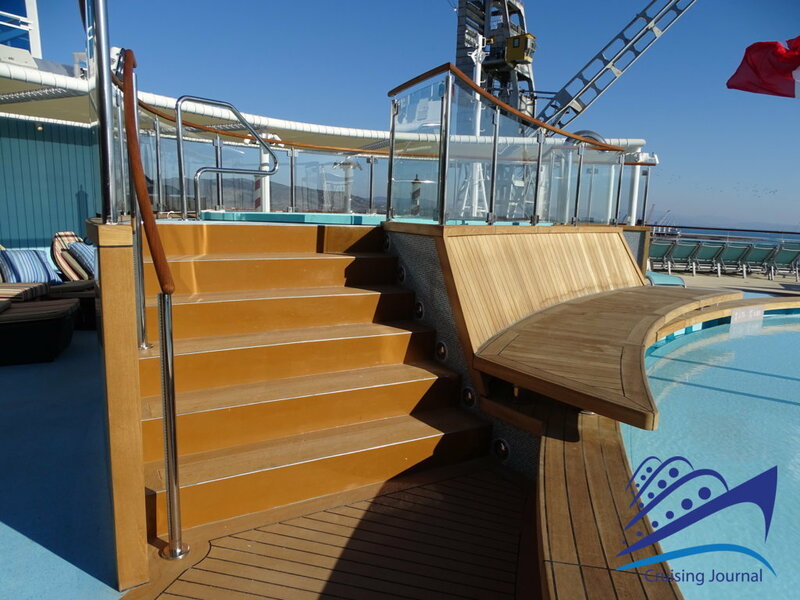 Finally, the bow area of the 14th deck offers the Laguna, an area dedicated to water games and slides. 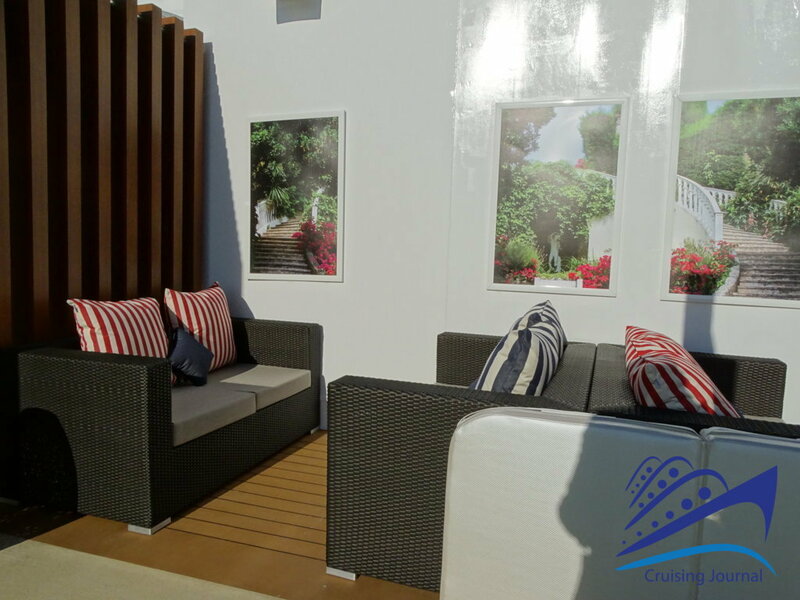 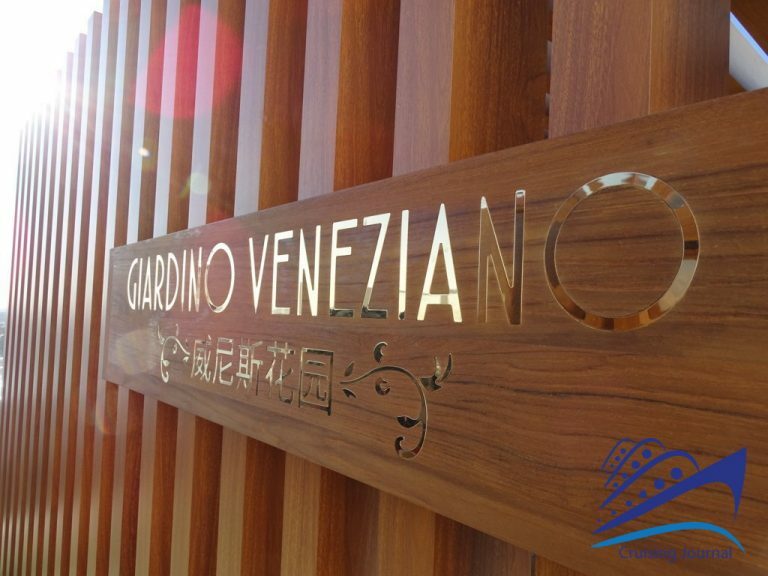 The Giardino Veneziano, also on the bow, is an area of ​​great relaxation. 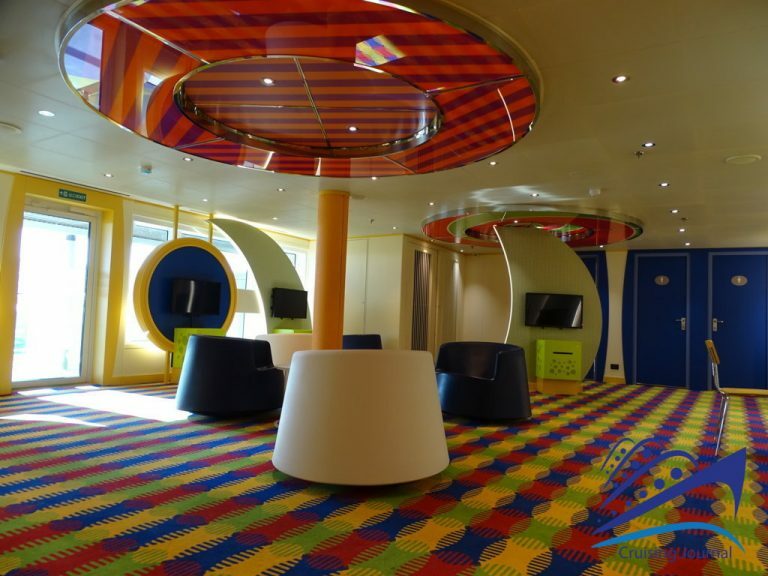 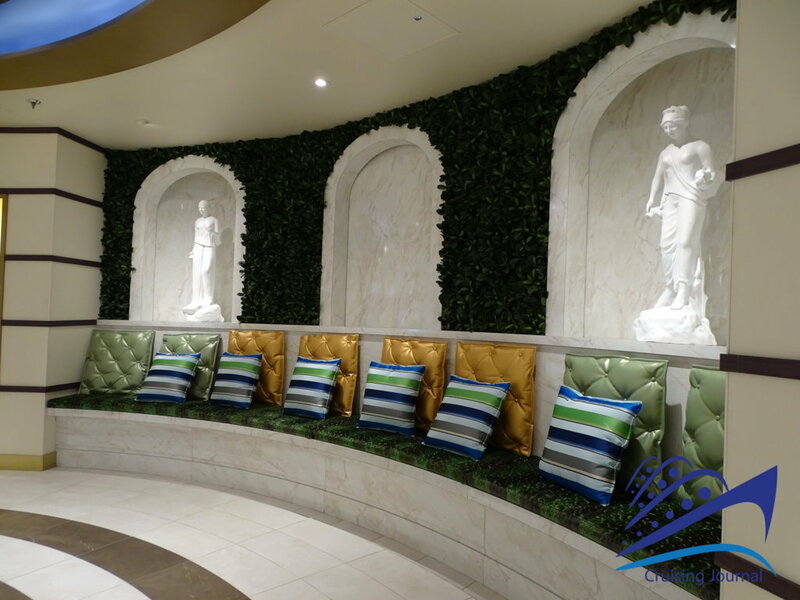 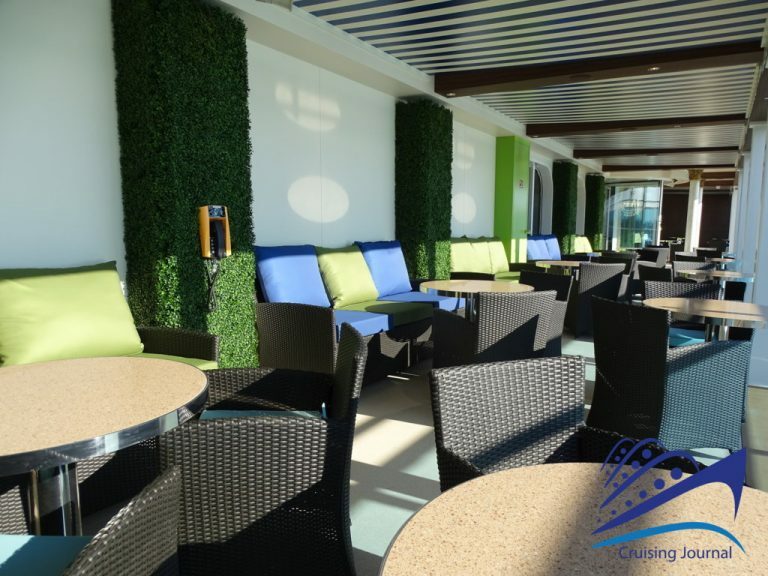 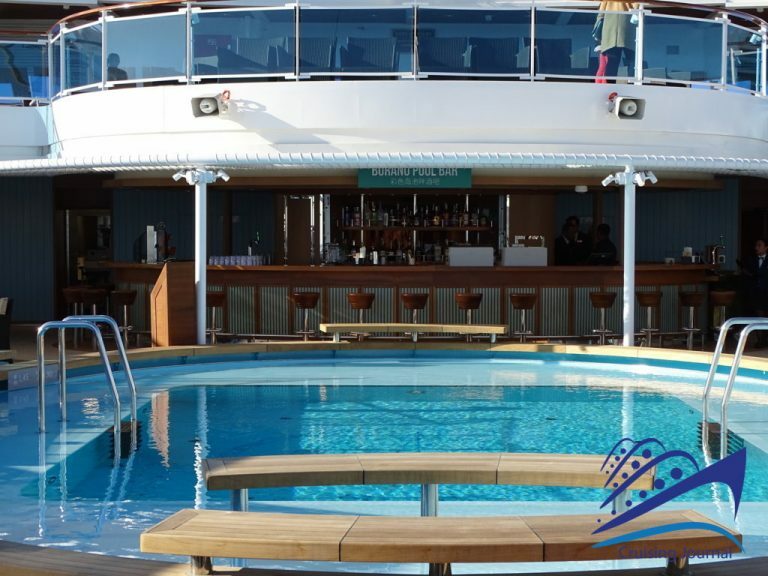 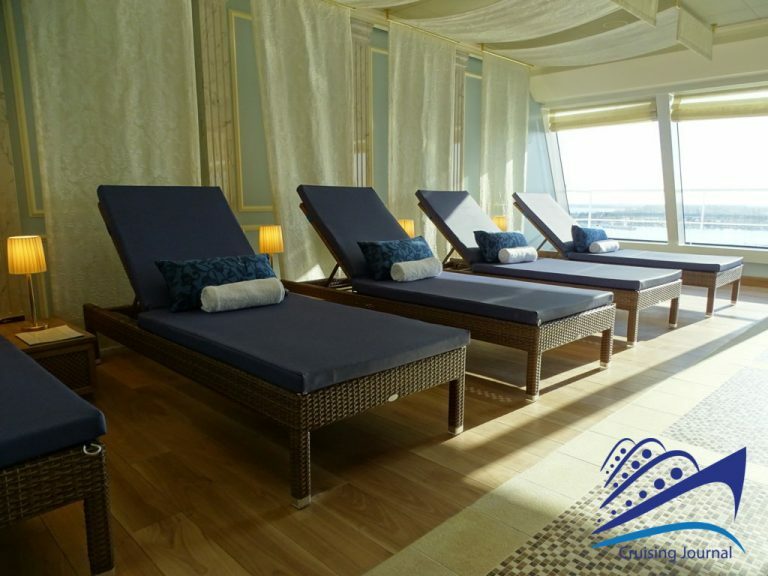 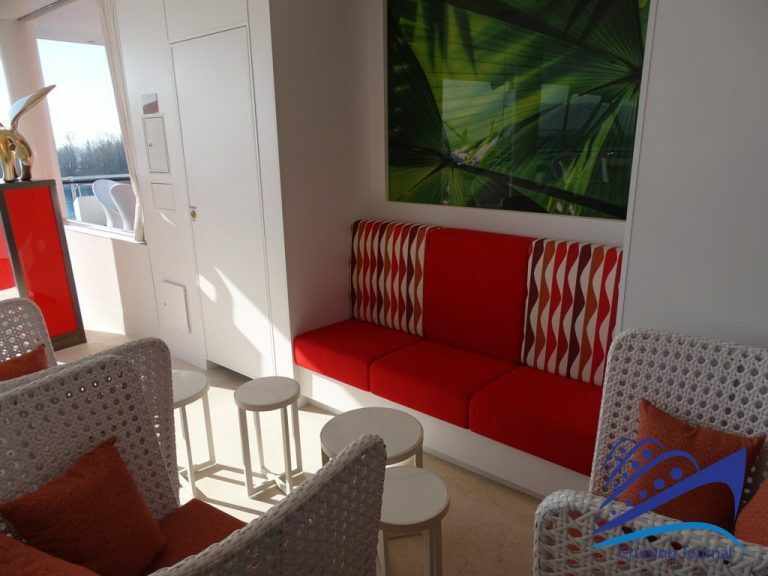 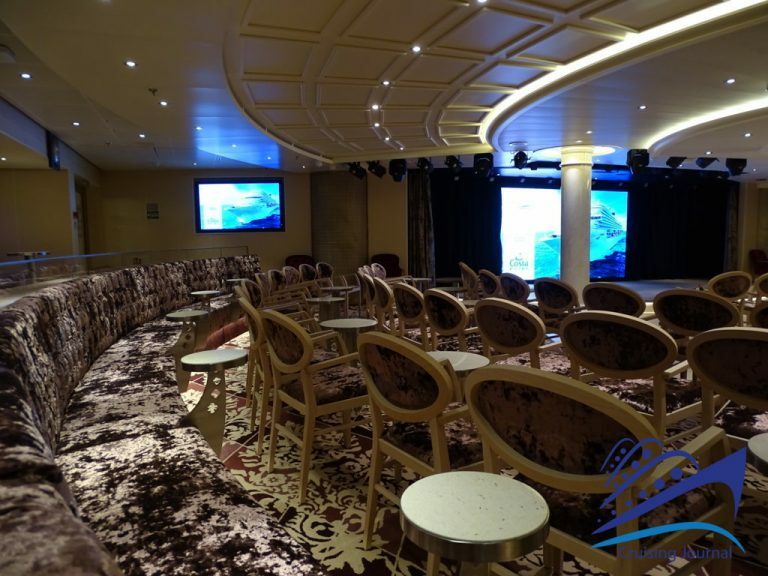 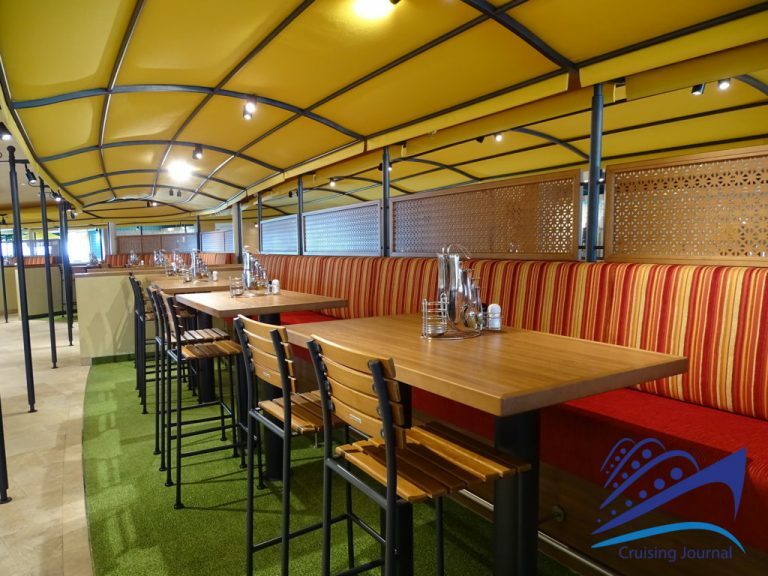 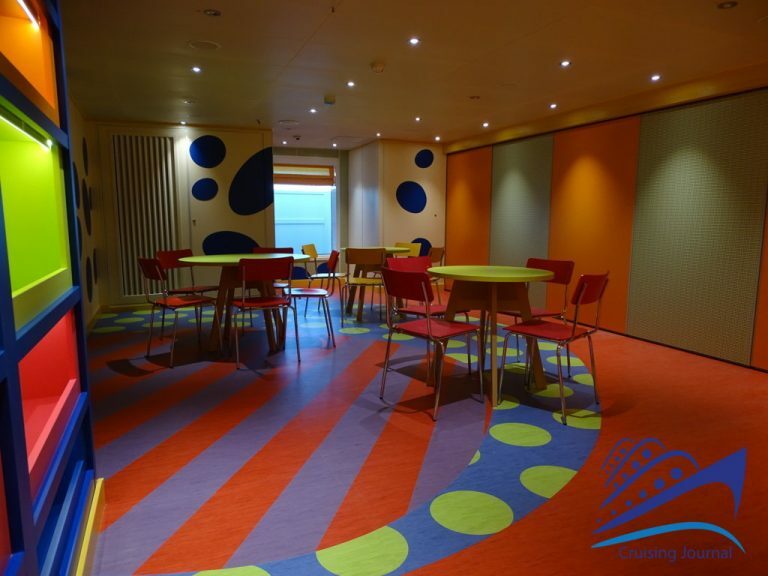 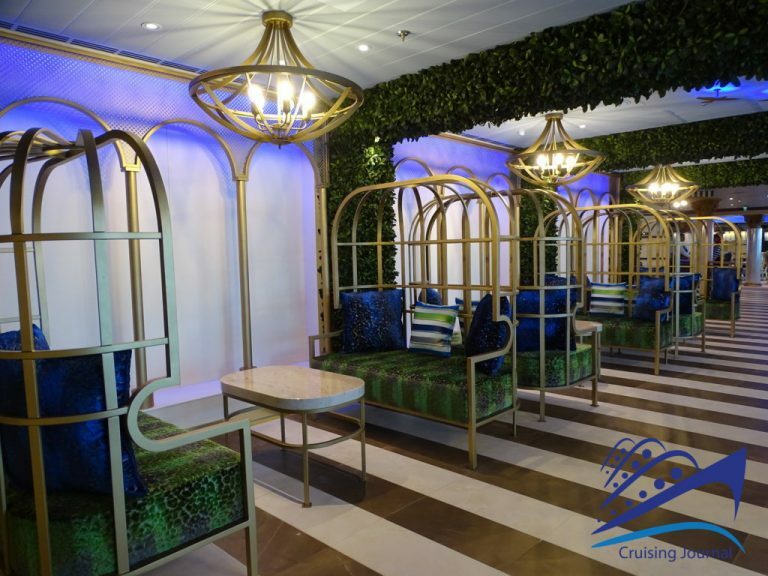 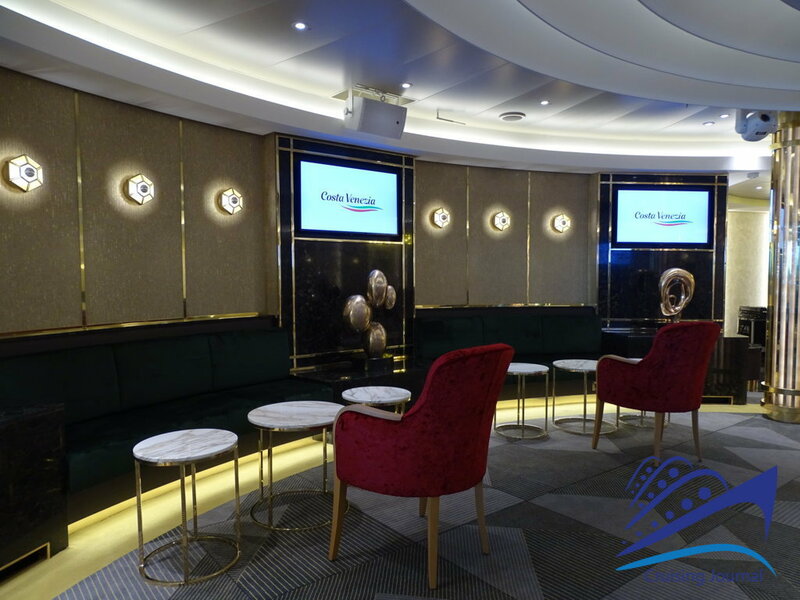 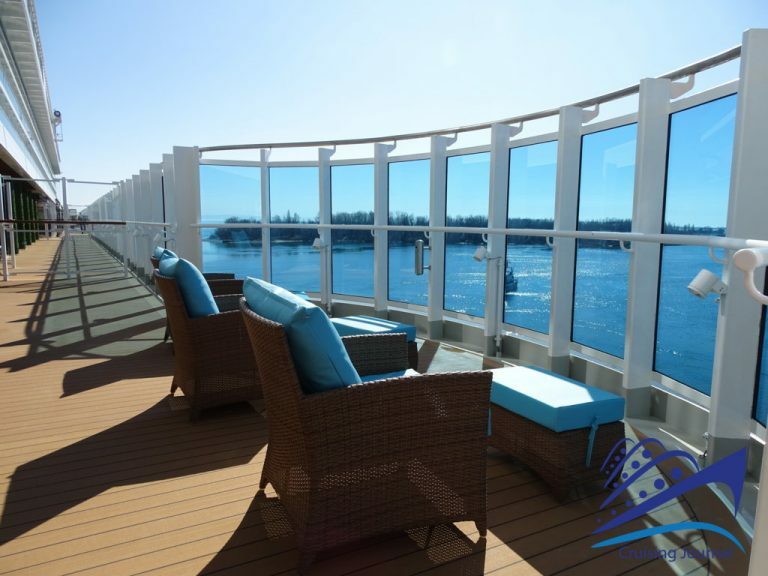 It is the equivalent of the Serenity area on Vista class​​ Carnival ships, and has alcoves, sunbeds, and a bar reserved for those who love silence. Costa Venezia offers numerous possibilities for dining besides the two main classic restaurants Canal Grande and Marco Polo. 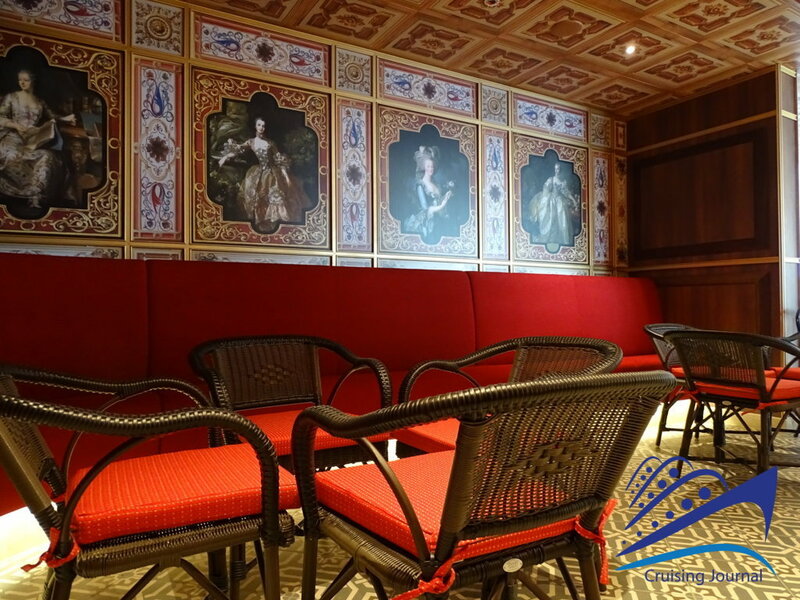 The Venetian inspiration continues at Casanova, an elegant locale at the center of the ship. 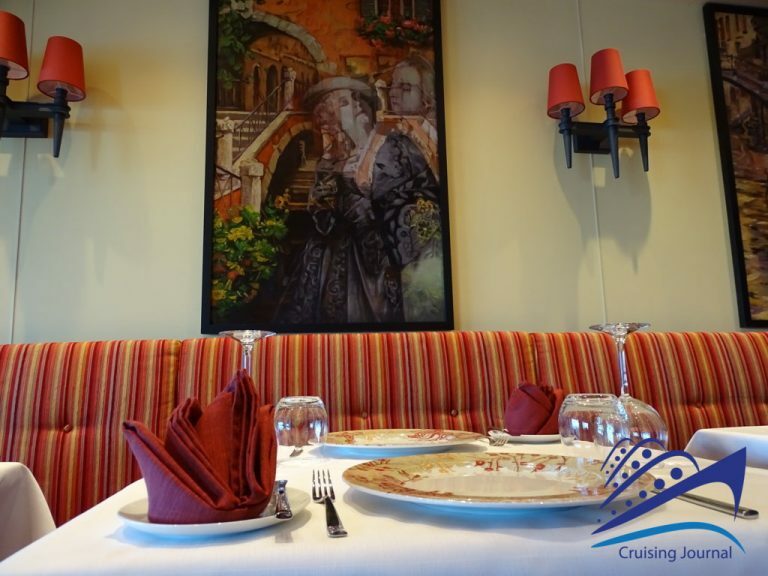 The Frutti di Mare offers fish specialties, which are also based on the Mediterranean cuisine. 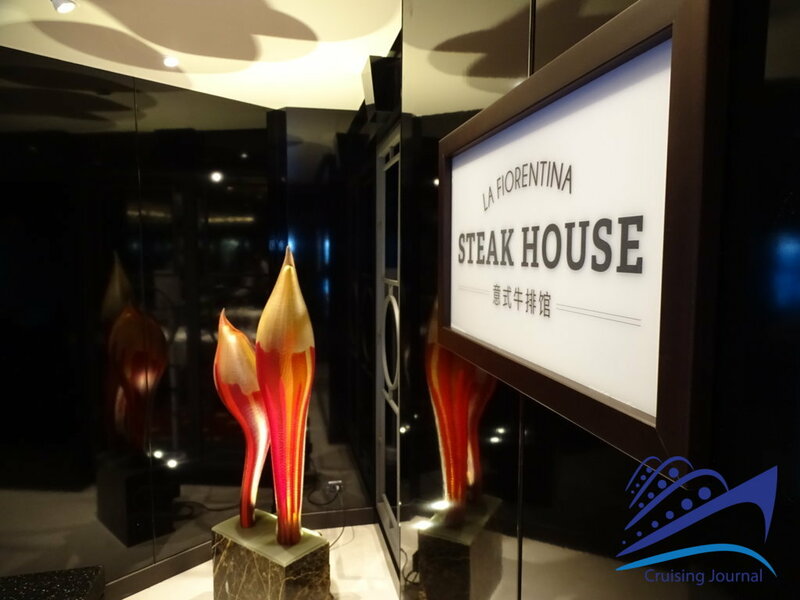 There is also the Steak House, named after the famous Tuscan cut, La Fiorentina, which also offers Italian dishes. 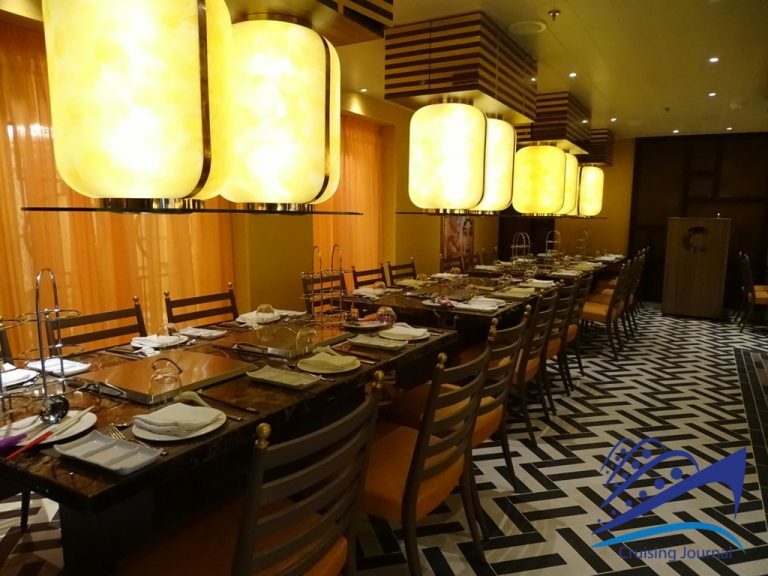 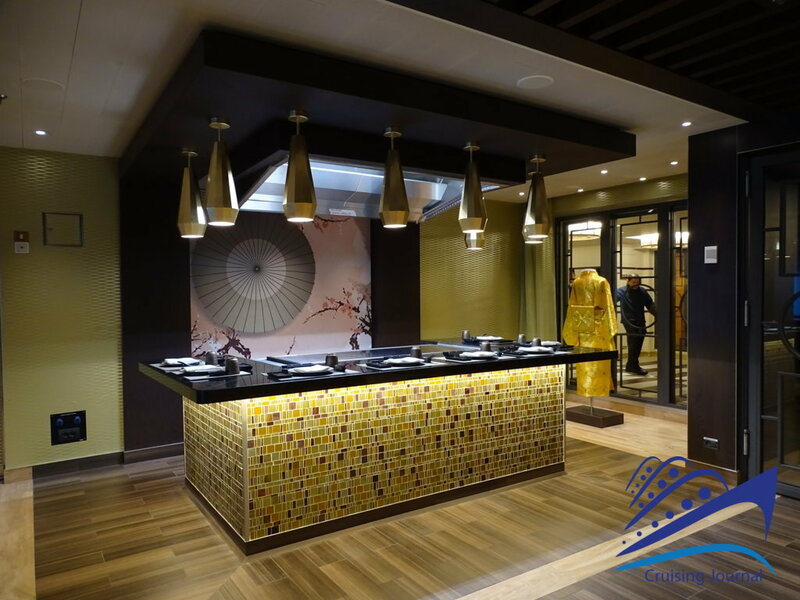 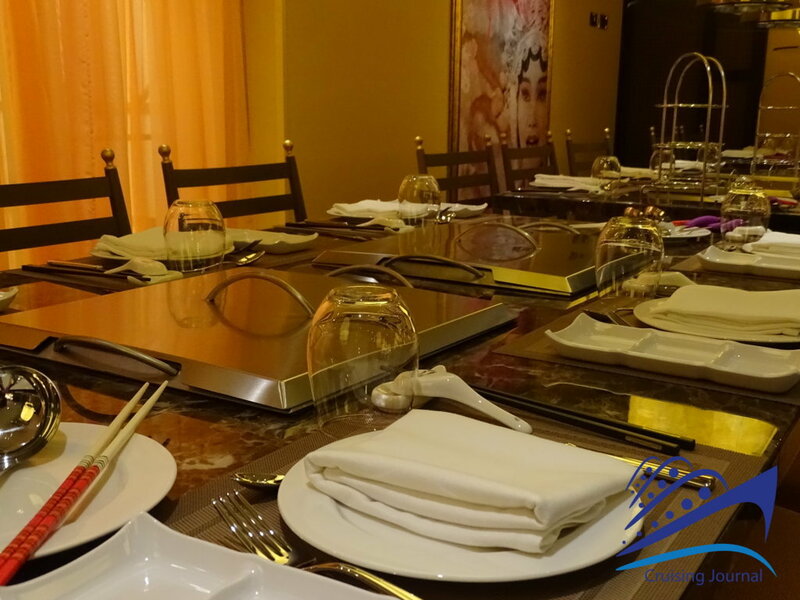 On the other hand, the Teppanyaki has an Asian flavor, which has now become a must-have on newer ships, and the Lu Hot Pot, where cooking is done on hotplates in front of diners, in seating arrangements of just a few guests. 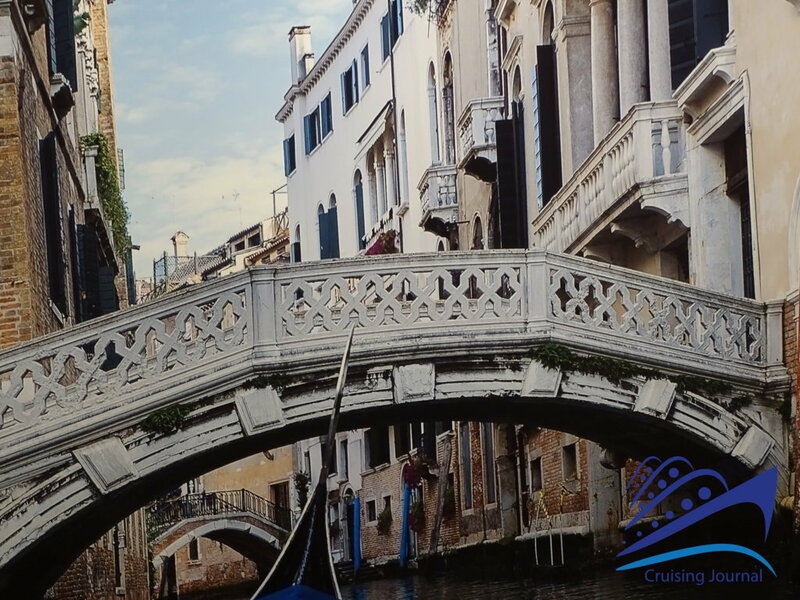 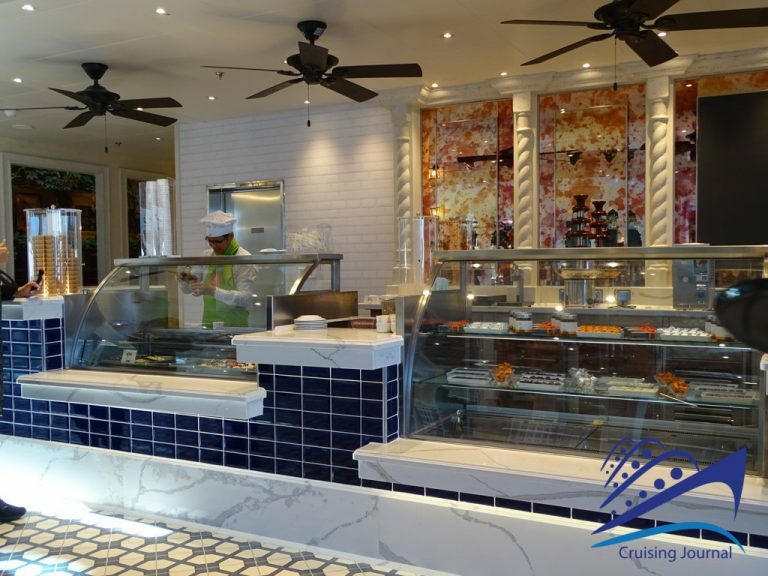 Ice cream, hamburgers, and pizza are all commonplace on cruise ships, so certainly they cannot be missing on board the Costa Venezia that, as far as we are concerned, is not a ship lacking in appeal even for a non-Oriental public. 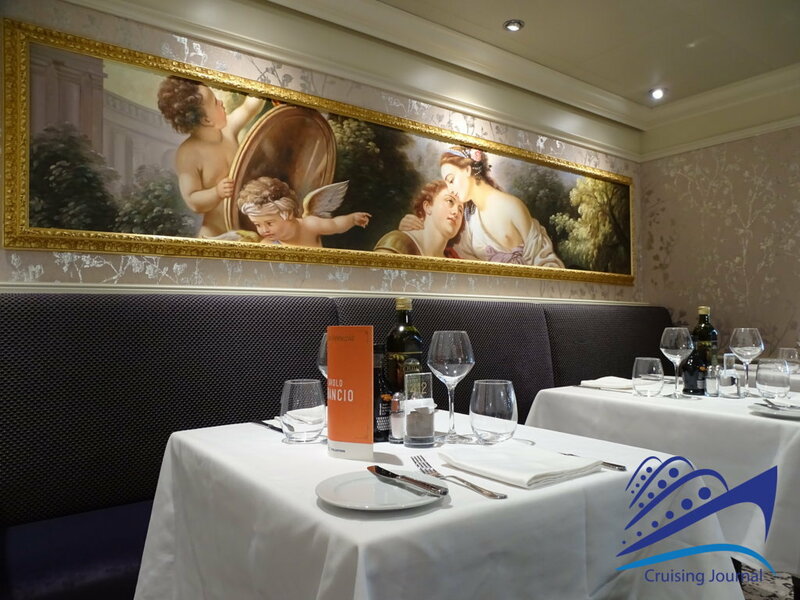 It reminds us of just how pleasant elegant environments can be with a return to a style that, more than its recent predecessors, represents Italian style. 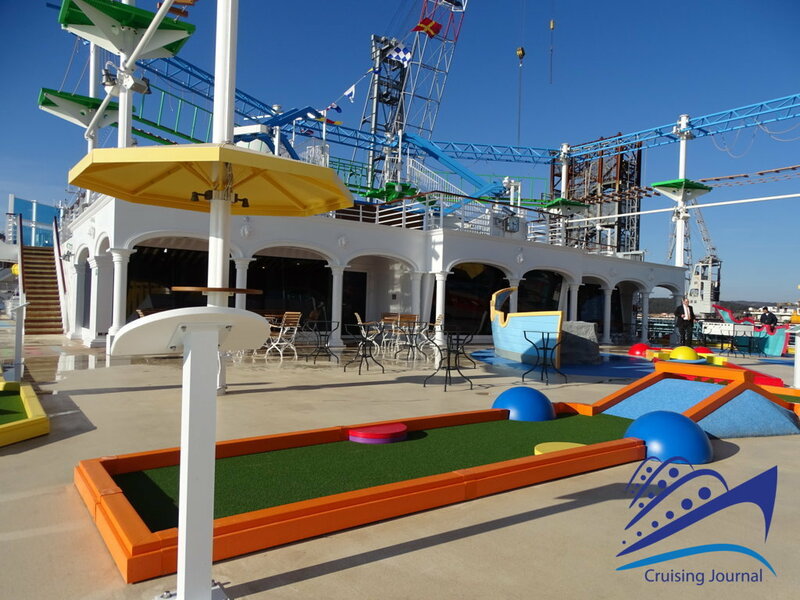 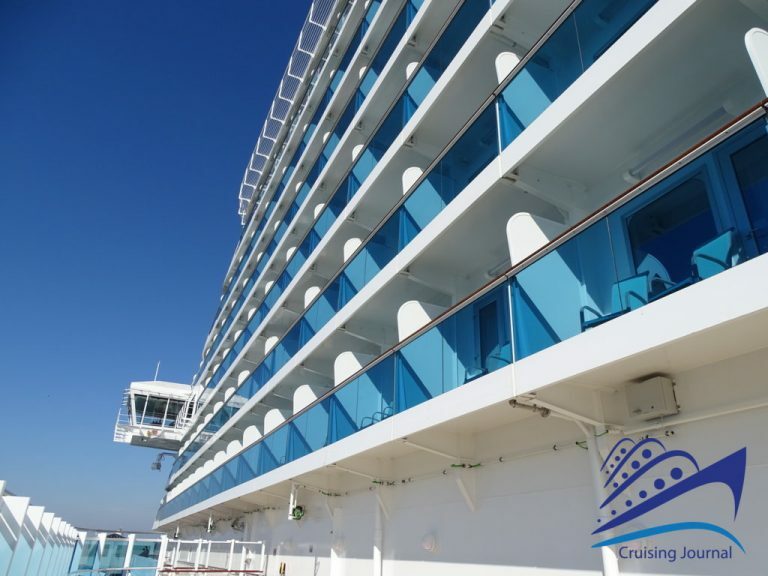 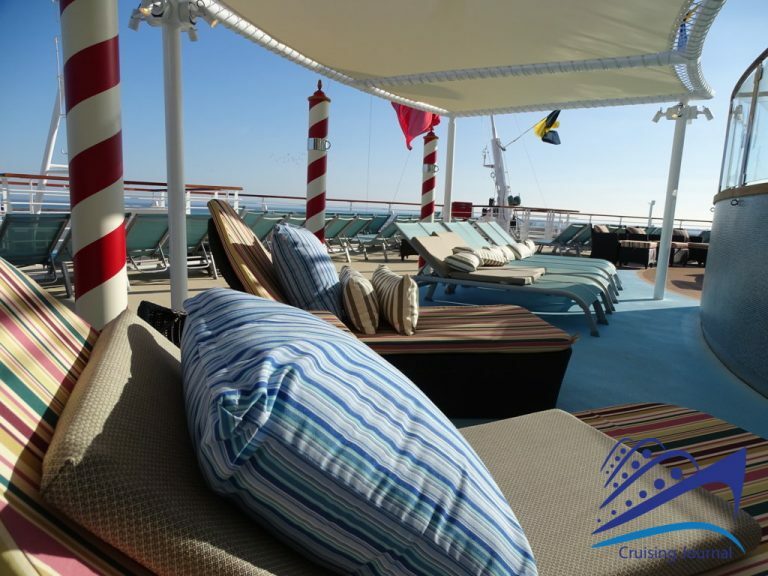 Don’t miss our complete Photo Gallery and cruisers’ Opinions and Reviews!